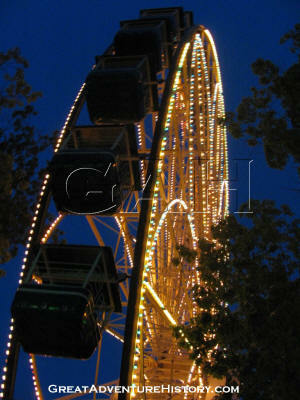 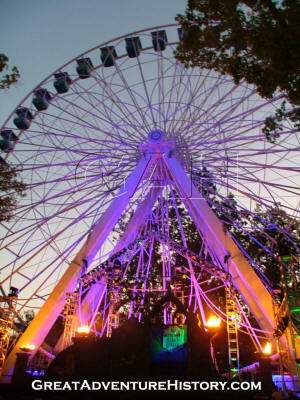 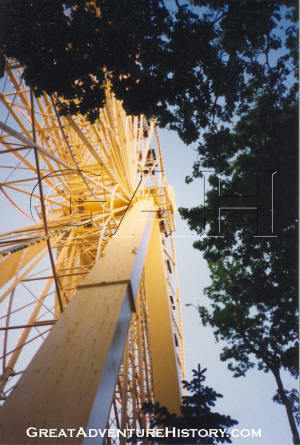 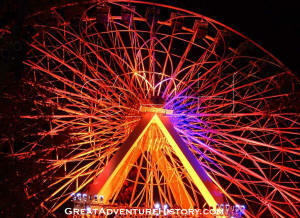 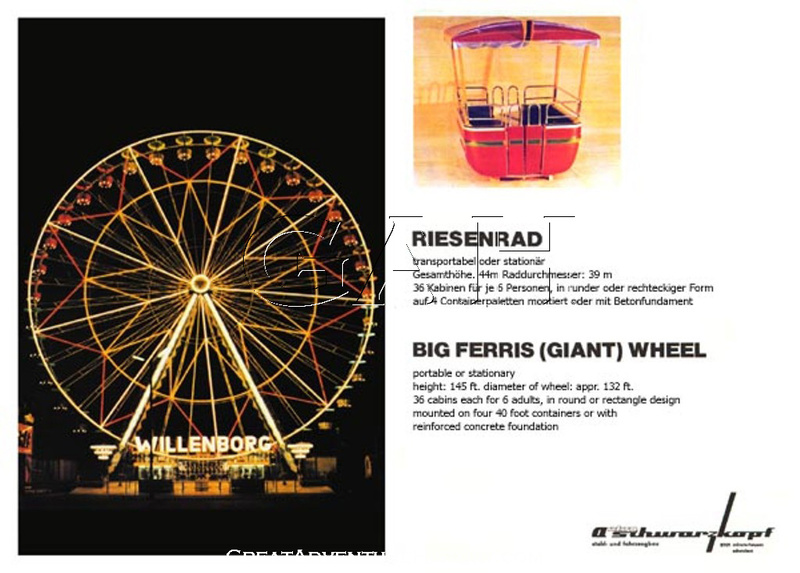 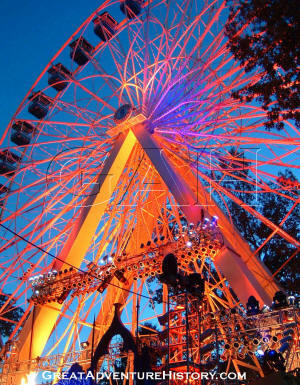 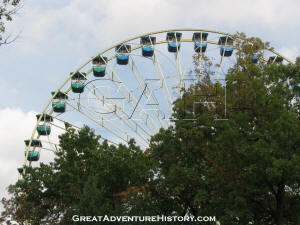 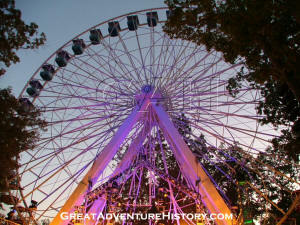 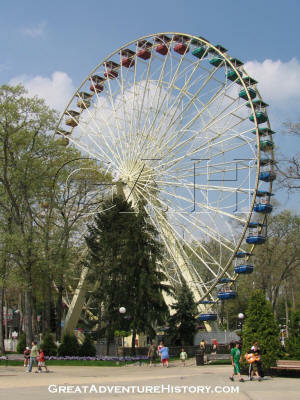 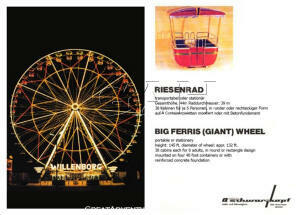 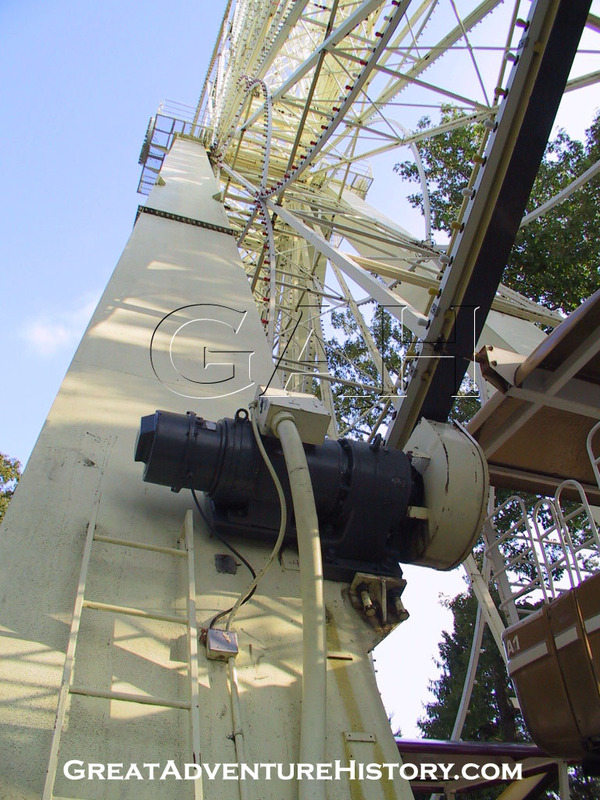 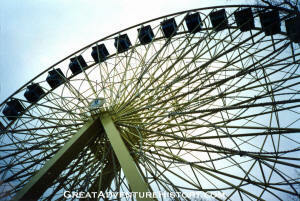 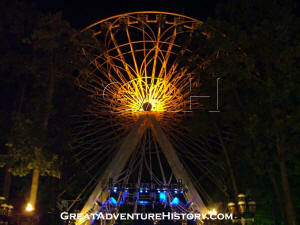 The Giant Wheel is a Schwarzkopf produced 45 meter "Big Ferris (Giant) Wheel". 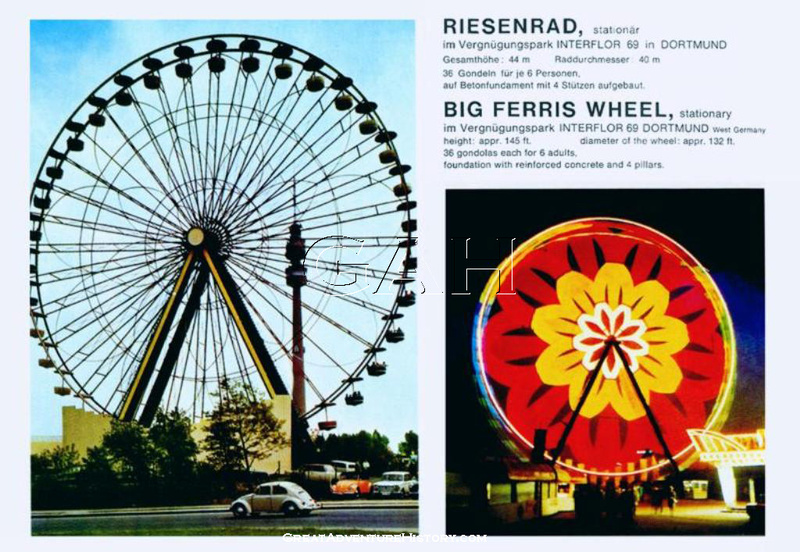 Schwarzkopf was the premier European manufacturer of amusement rides in the 1960's and 1970's, creating many of the ride staples of the fairs, amusement parks and the burgeoning theme parks of the time. 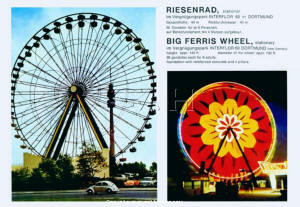 One of the most common of these rides was the giant Ferris Wheel, which Schwarzkopf produce in several sizes, the largest of which was the 45 Meter wheel. 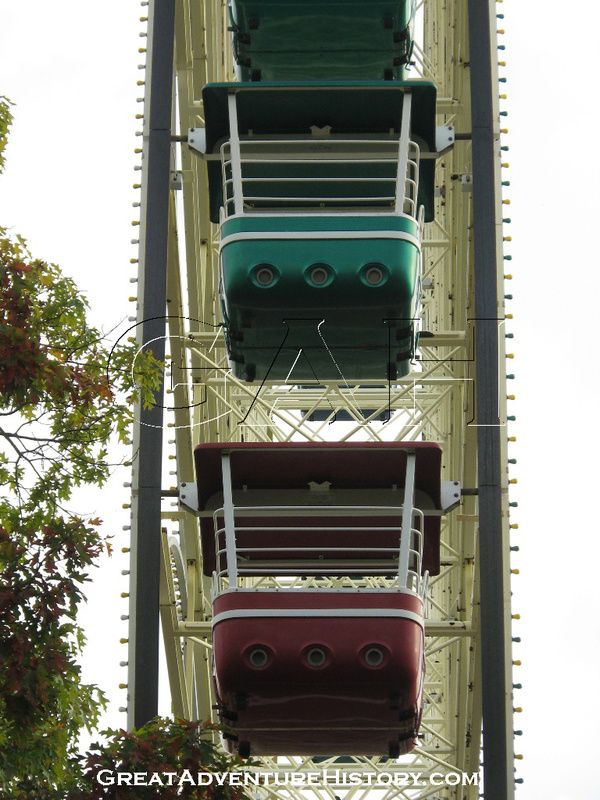 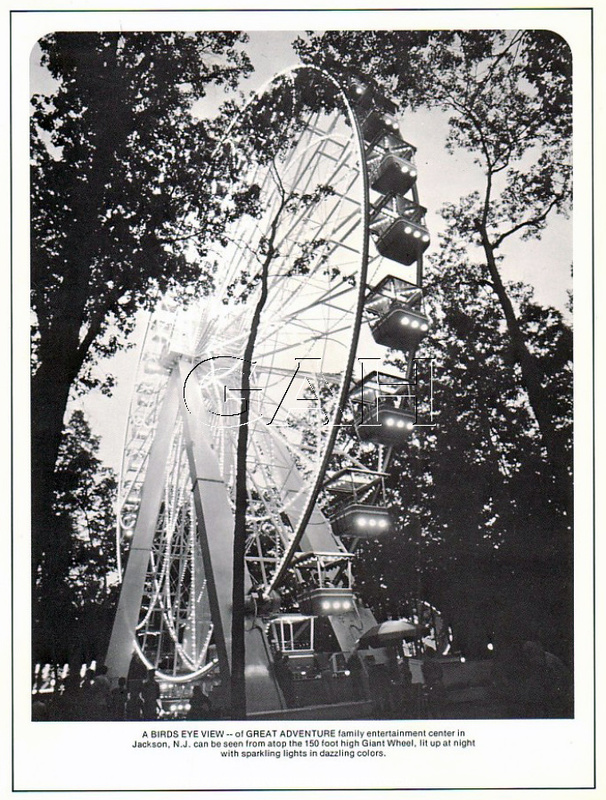 These large Ferris Wheels were the largest available at the time, and the Schwarzkopf company offered these as park models (which required permanent footings) or portable models which were designed for use on the fair circuits, and utilized large steel frames so they could be erected anywhere. 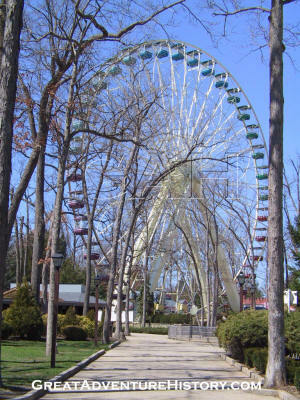 With the demise of the Schwarzkopf Company in the 1980's, the rides have begun to disappear from parks as parts have become scarce and maintenance becomes more costly, but the remaining rides like the Big Wheel are considered classics by enthusiasts, and have offered years of rides and memories to generations of park-goers. 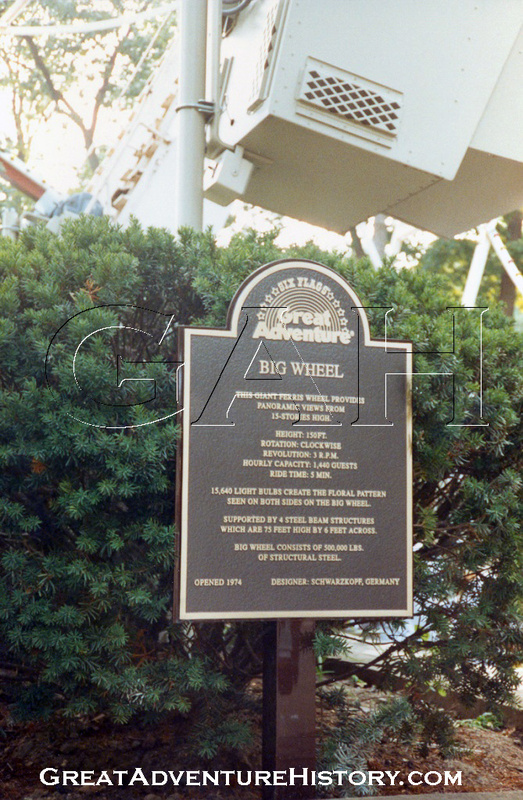 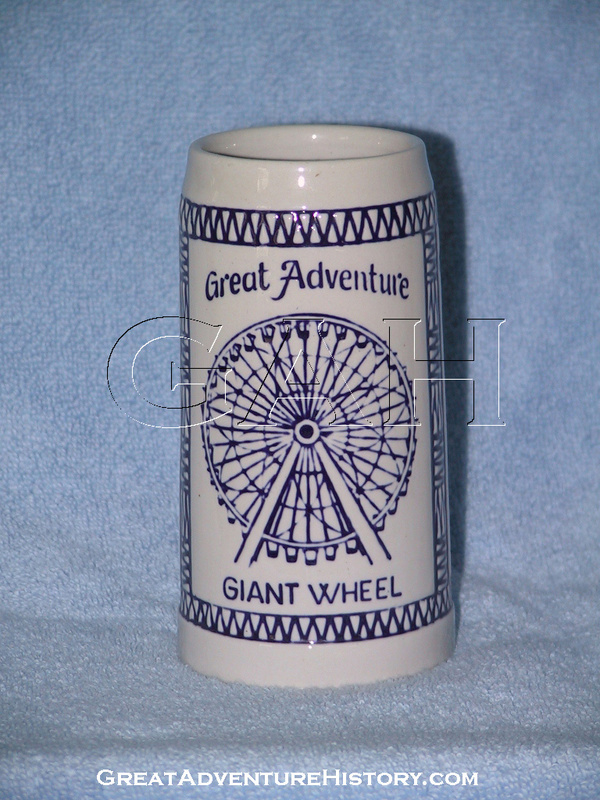 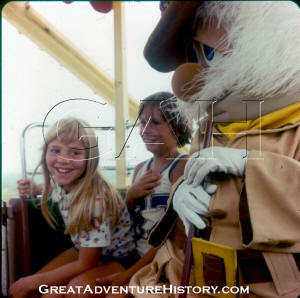 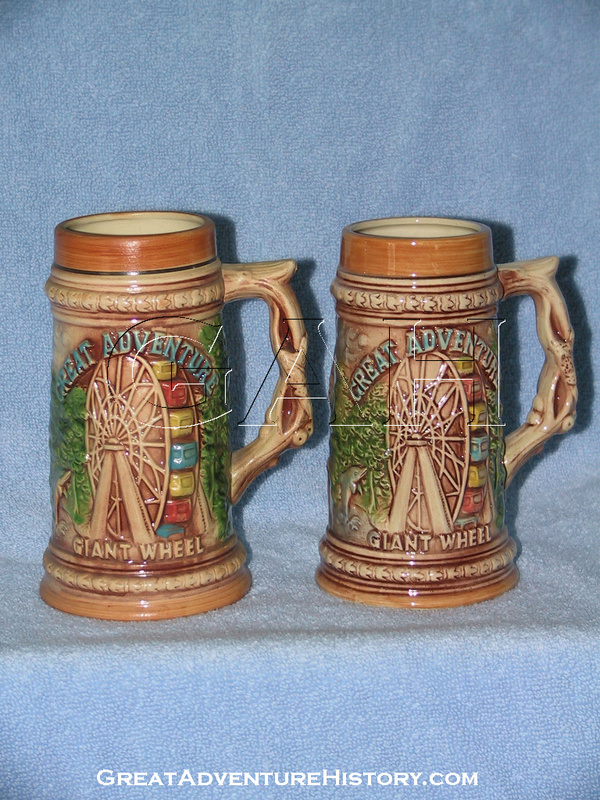 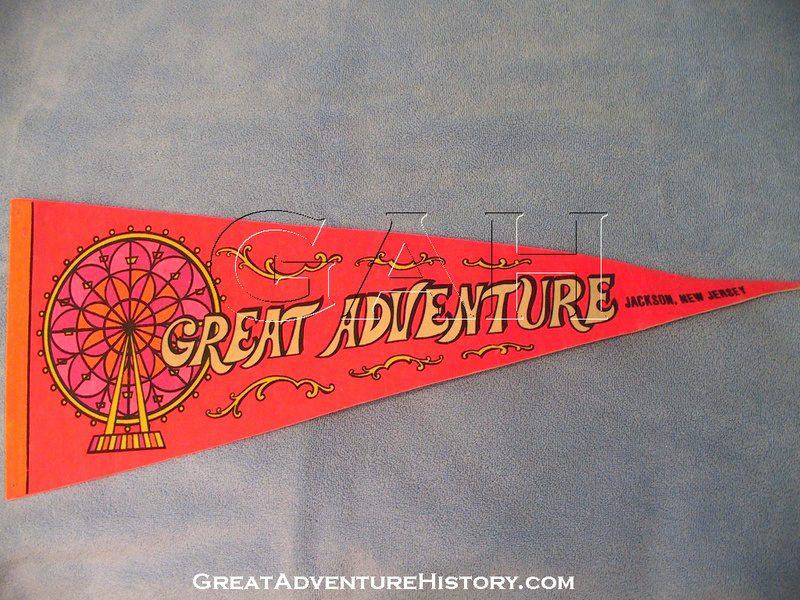 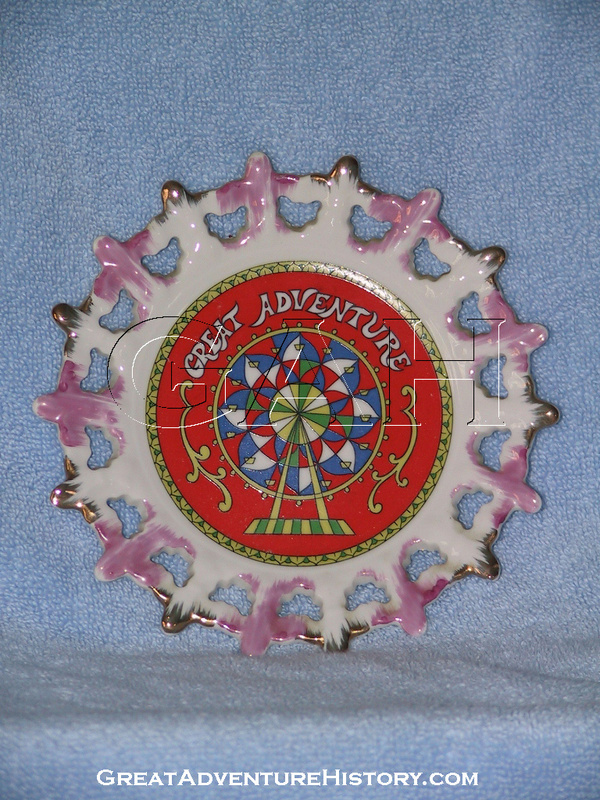 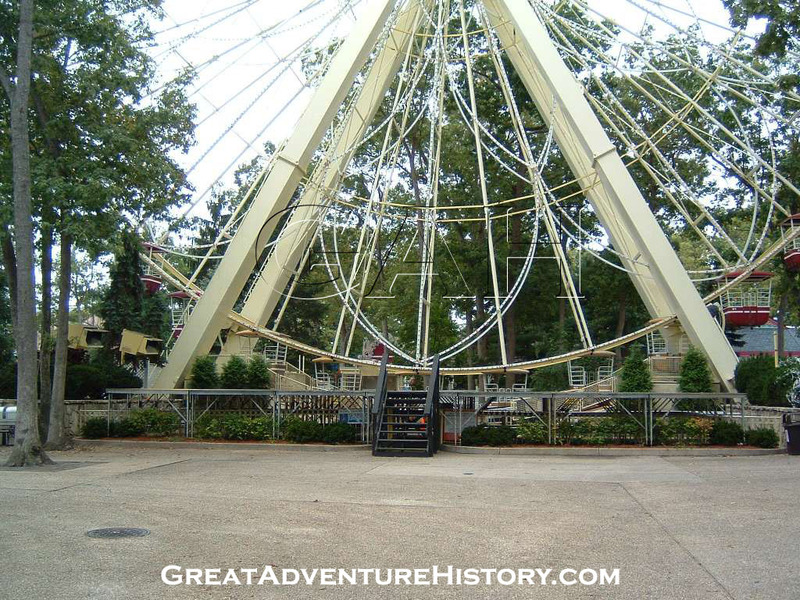 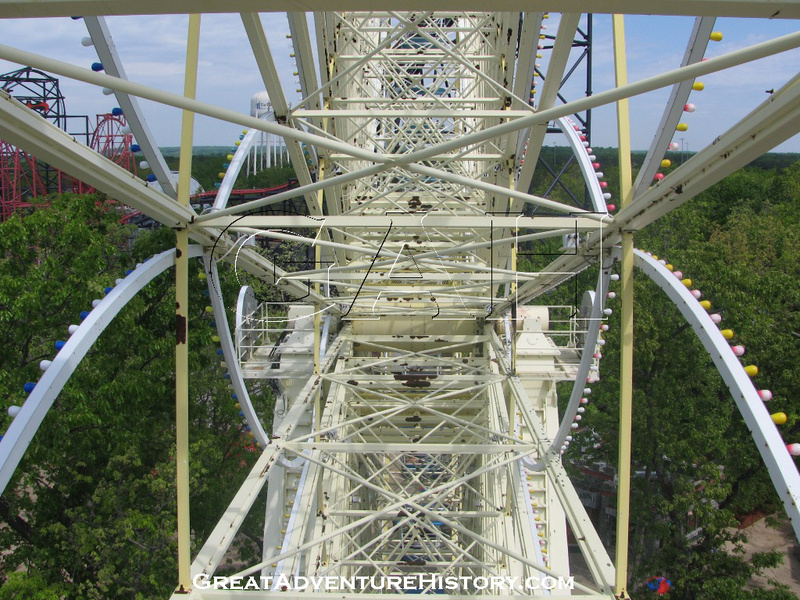 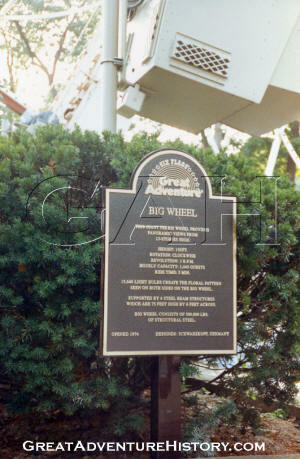 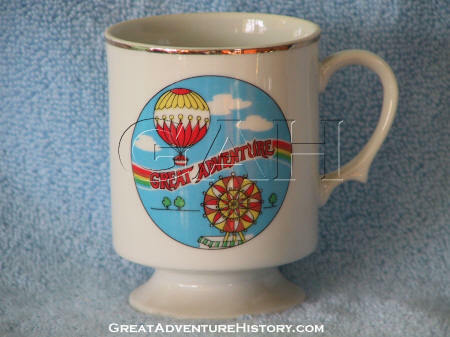 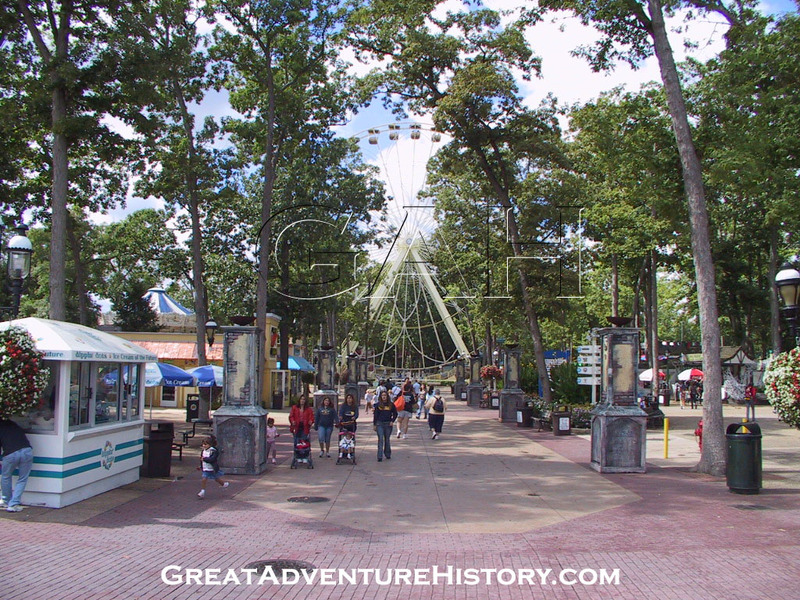 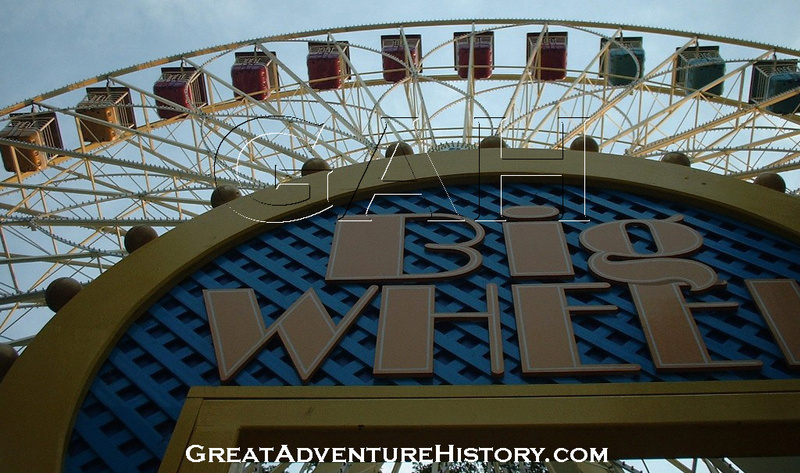 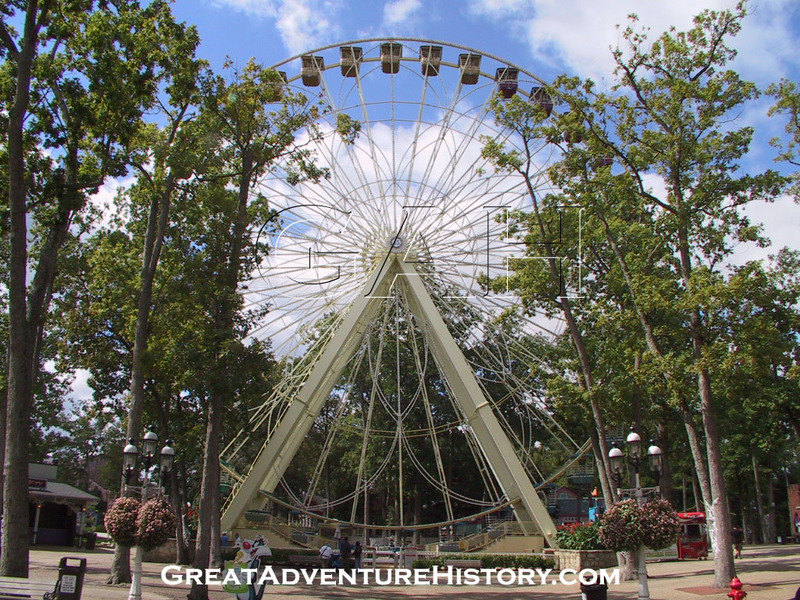 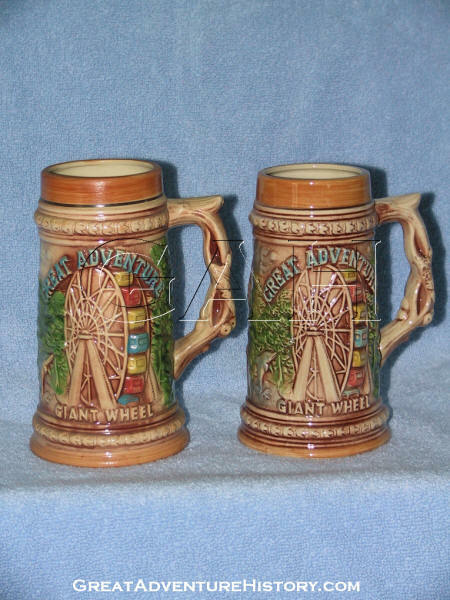 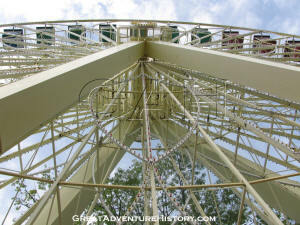 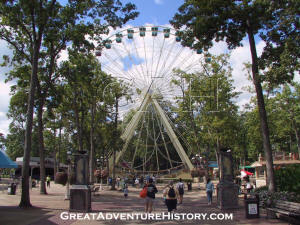 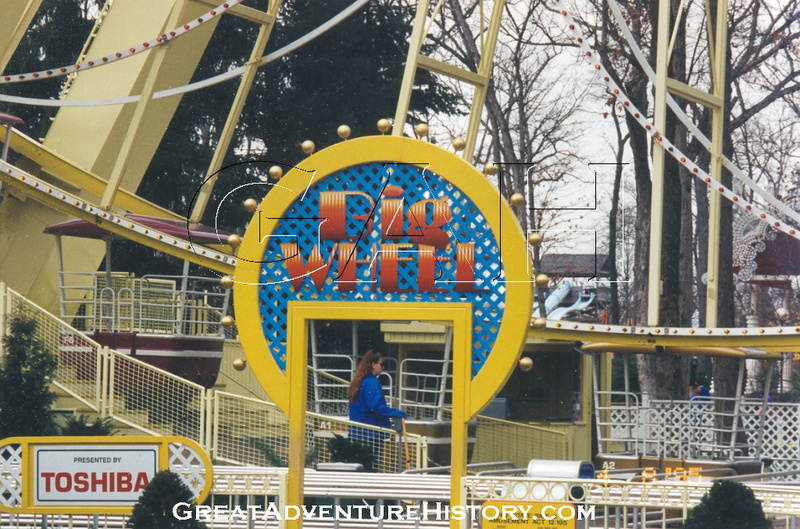 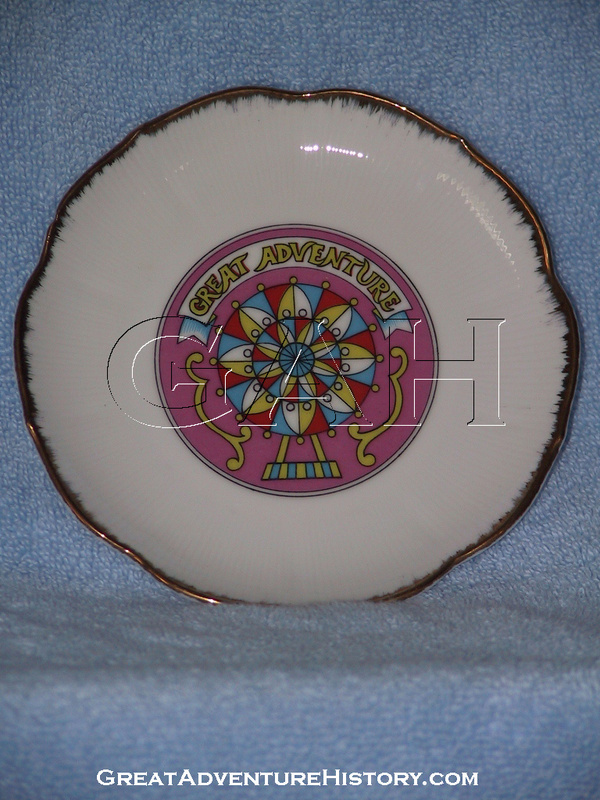 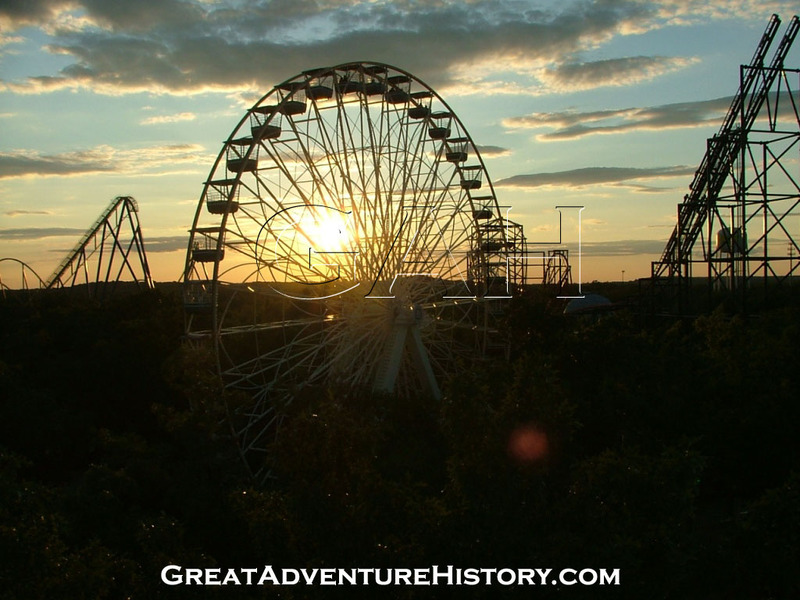 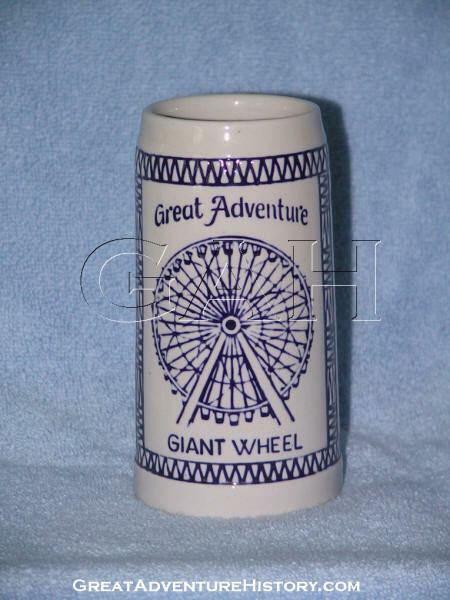 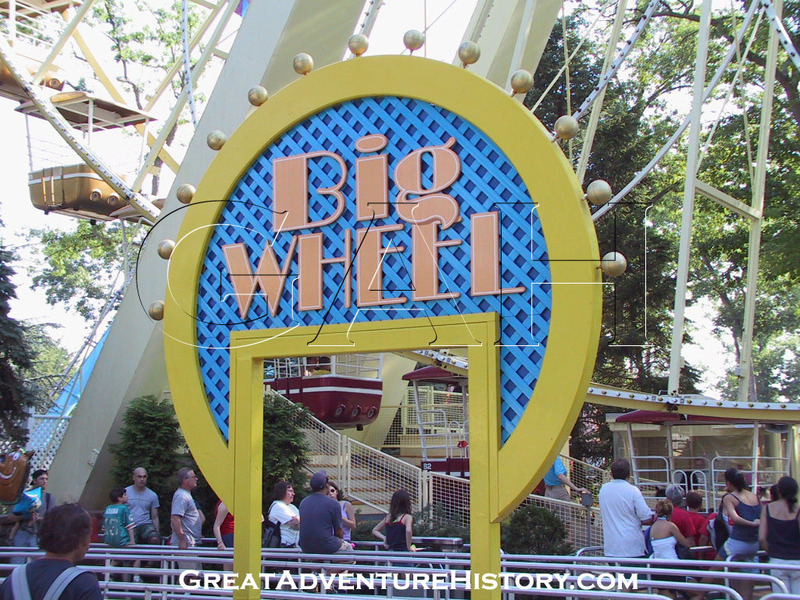 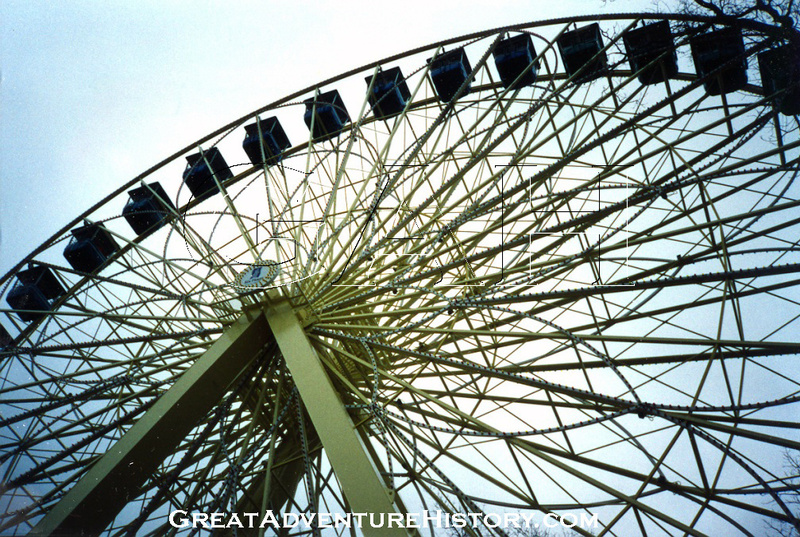 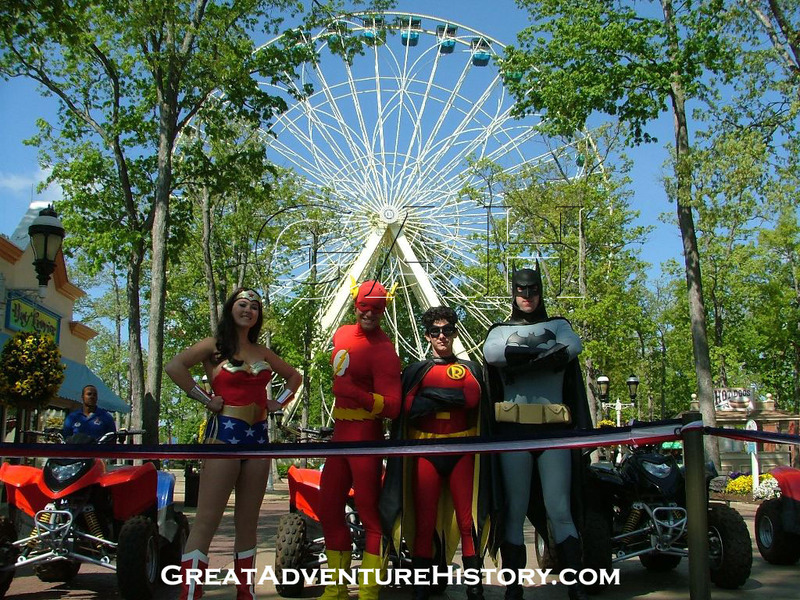 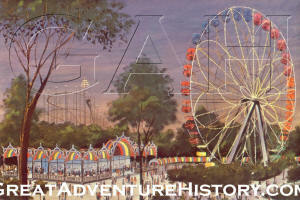 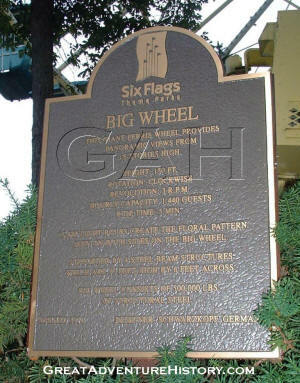 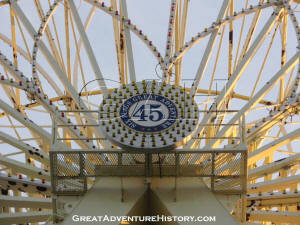 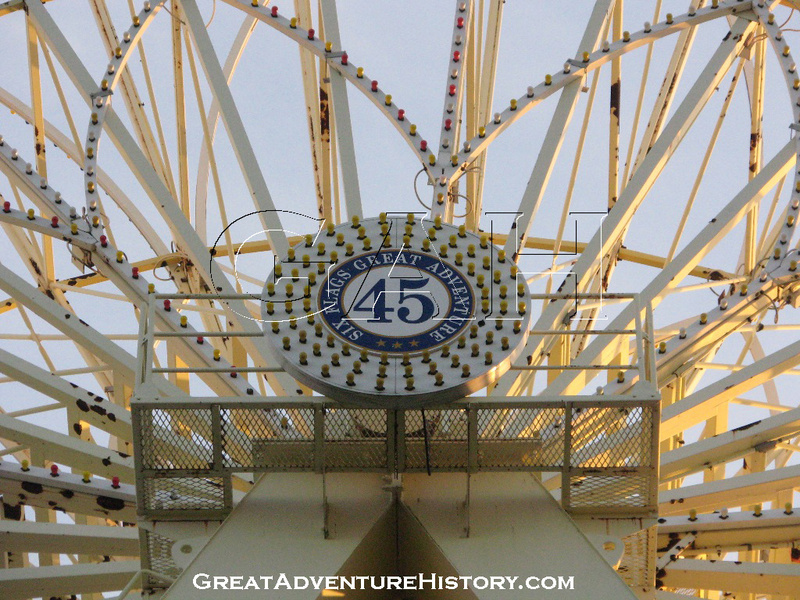 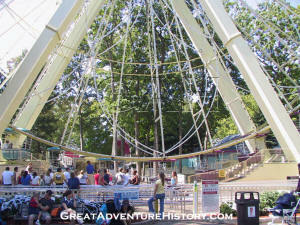 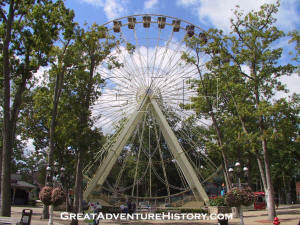 The Giant Wheel opened with the park in July of 1974, as one of the many "world's largest" attractions that Great Adventure promoted. 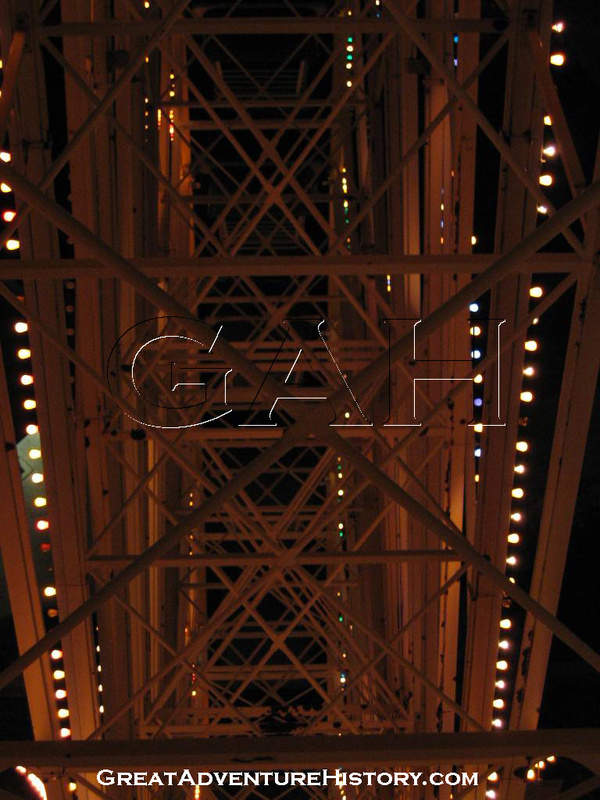 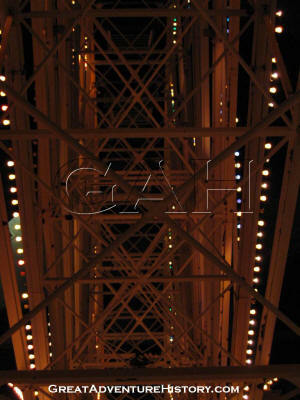 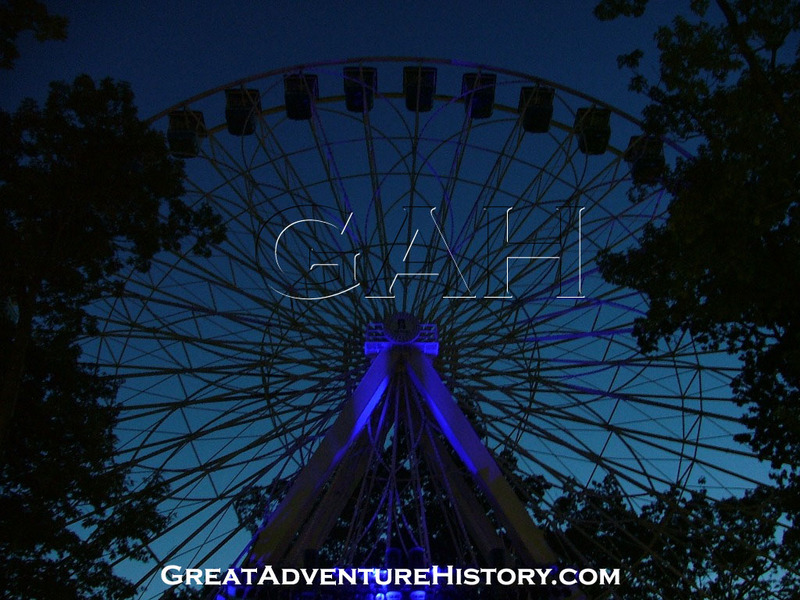 At 45 meters tall, it was one of the tallest Ferris Wheels in the world at the time (actually sharing the honor with its fellow production model Schwarzkopf wheels found around the world). 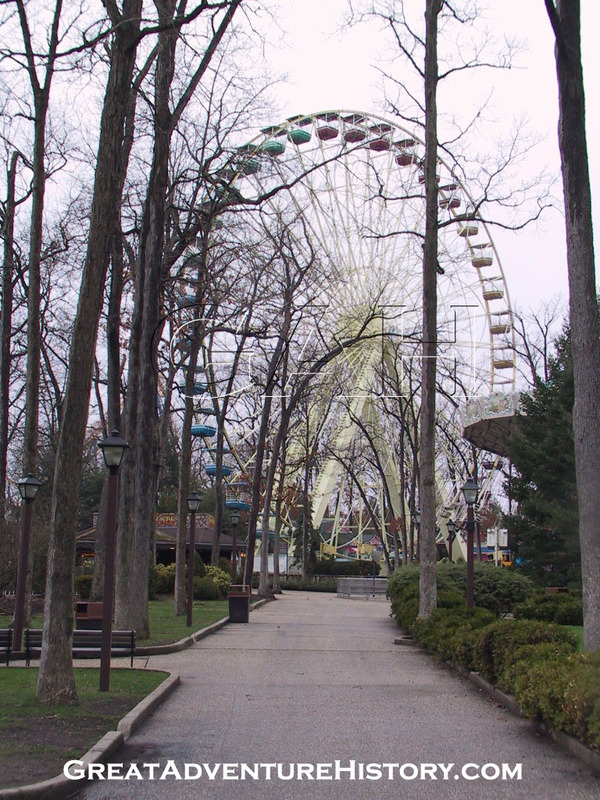 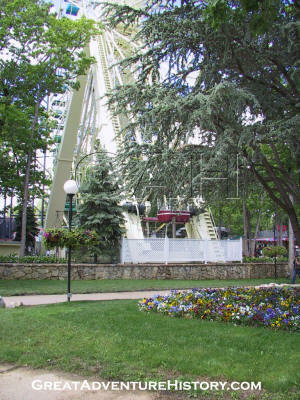 The Giant Wheel was positioned at the far end of Dream Street as seen from the Park's original Front Gate which was located at the opposite end of the street. 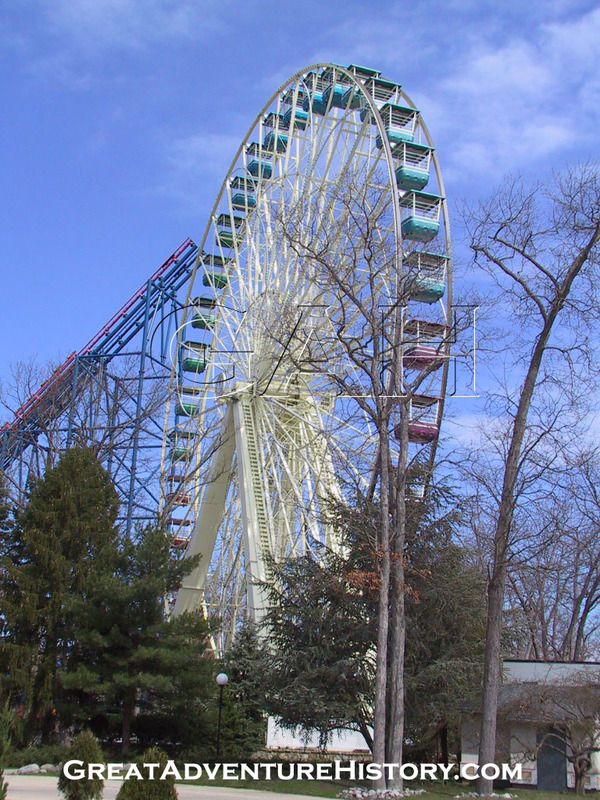 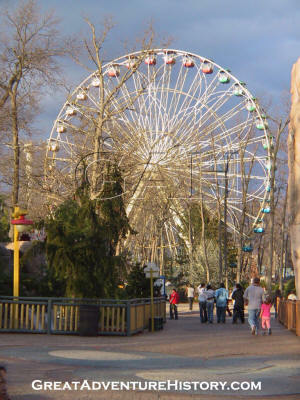 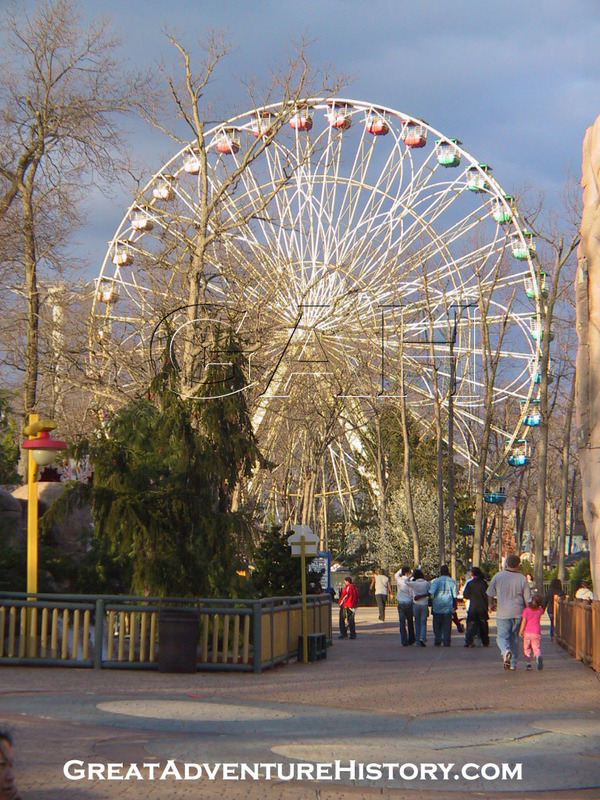 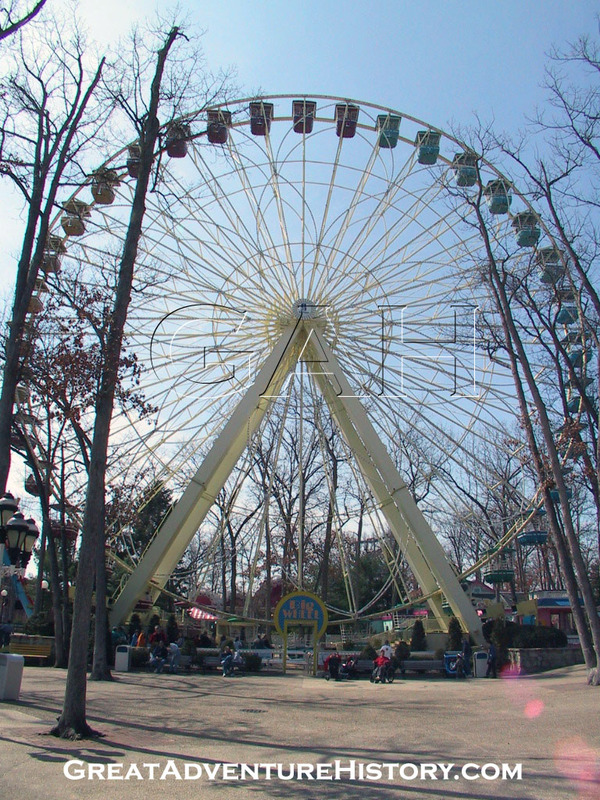 The Giant Wheel's placement centered on the axis of the park was designed to draw guests into the park. 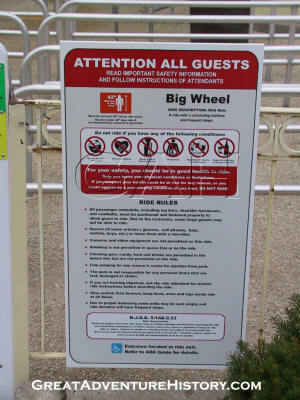 Theme park designers often place large attractions that draw guest attention like this at the far reaches of a park or a section of a park with the intention of drawing guests in, past the other attractions along the way. 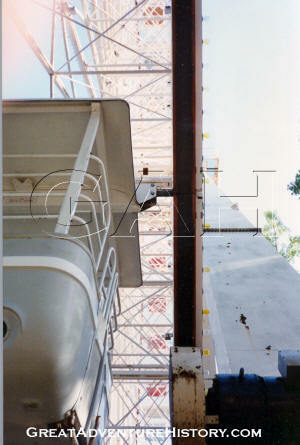 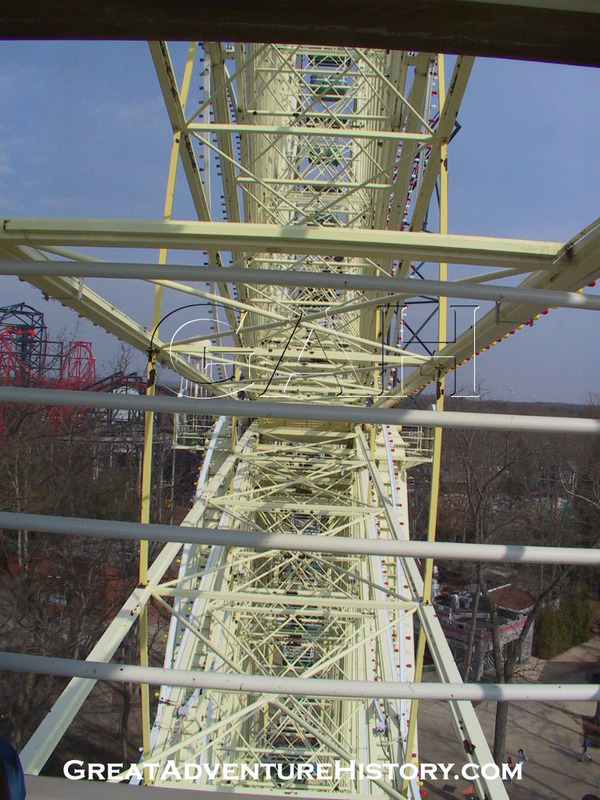 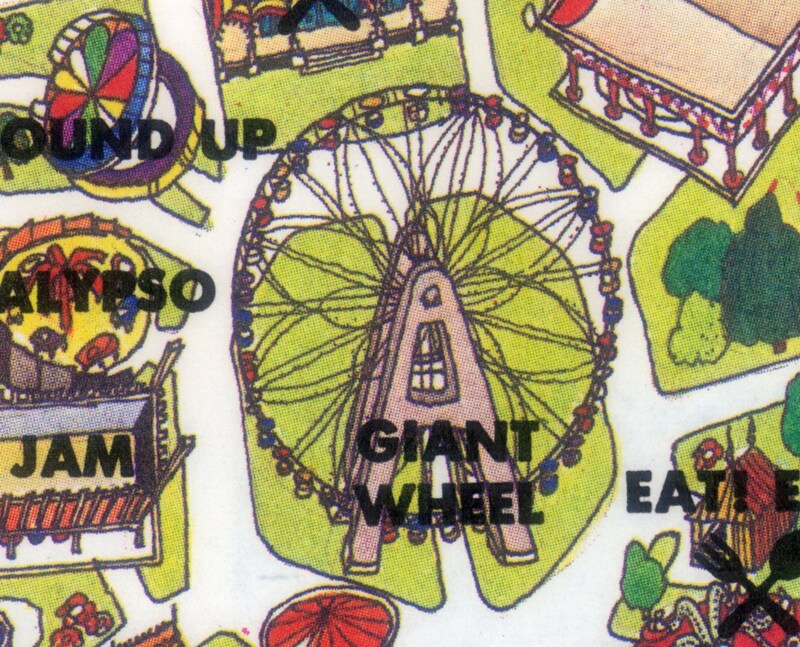 These visual draws are known in the park industry as "weenies", and for many parks a large Ferris Wheel or observation tower functions as this visual anchor. The Giant Wheel was purchased used from the Holland Tulip Festival in the Netherlands where it had served as the centerpiece of the fair. 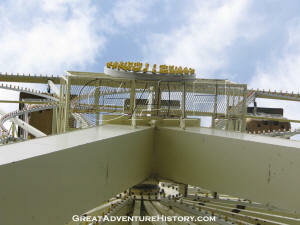 The ride then made its way across the Atlantic to serve as the centerpiece of the new park. 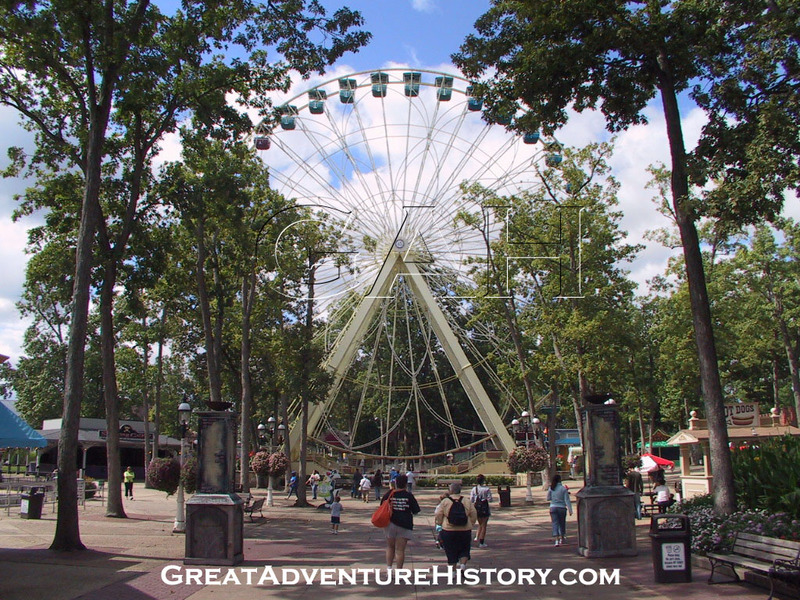 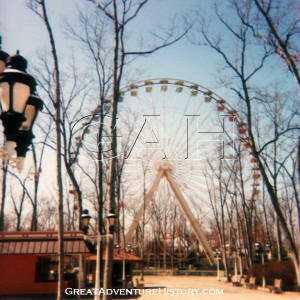 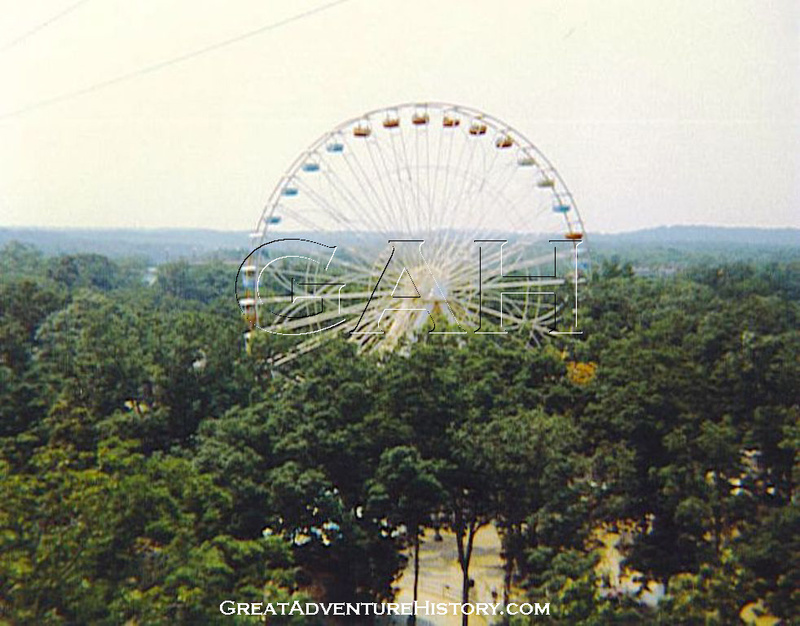 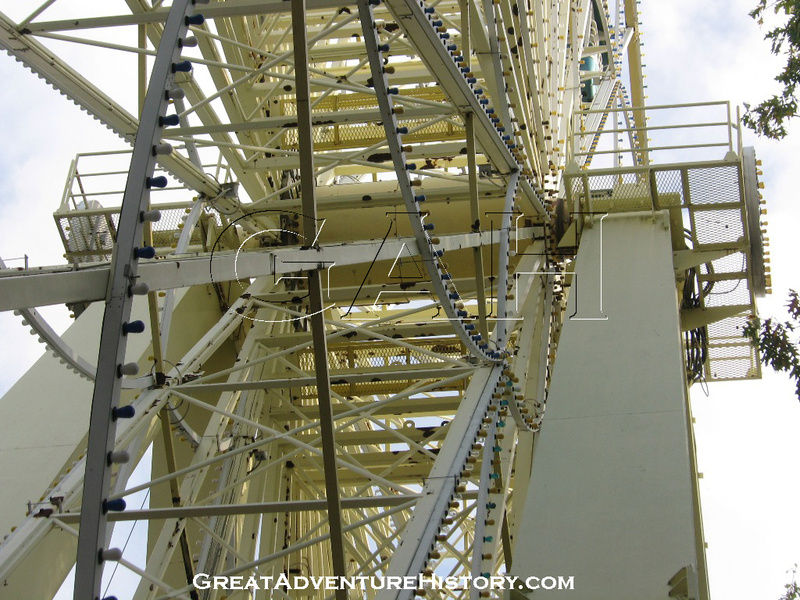 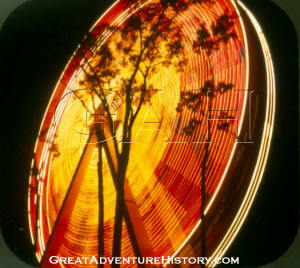 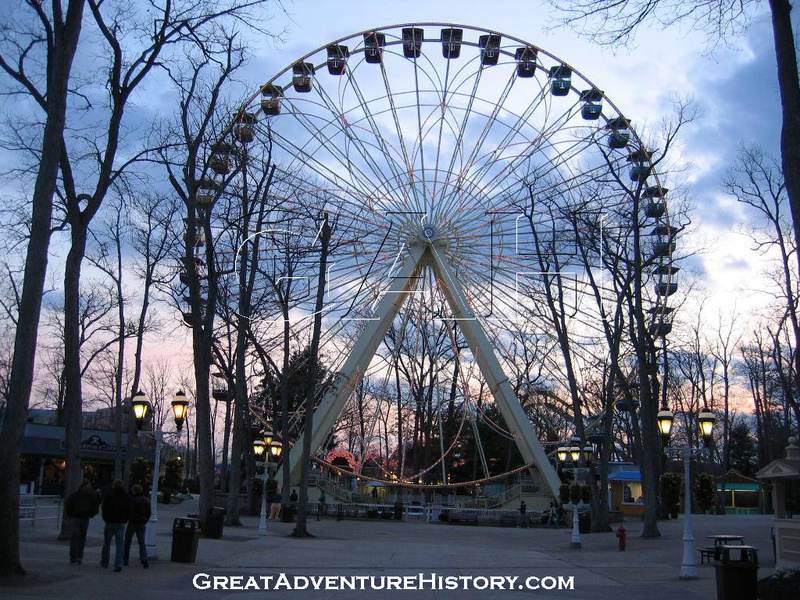 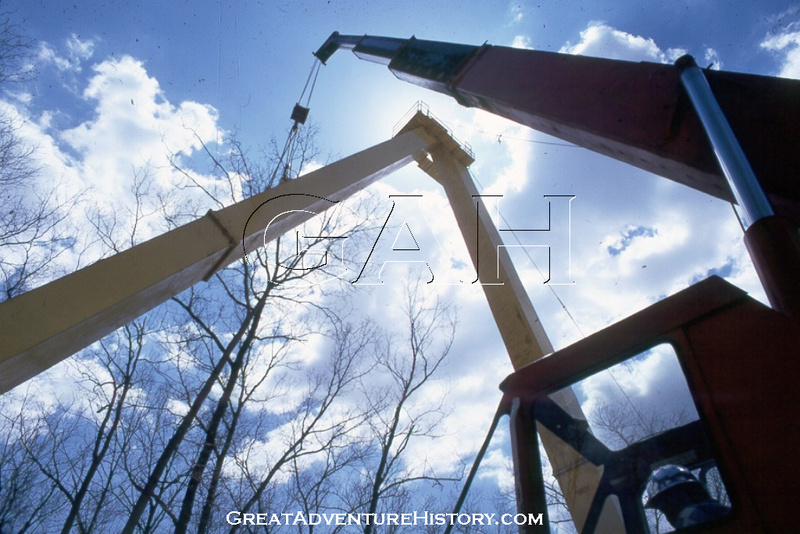 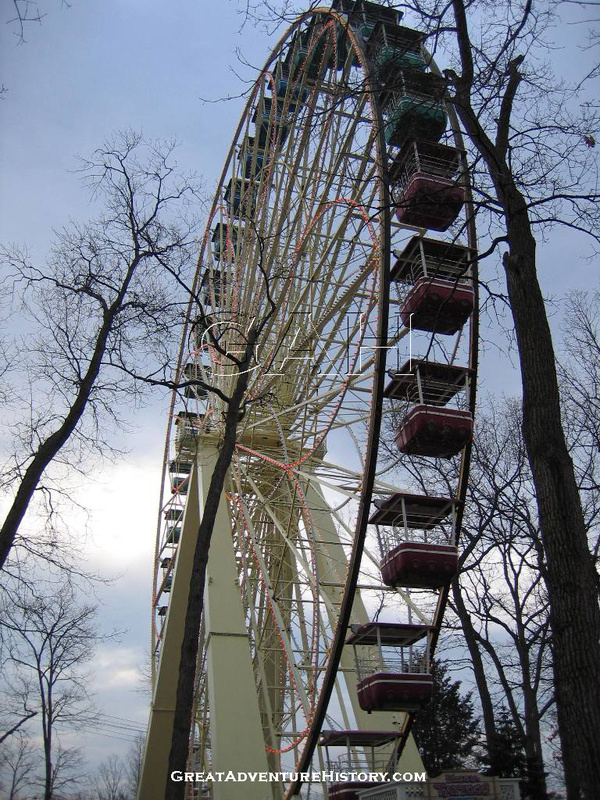 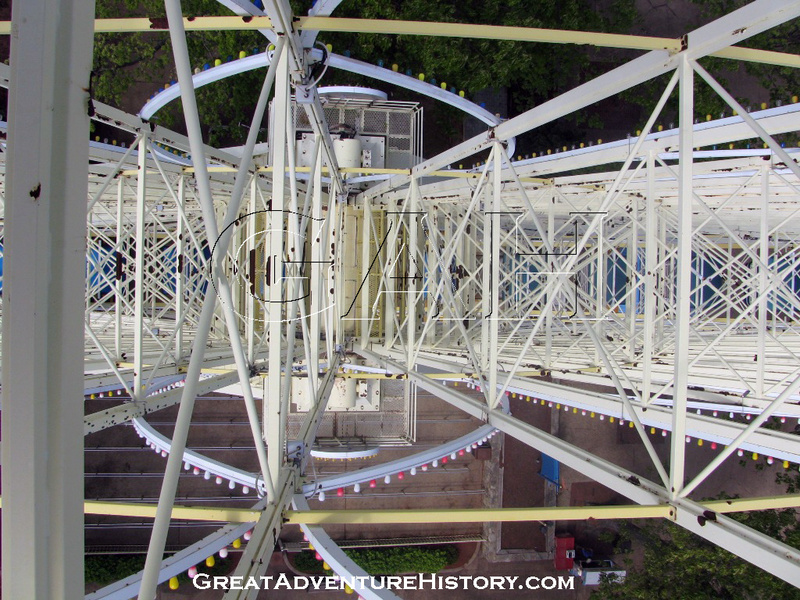 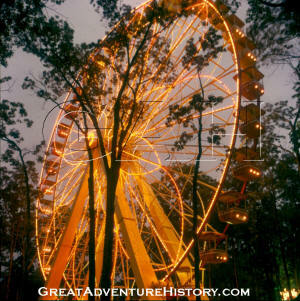 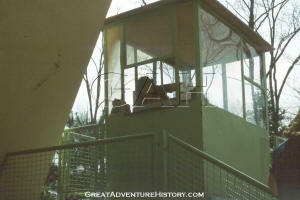 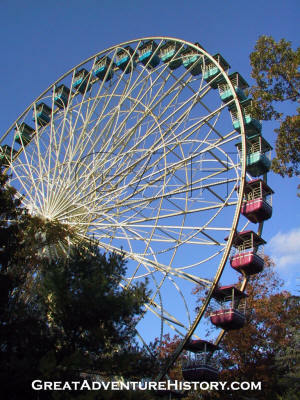 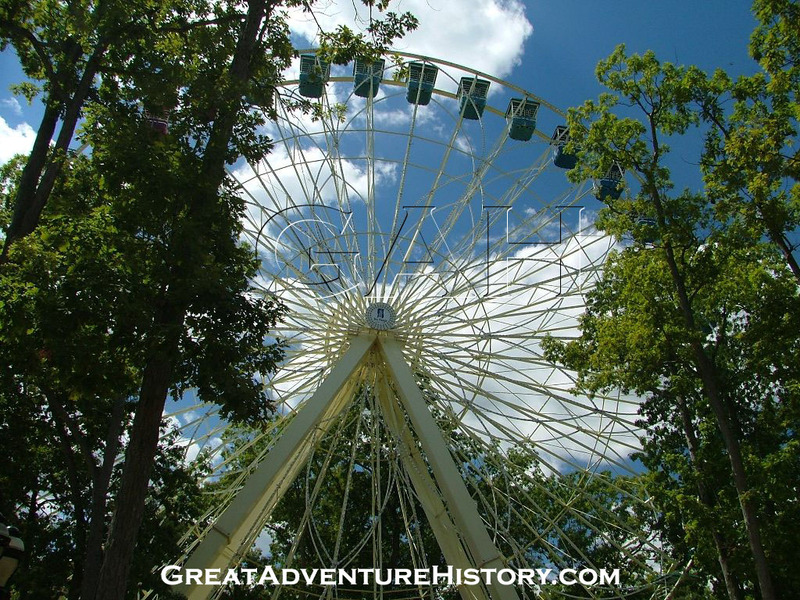 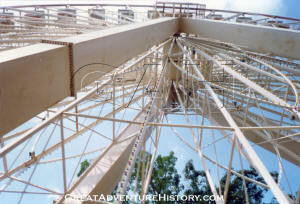 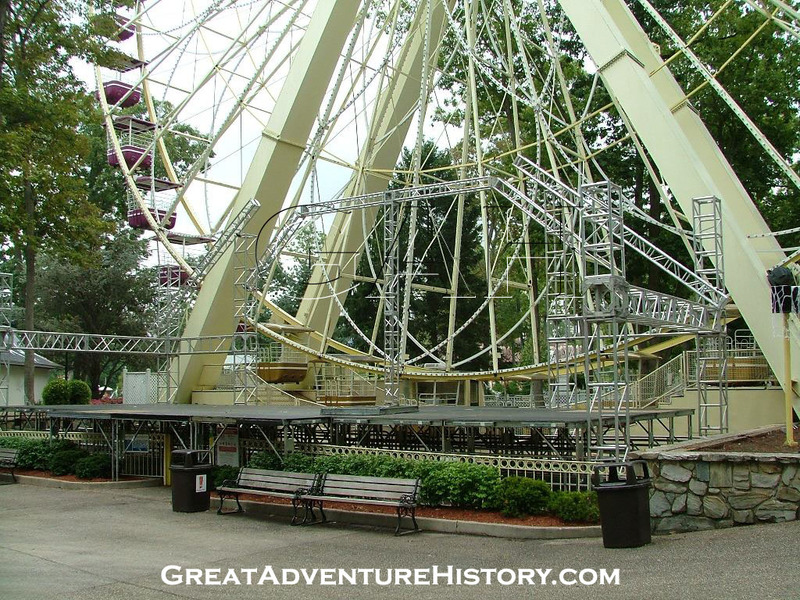 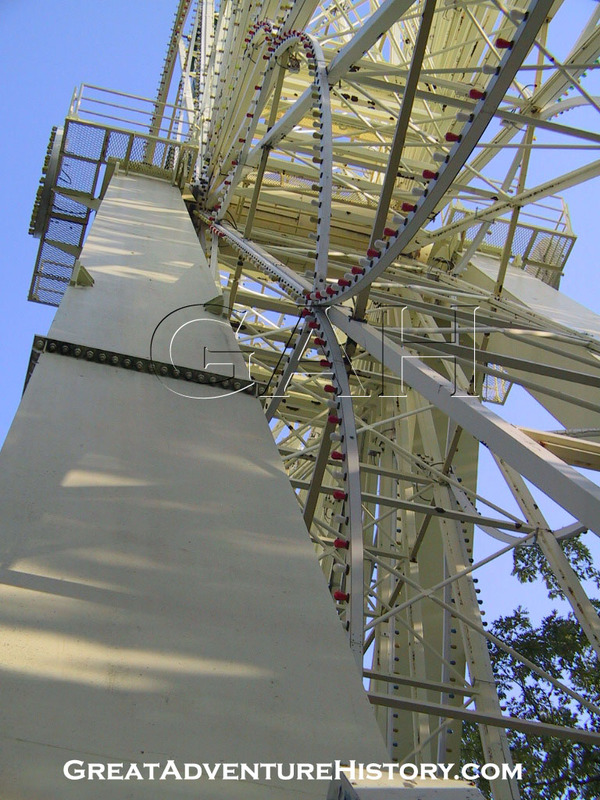 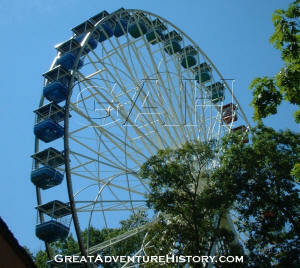 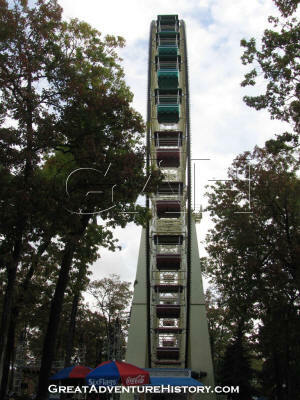 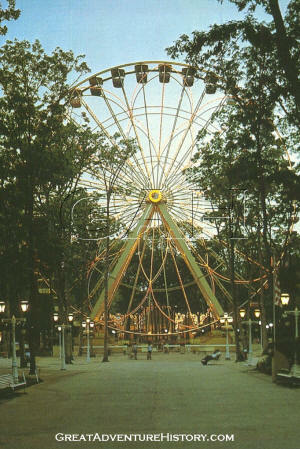 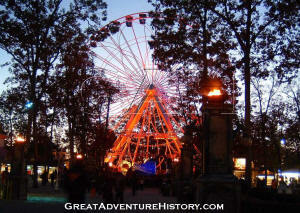 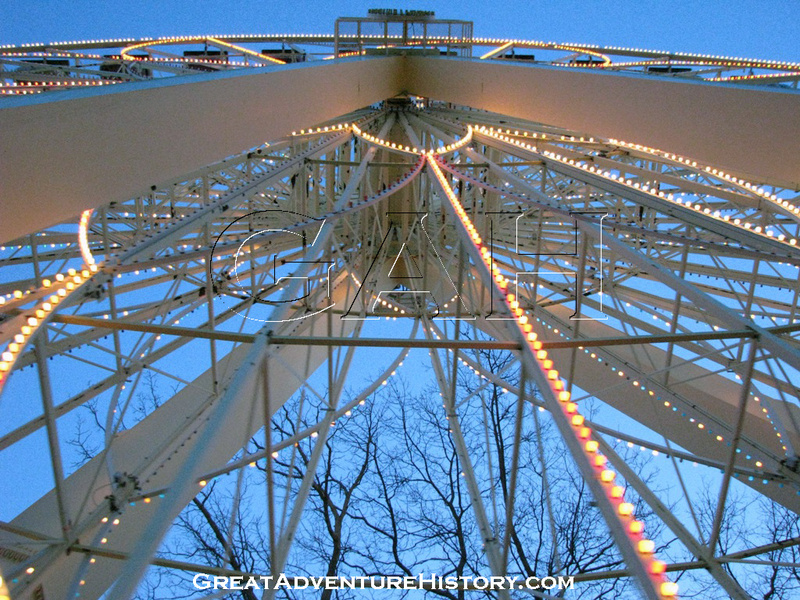 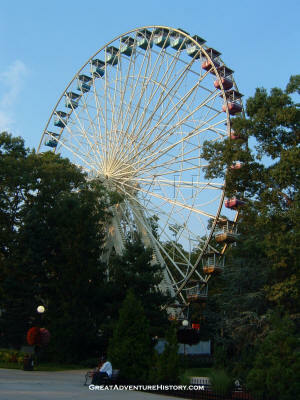 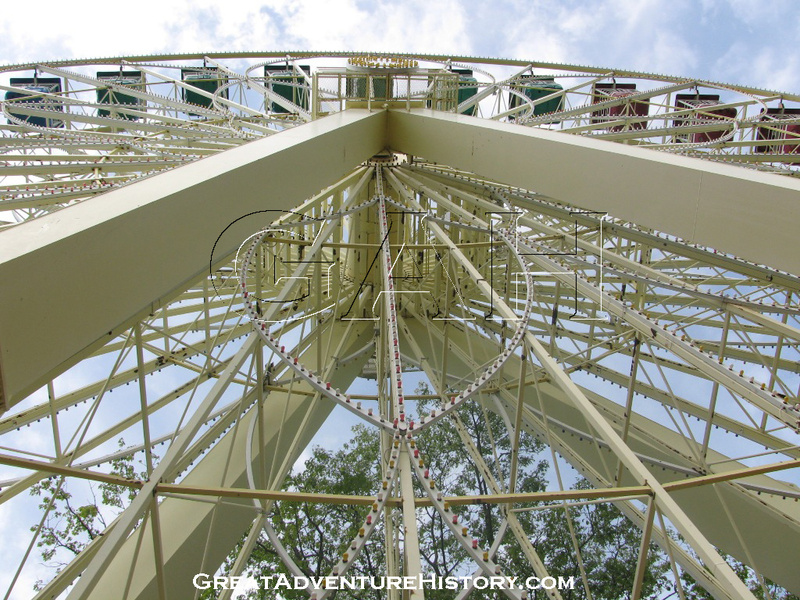 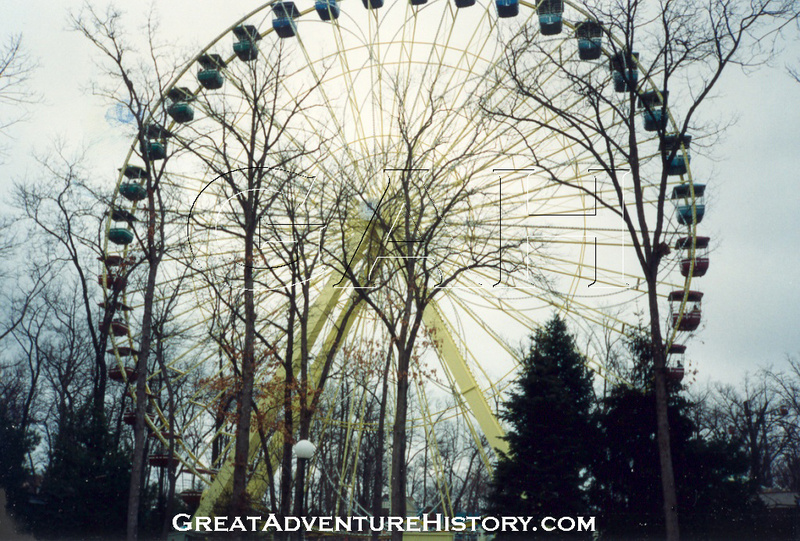 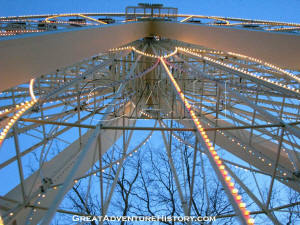 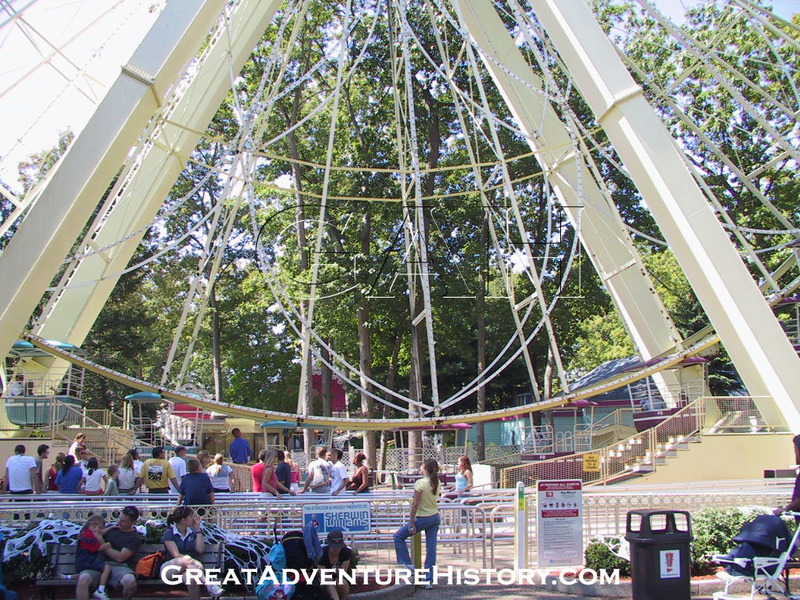 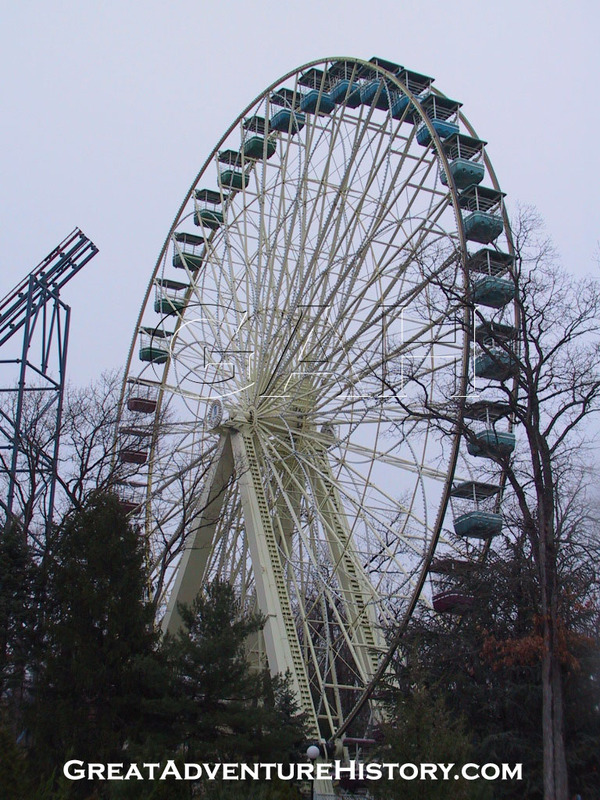 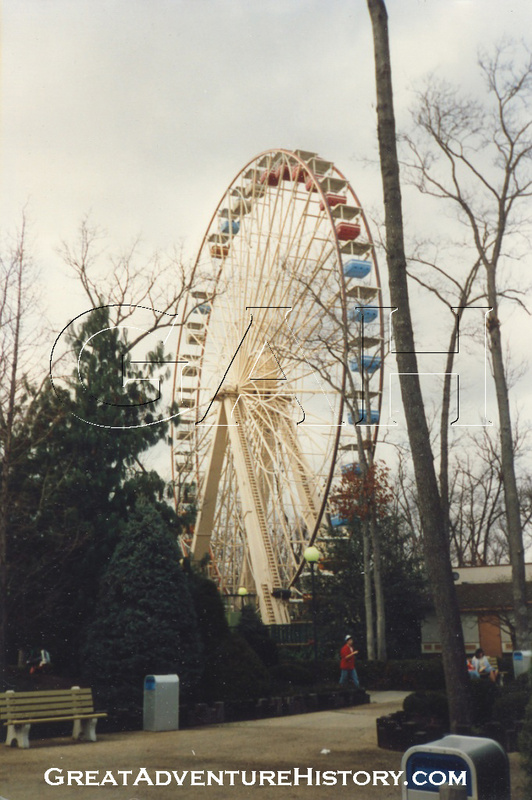 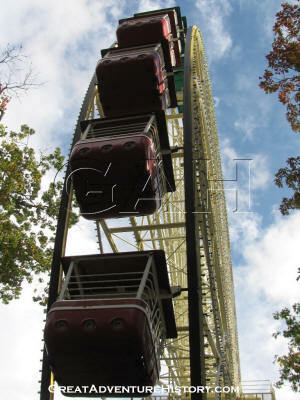 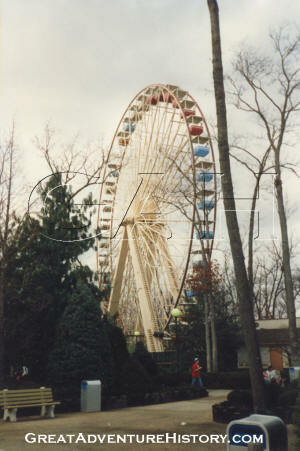 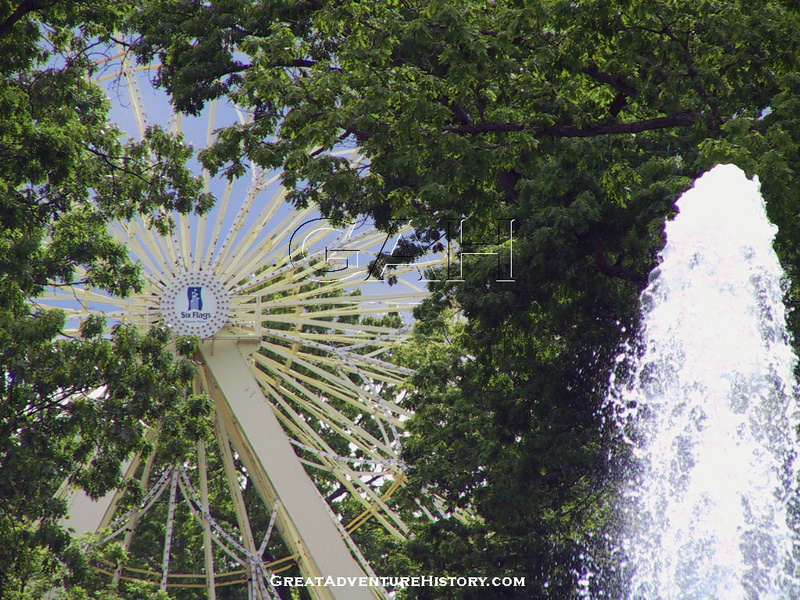 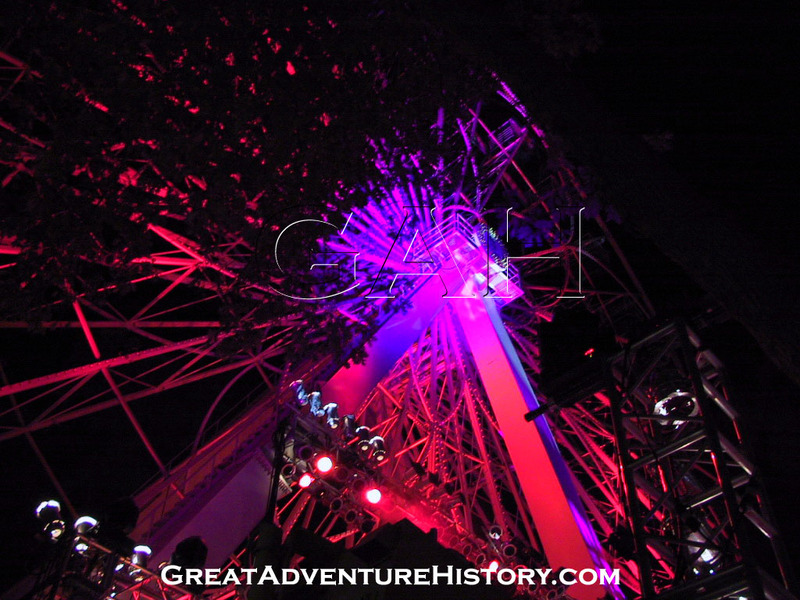 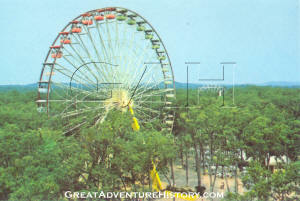 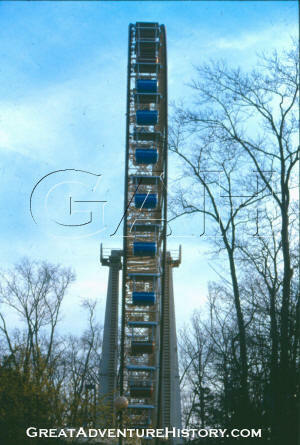 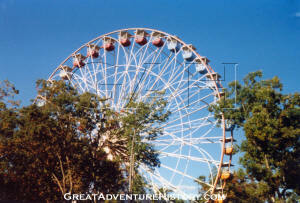 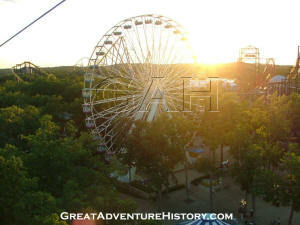 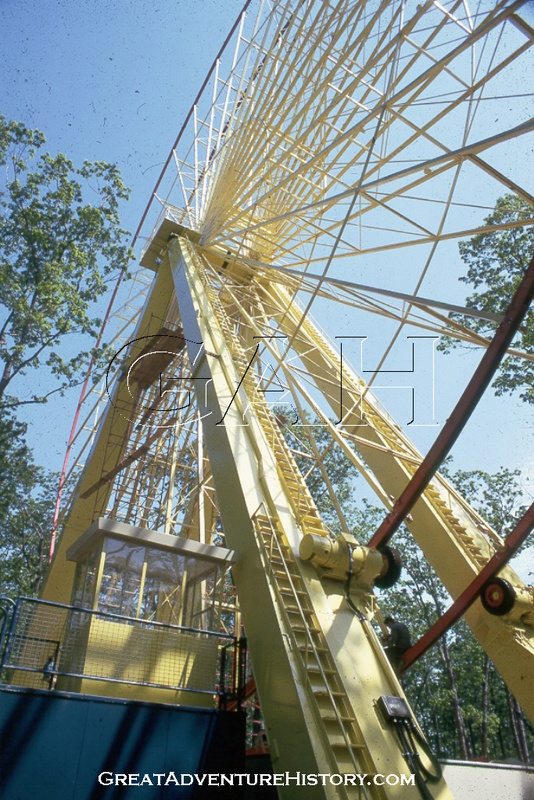 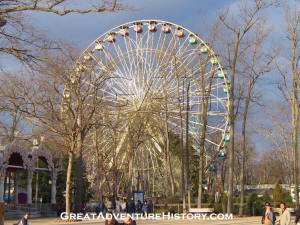 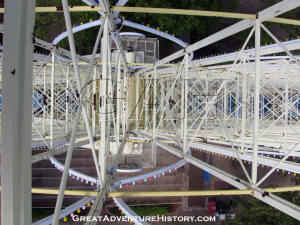 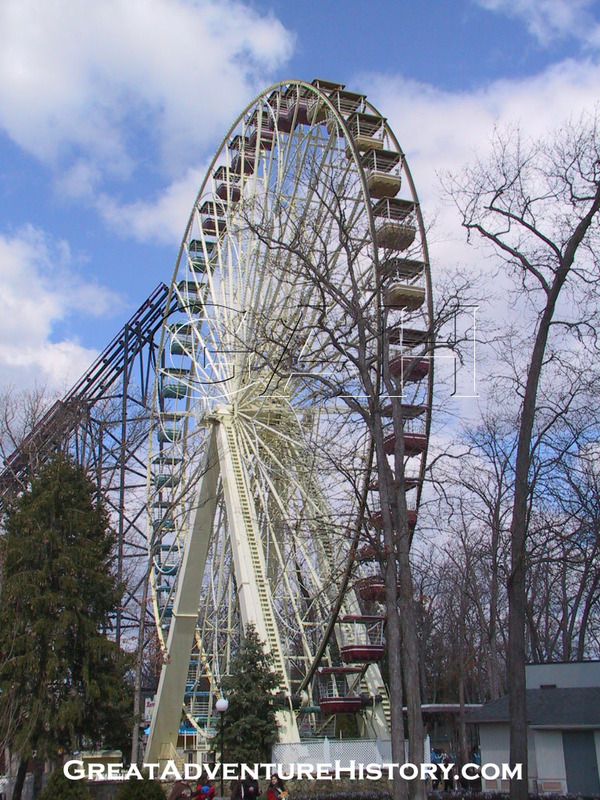 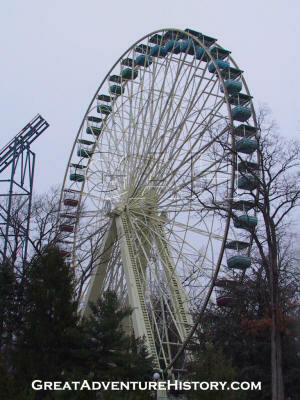 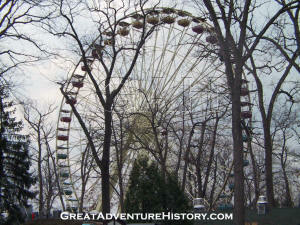 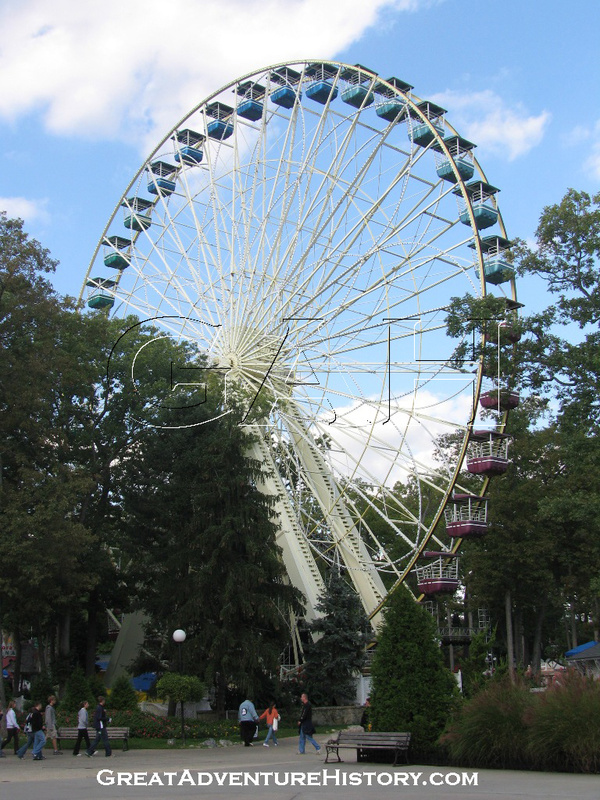 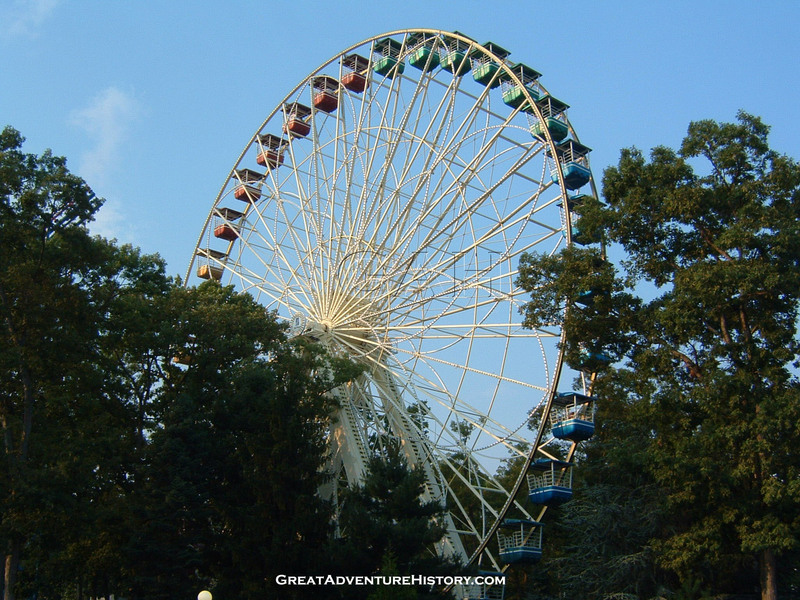 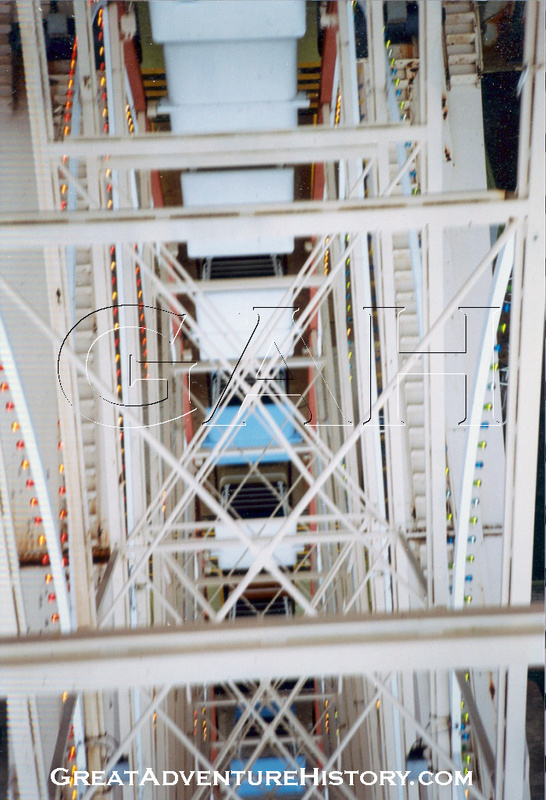 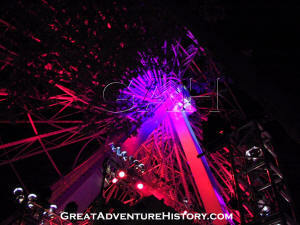 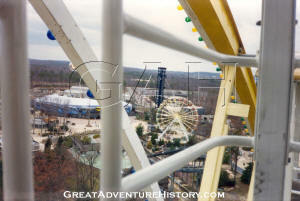 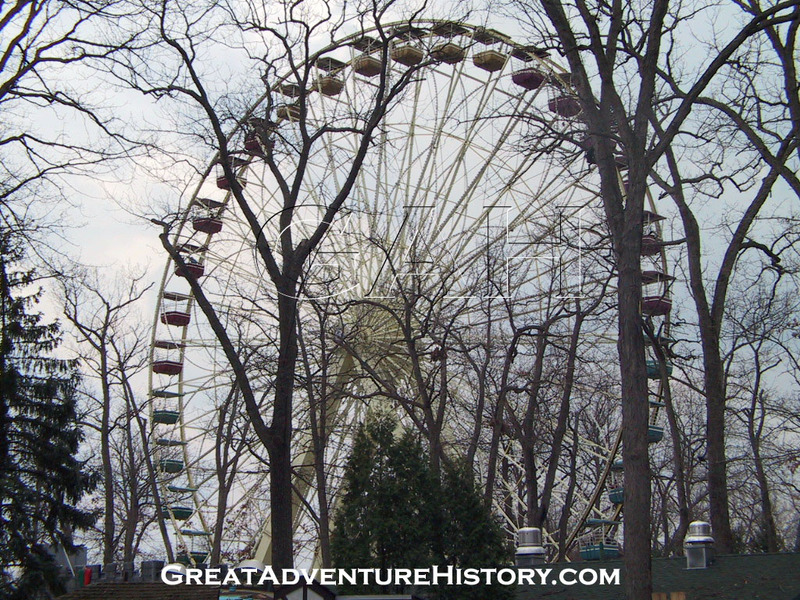 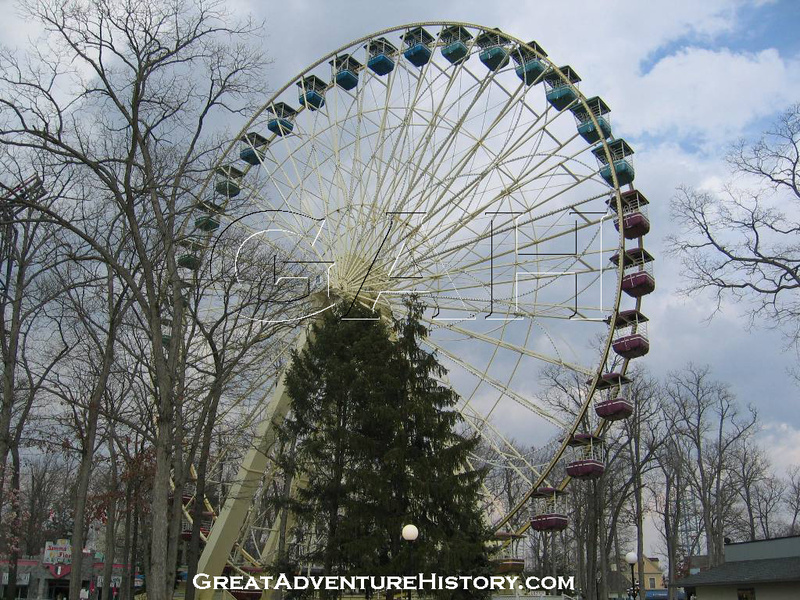 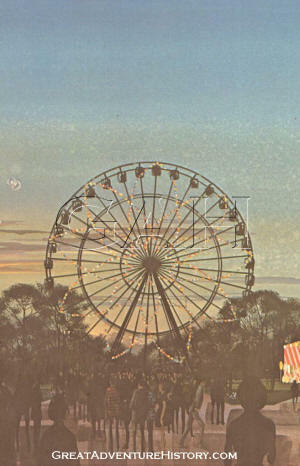 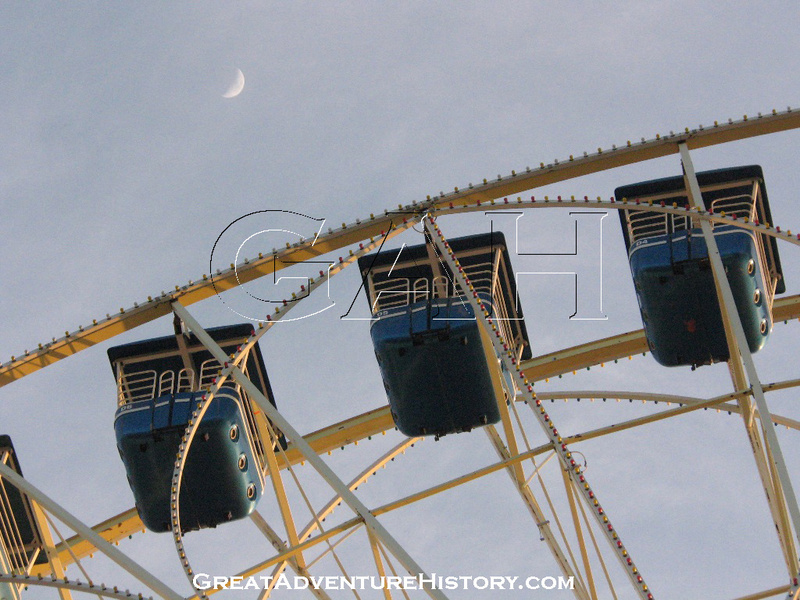 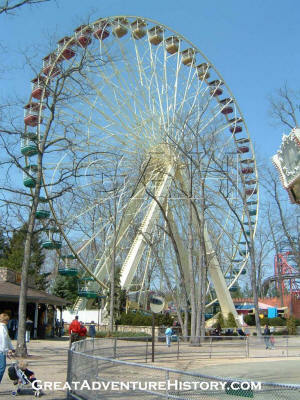 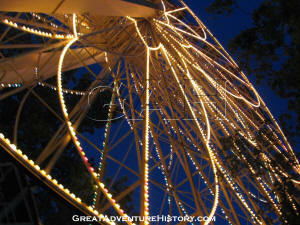 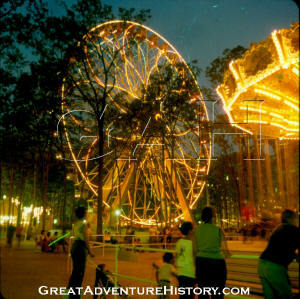 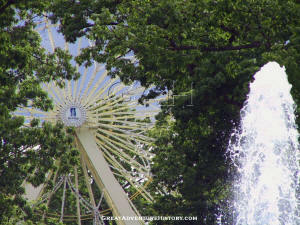 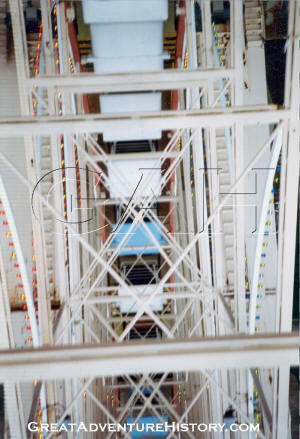 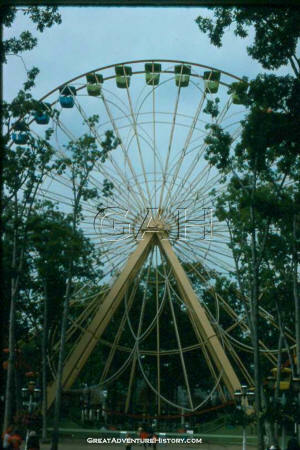 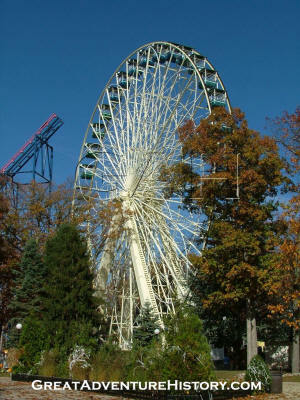 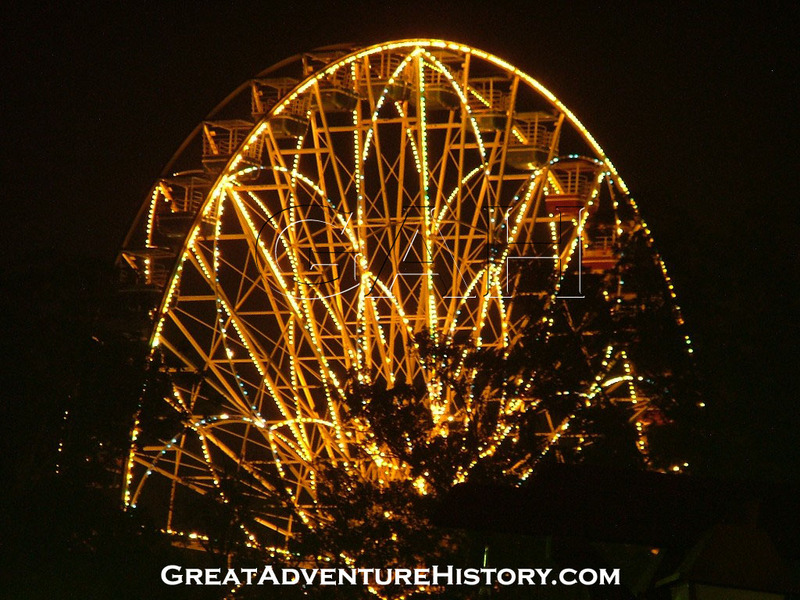 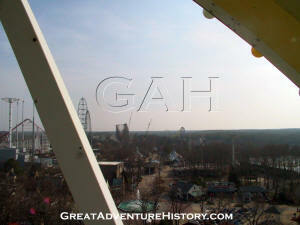 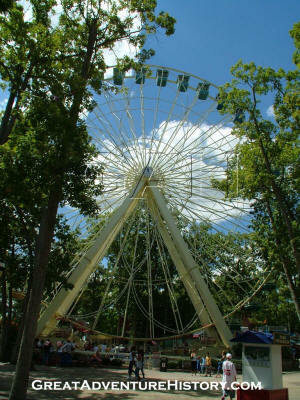 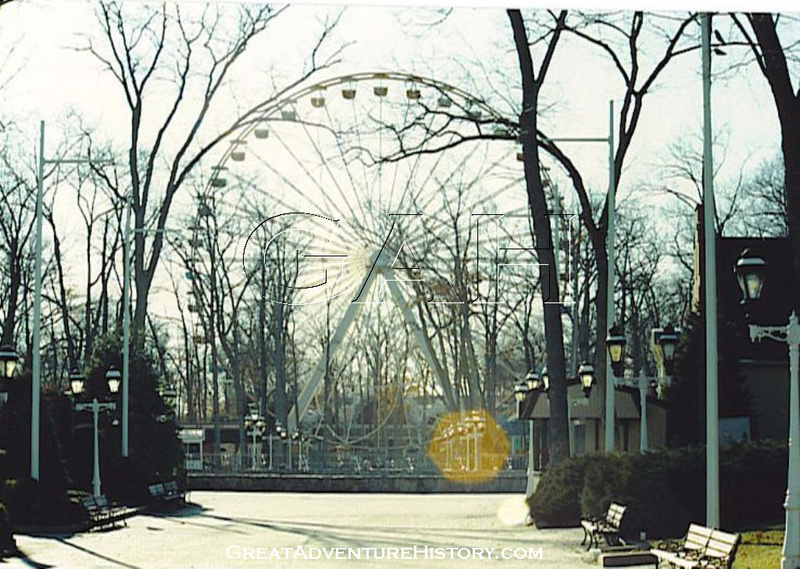 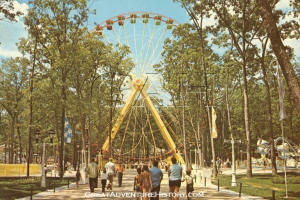 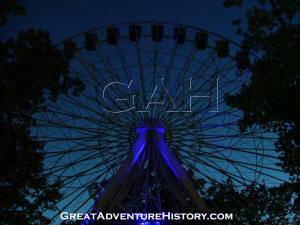 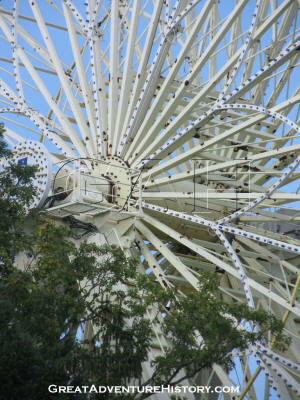 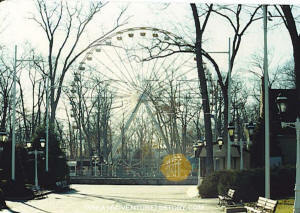 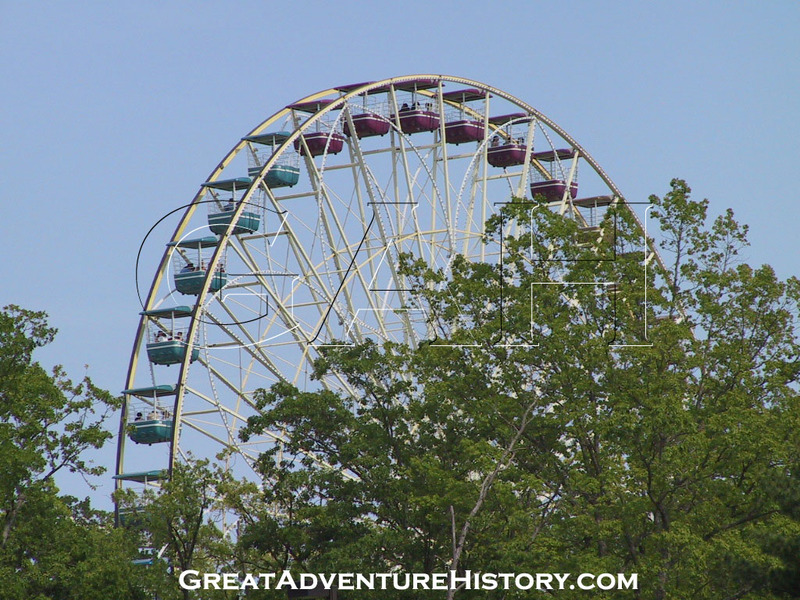 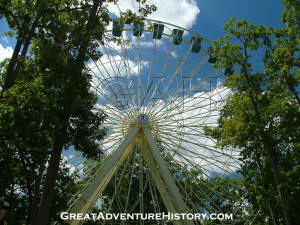 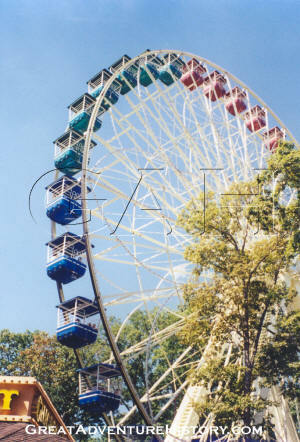 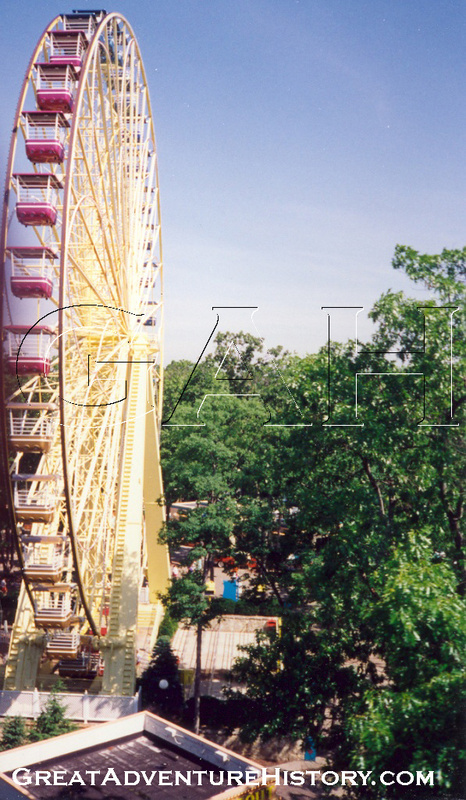 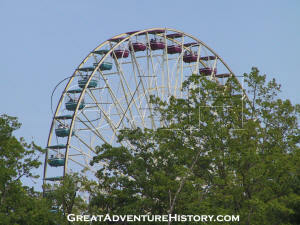 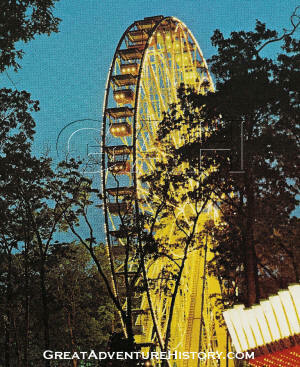 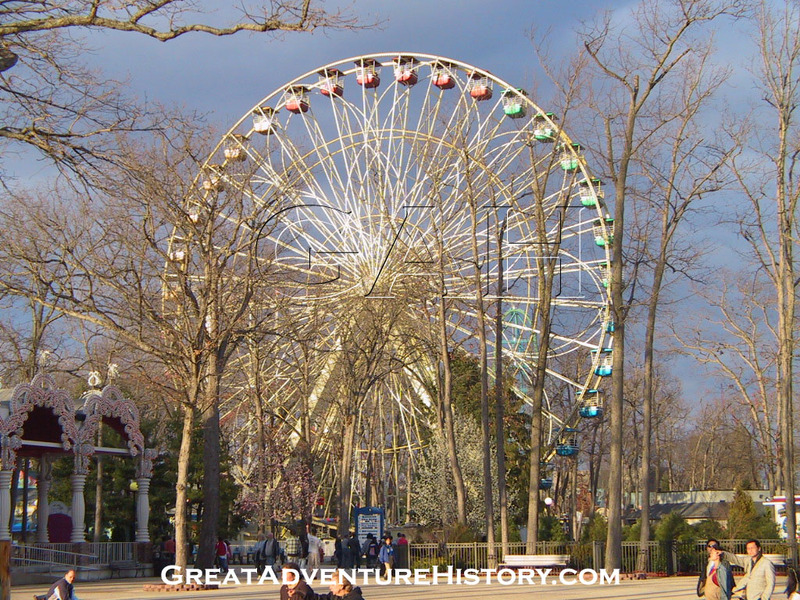 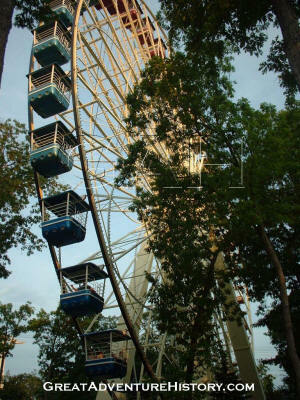 In the spring of 1974 the Giant Wheel was re-assembled, rising high above the treetops of Jackson New Jersey. 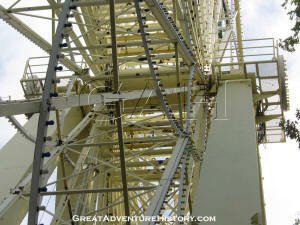 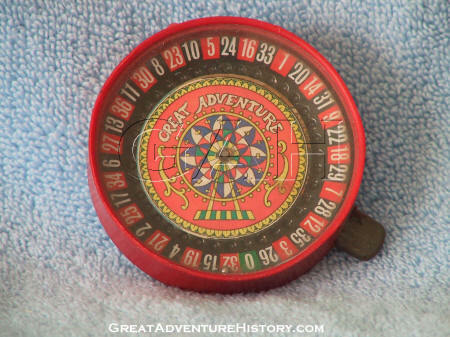 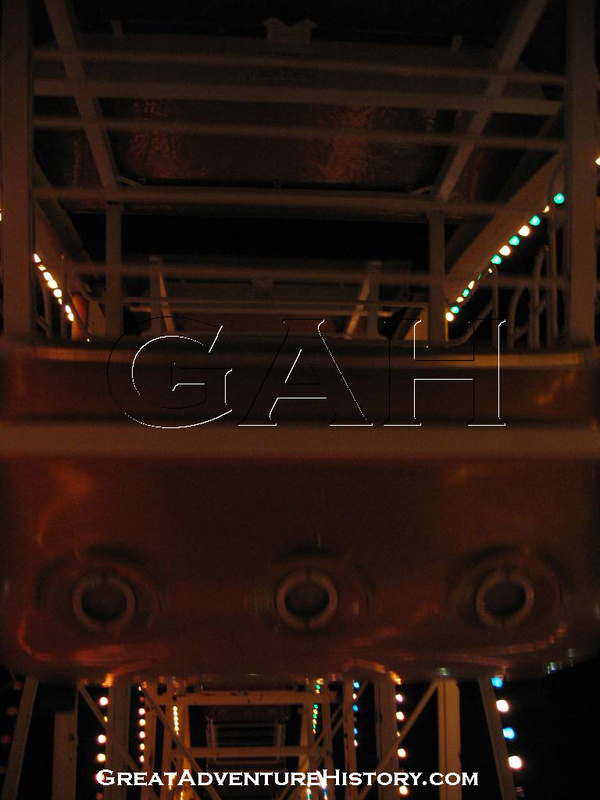 The portable nature of the Giant Wheel made assembly relatively fast and easy. 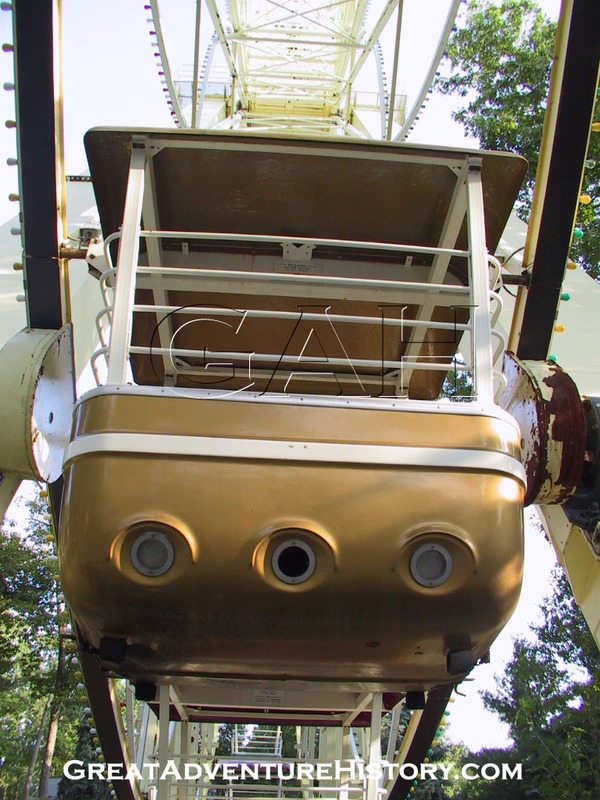 The ride's load platform conceals the steel framework at the base of the four legs. 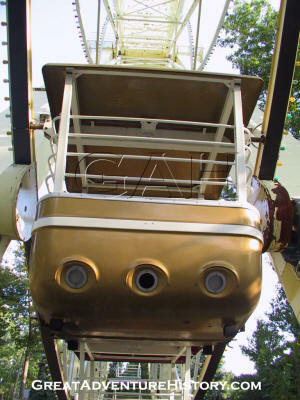 Part of the rides support structure is composed of four large containers which are located at the base of each leg, projecting outward. 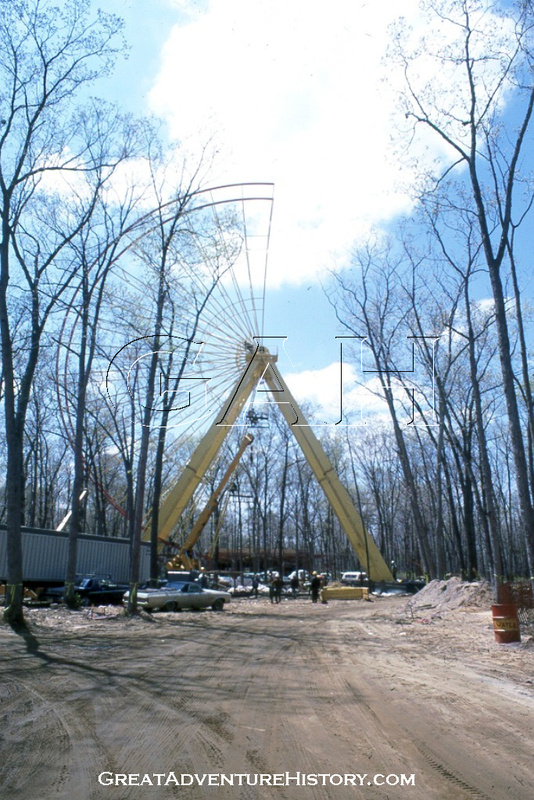 The weight of the steel and the plantings which fill them hold the structure steady without the need for elaborate concrete footings. 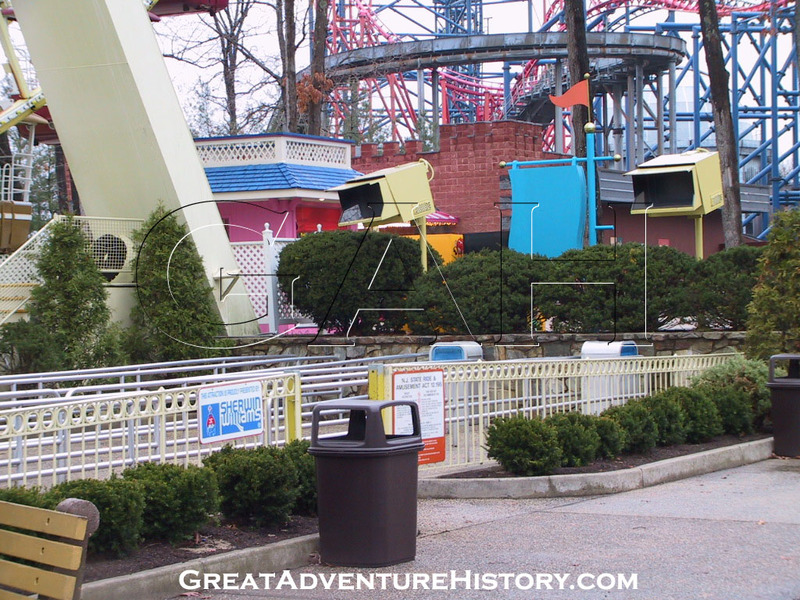 The containers serve as walls around the sides of the queues and were covered with a stone facing that matched the style of the stone walls found throughout the park as part of planters and fountains. 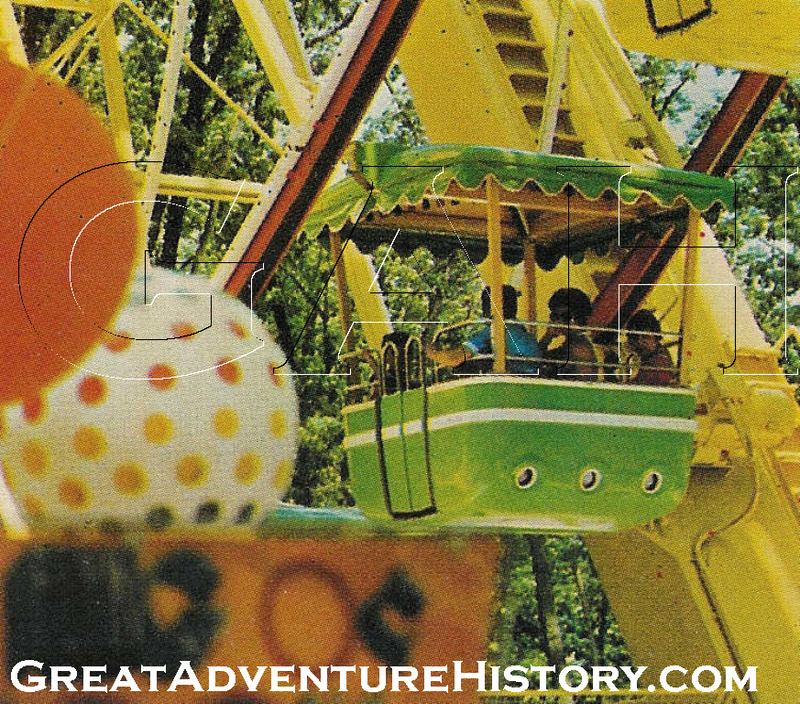 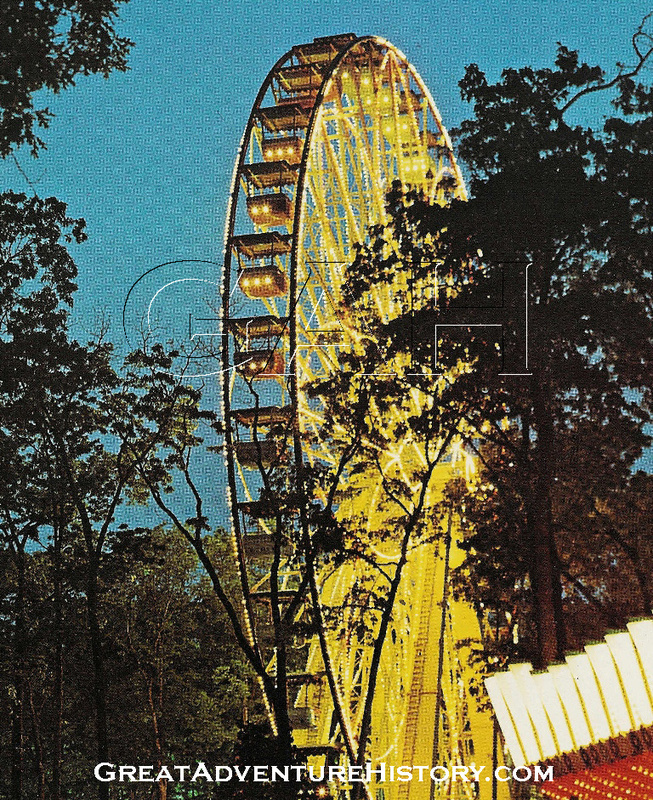 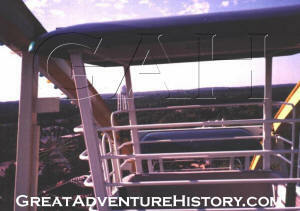 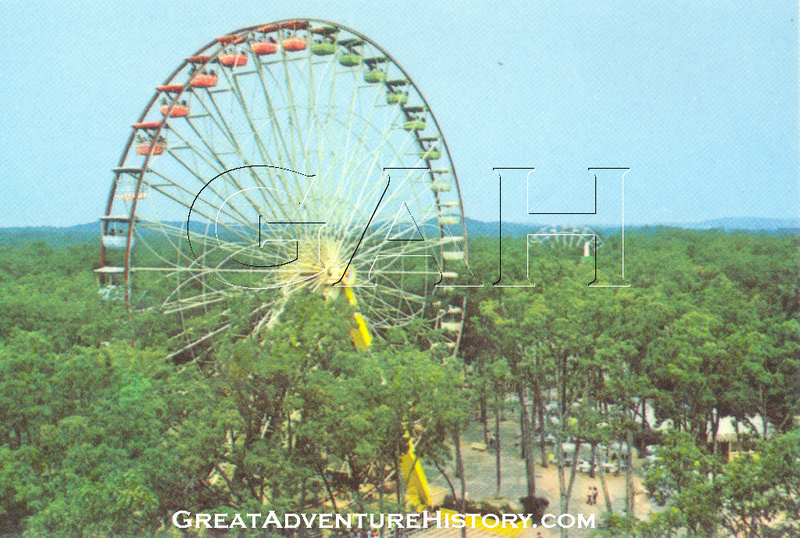 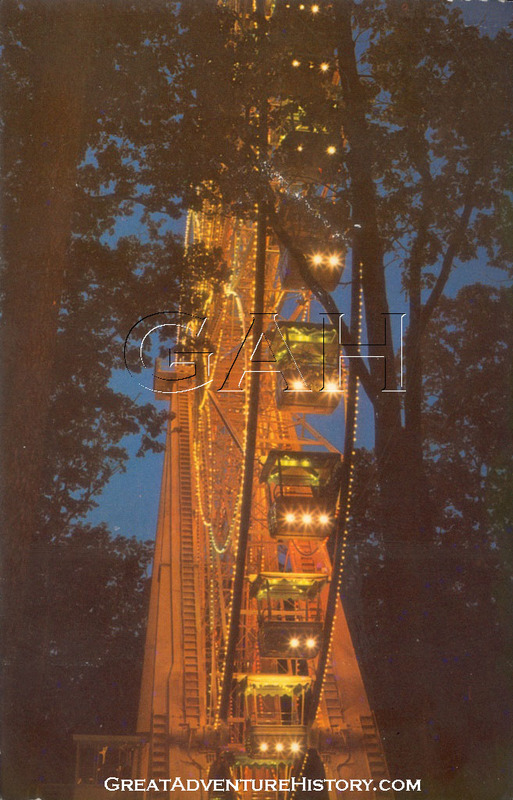 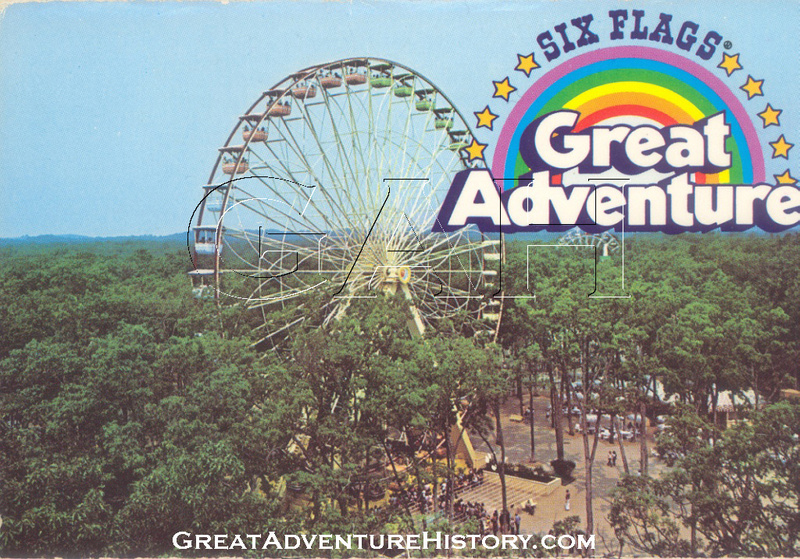 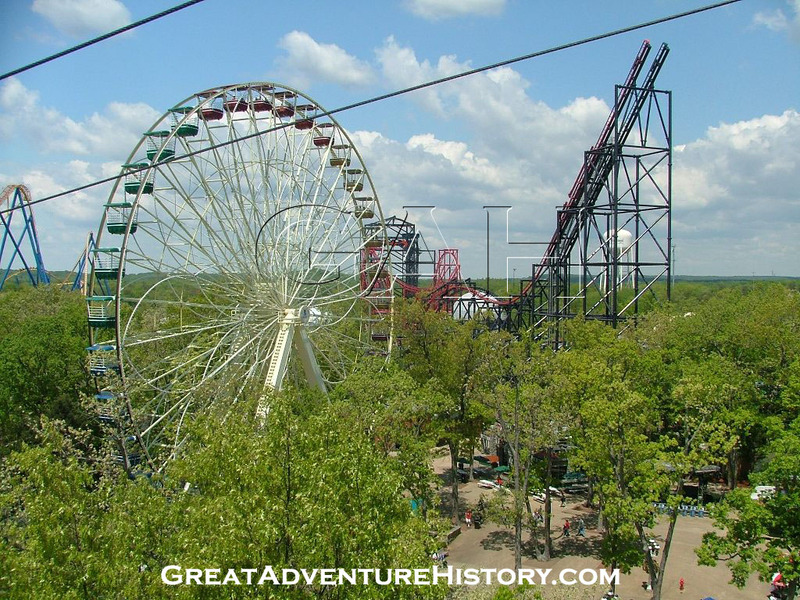 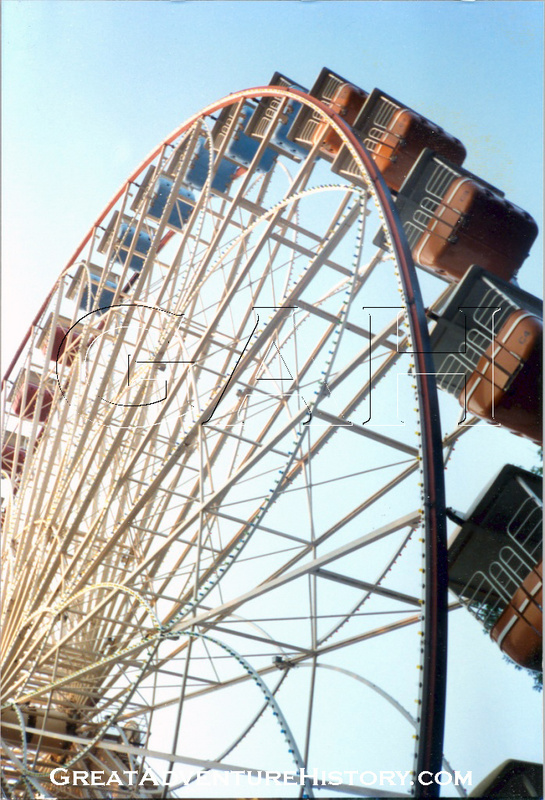 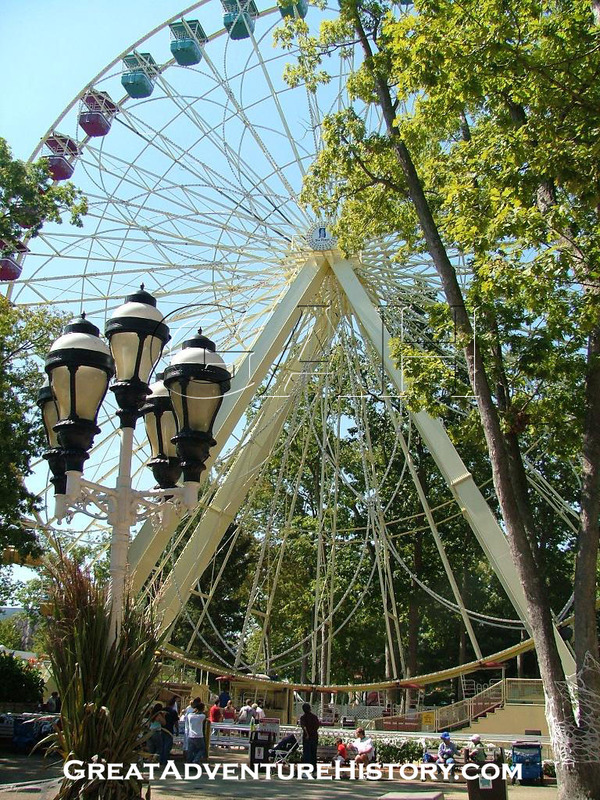 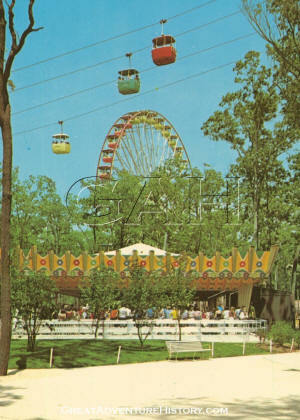 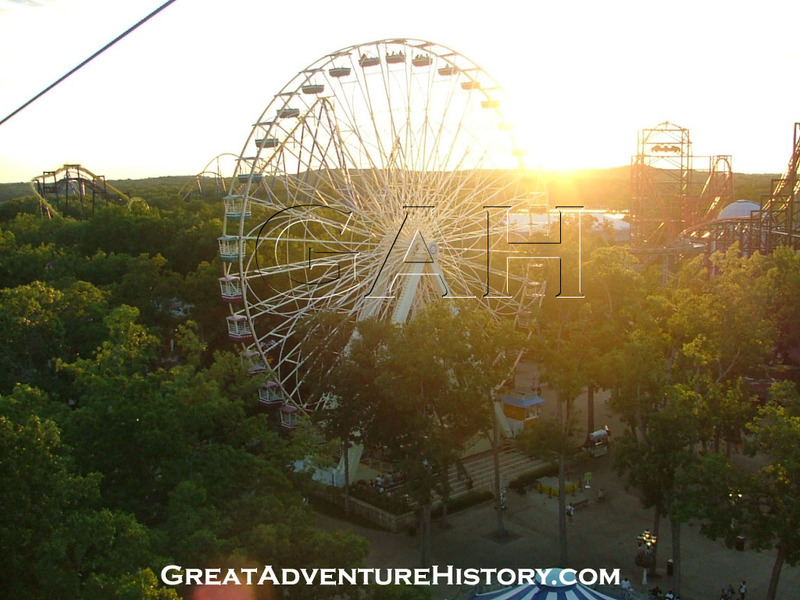 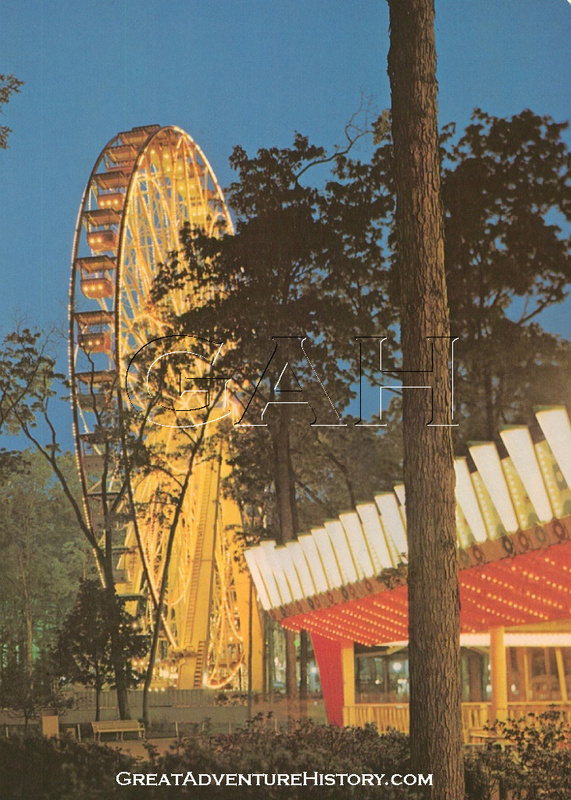 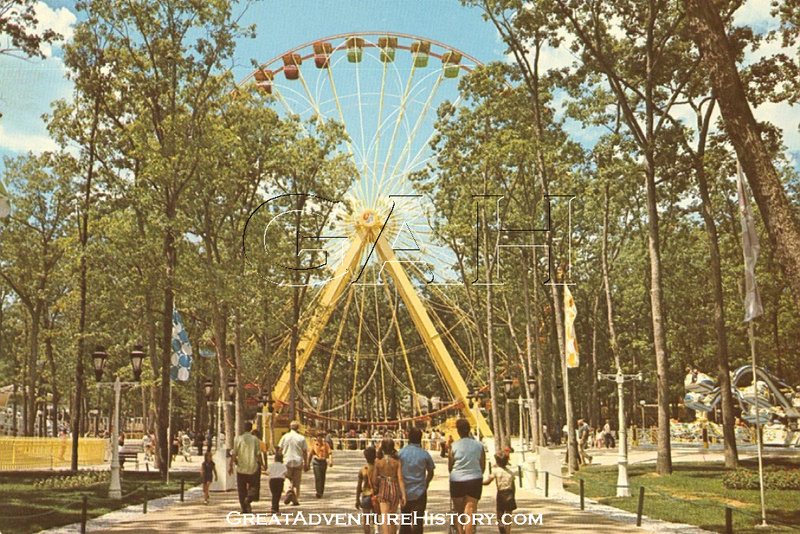 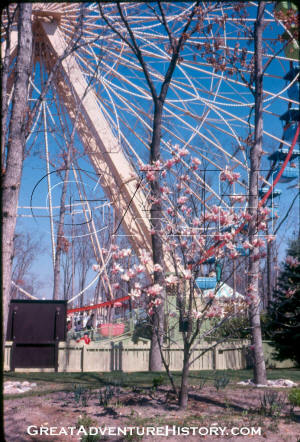 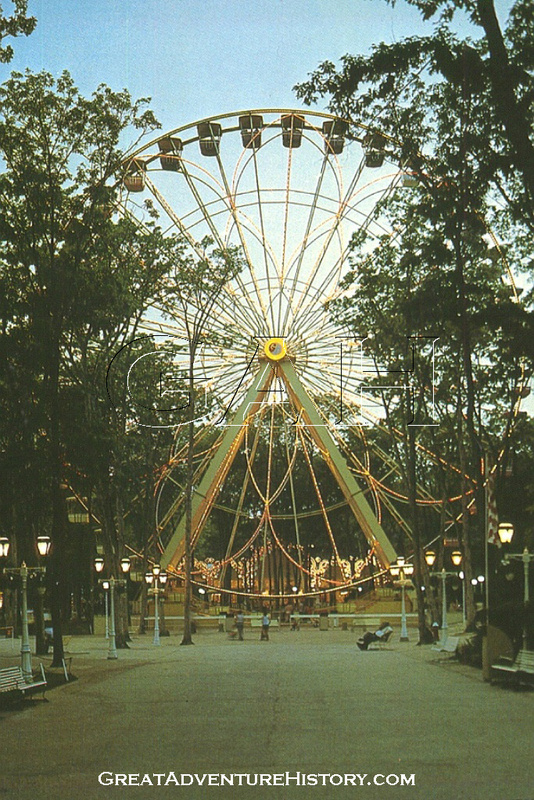 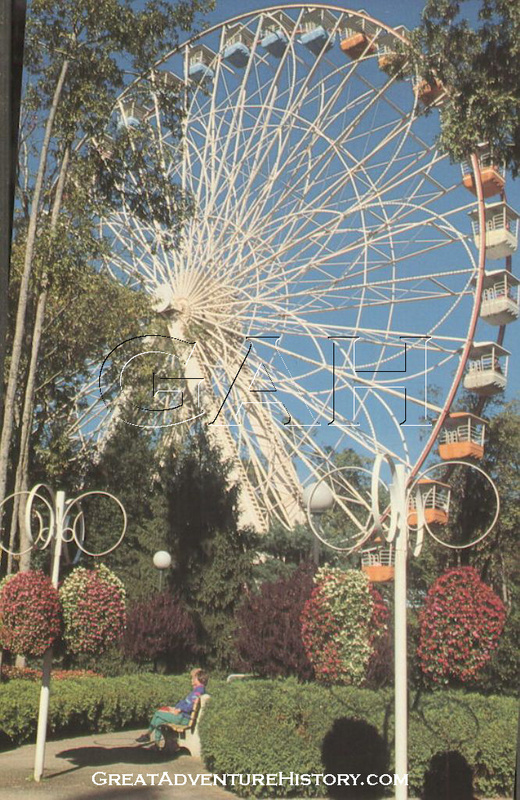 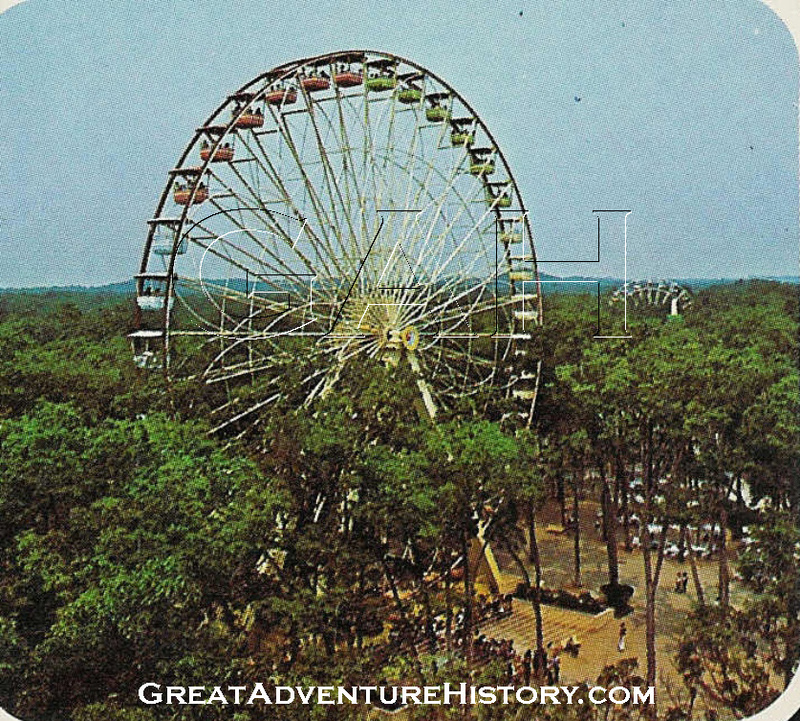 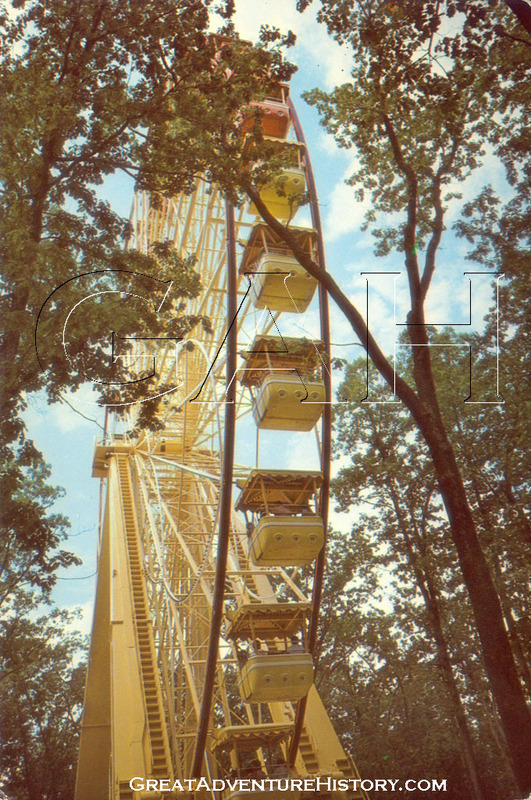 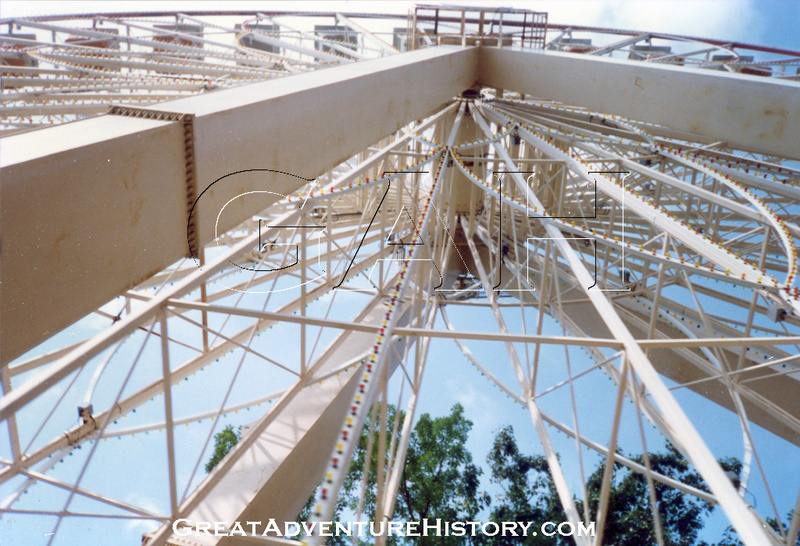 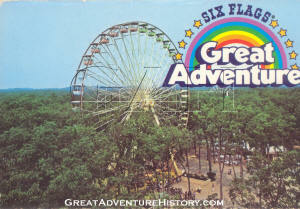 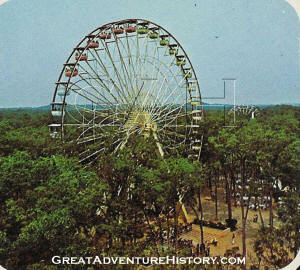 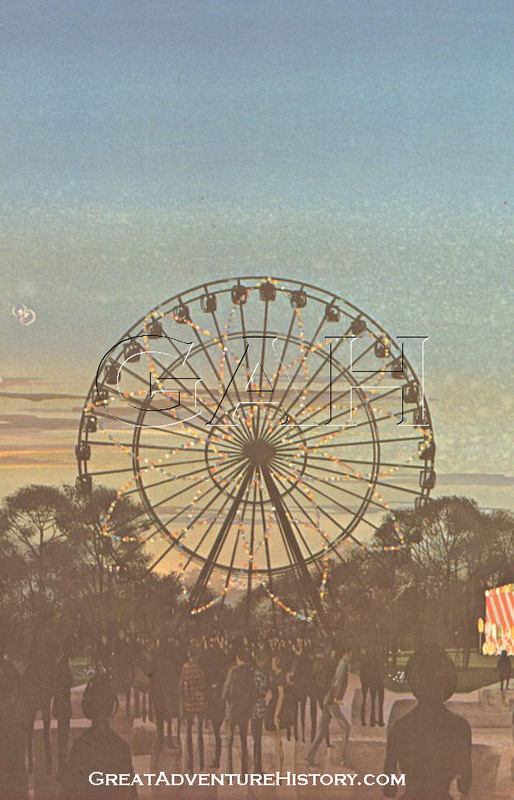 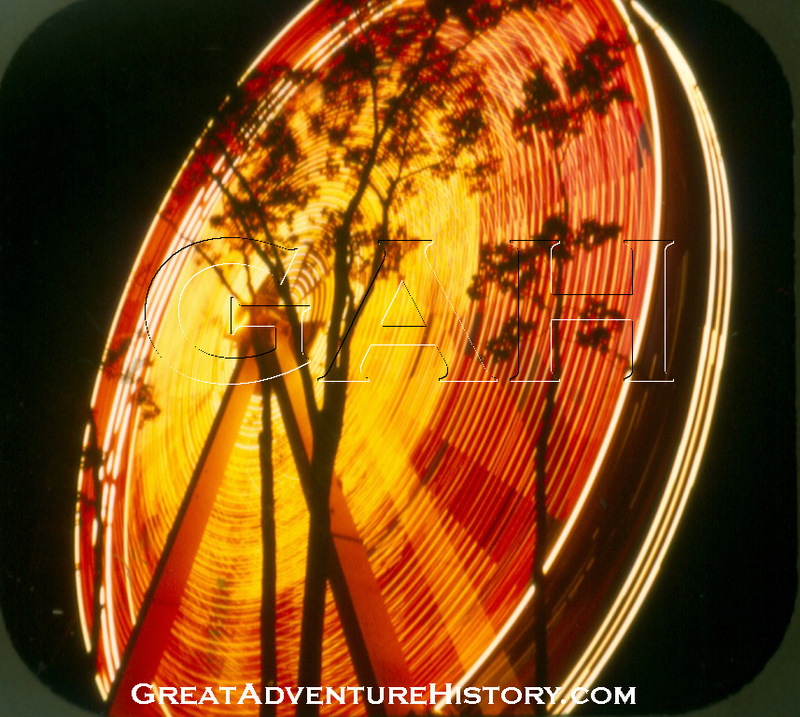 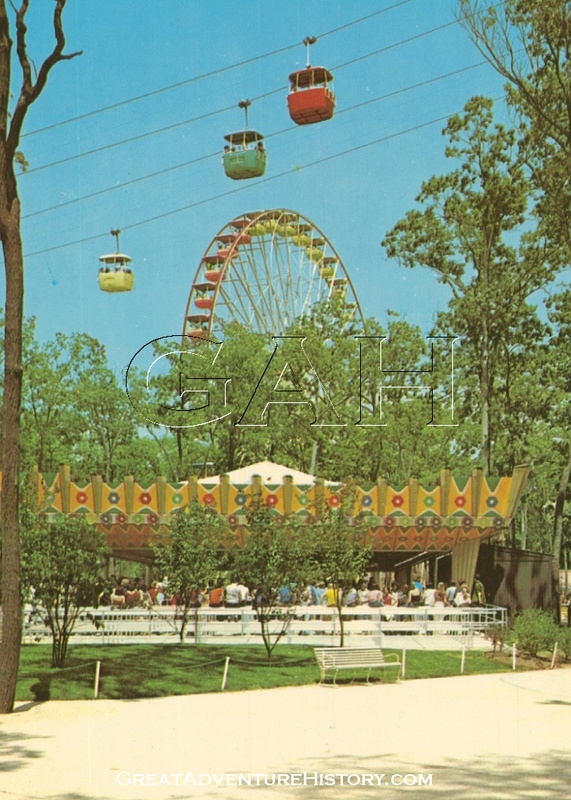 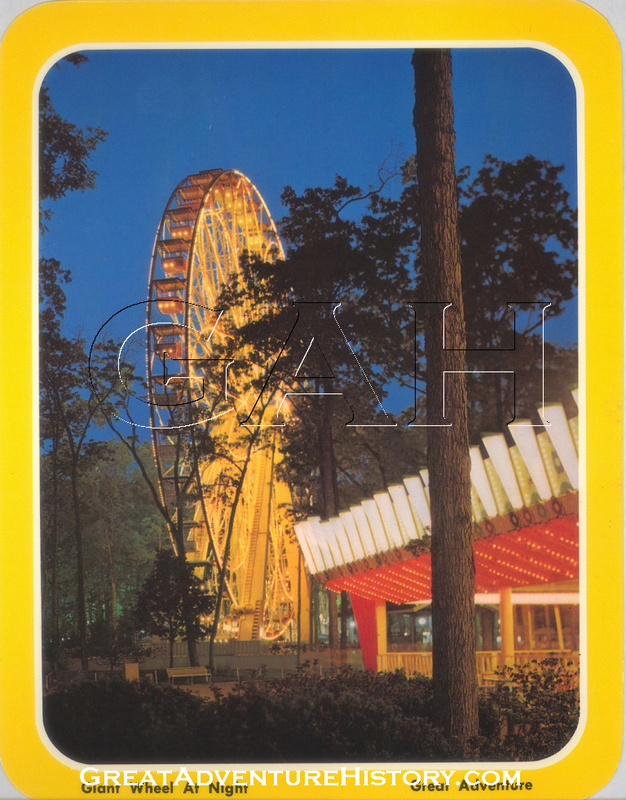 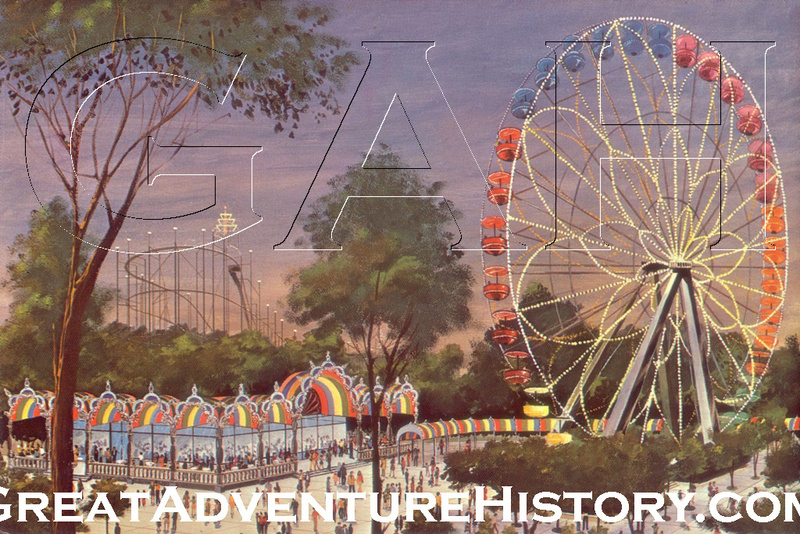 In 1974 the Giant Wheel was considered a thrilling ride, taking riders high above Dream Street for spectacular views of the beautiful attractions throughout the Enchanted Forest, as well as views of the natural beauty of the park. 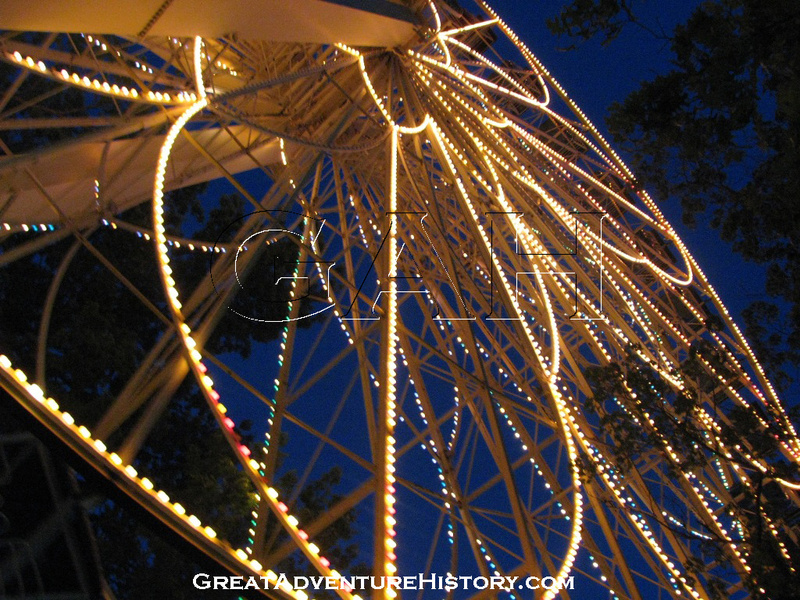 The Giant Wheel features a dazzling display of thousands of light bulbs in a floral pattern which light up the night sky and continue to draw guests into the park after the sun sets. 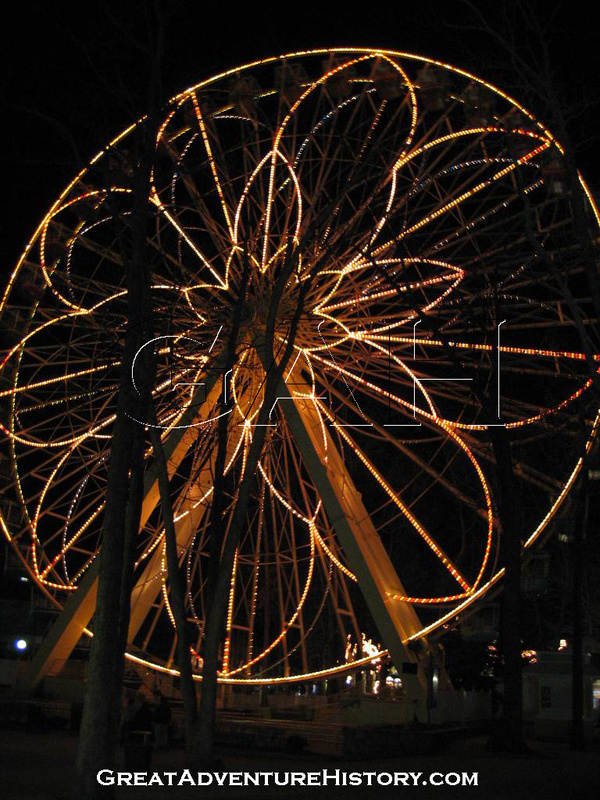 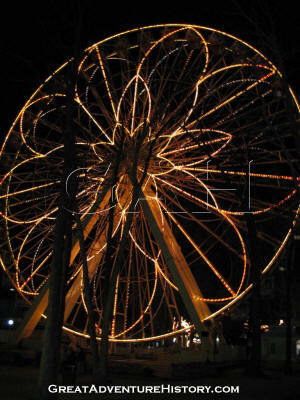 The Giant Wheel's lights featured changing patterns in the early 70s - the outer circle dimmed to reveal just the floral pattern, the straight radial lights featured a rotating pattern, and the floral petals illuminated outward from the center of the wheel. 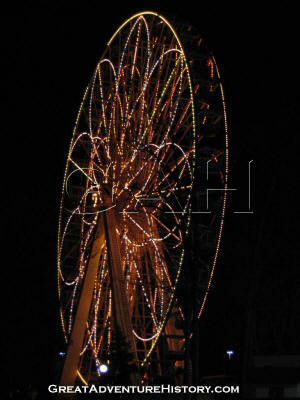 Lighting on the Giant Wheel included lights on the outside of each car as well as lights inside the cars. 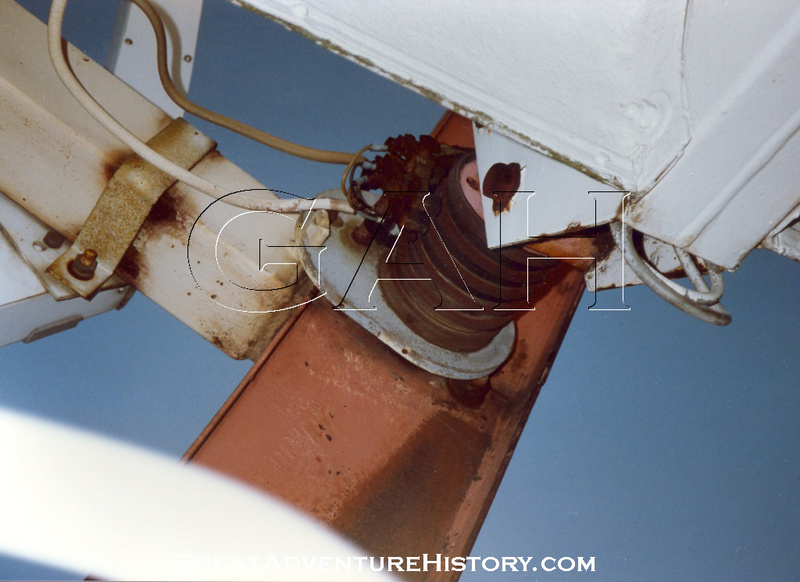 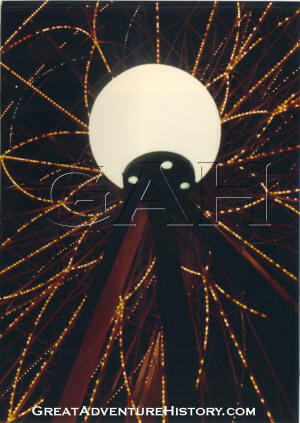 The lights which were mounted to the roofs of the cars were short lived, falling victim to vandalism with guests removing the bulbs for "fun" or for increased privacy in the darkness. 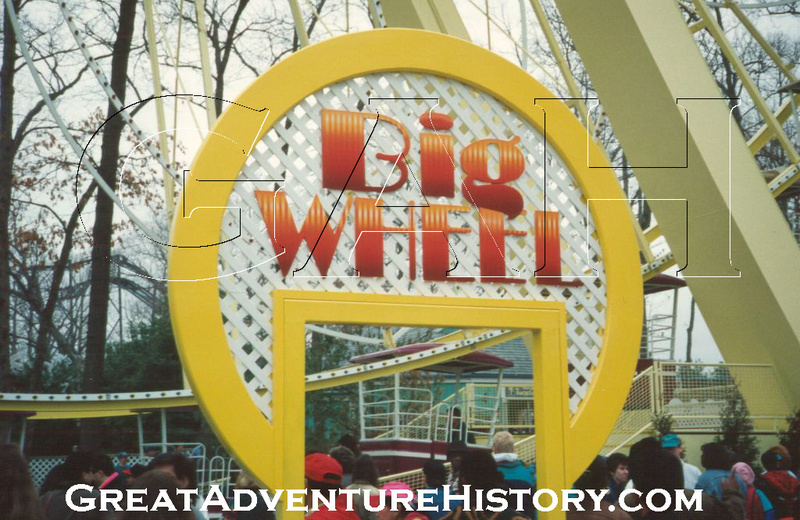 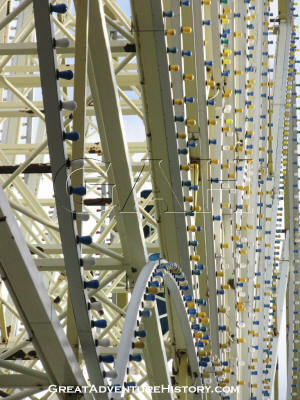 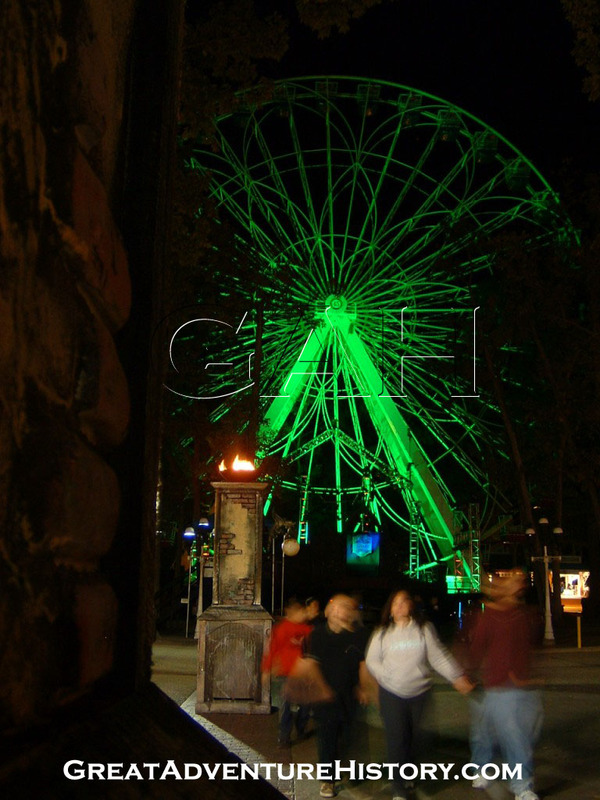 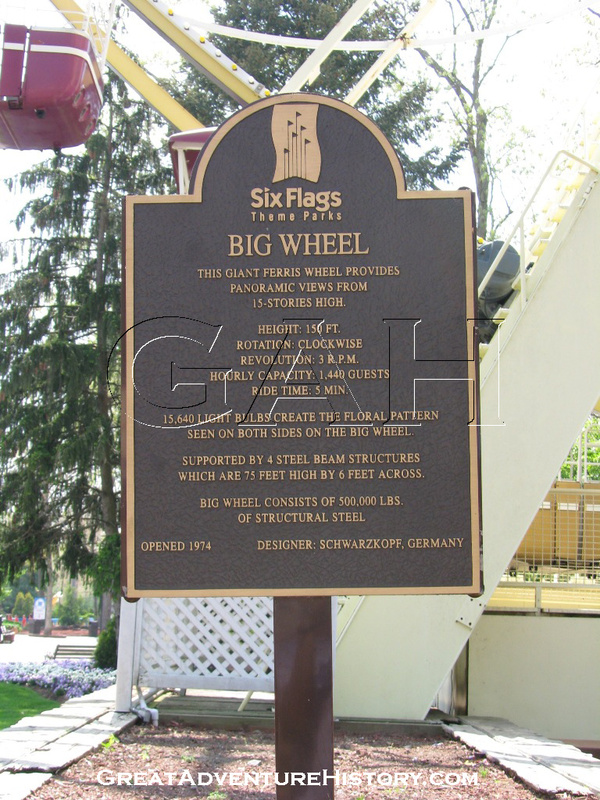 Over time, the Giant Wheel became known as the Big Wheel, and small changes were made as the park grew and changed around it. 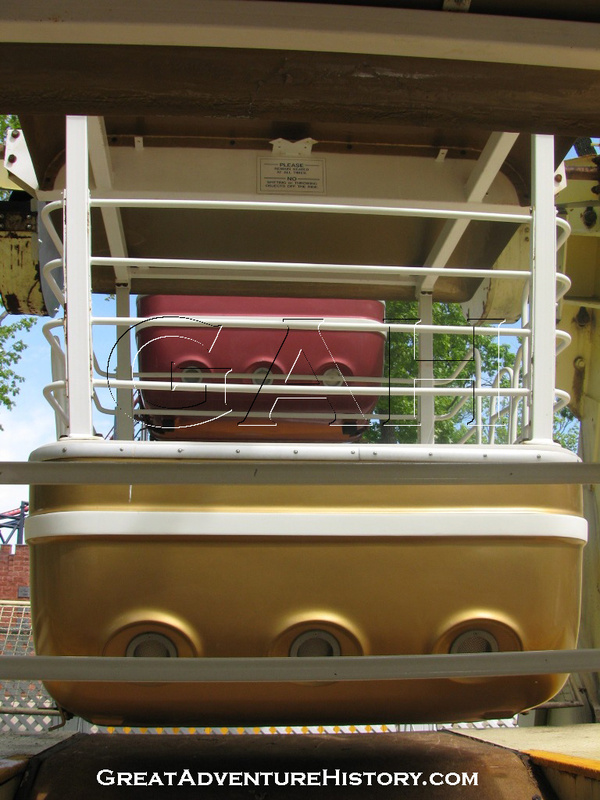 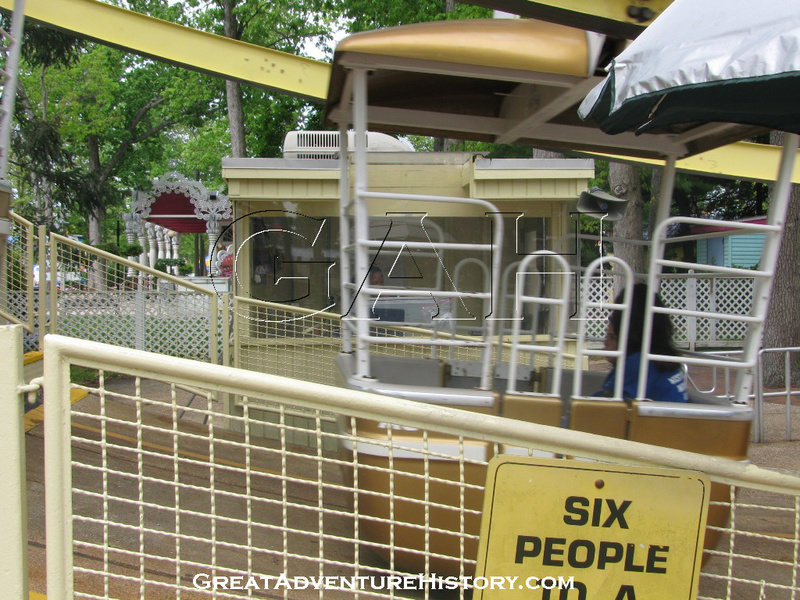 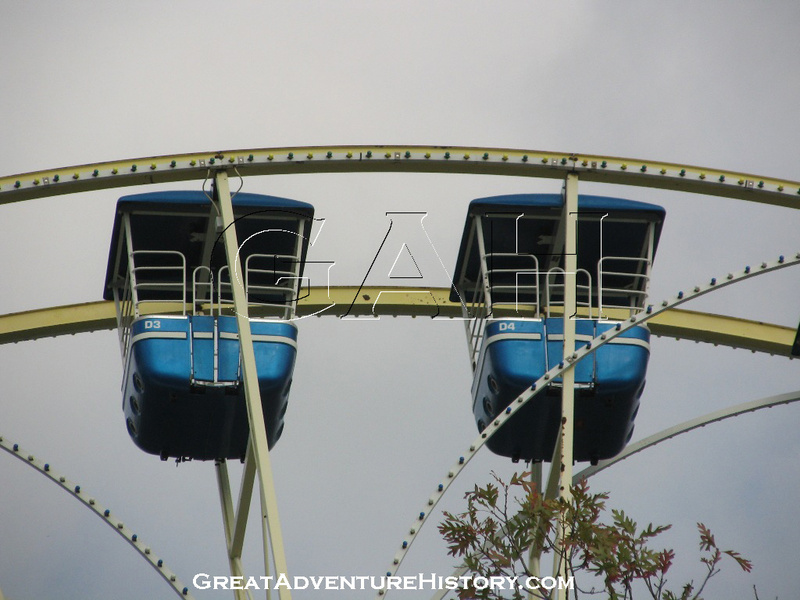 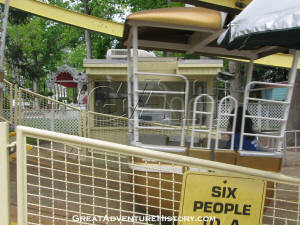 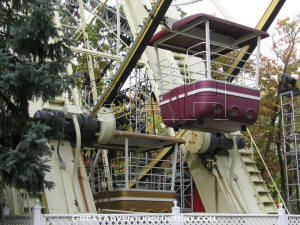 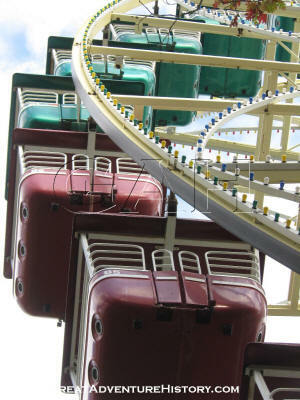 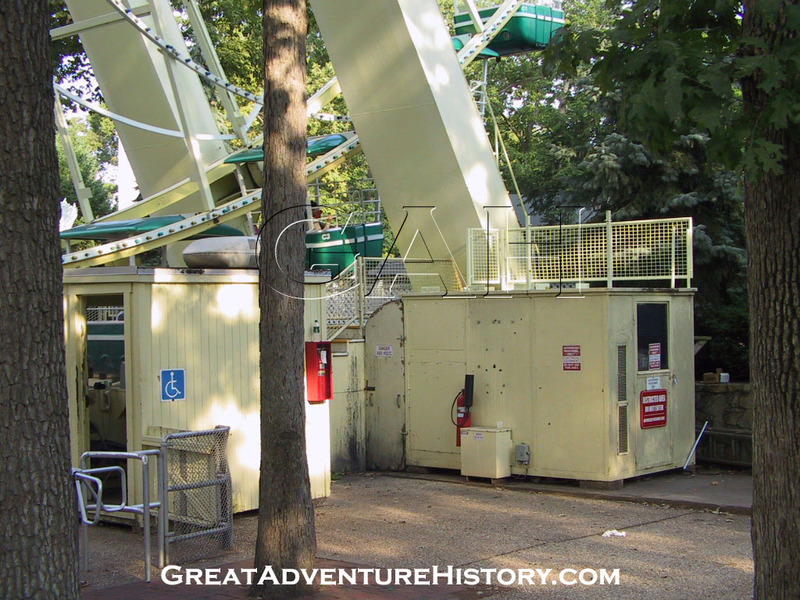 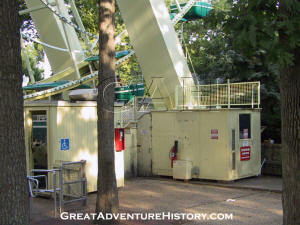 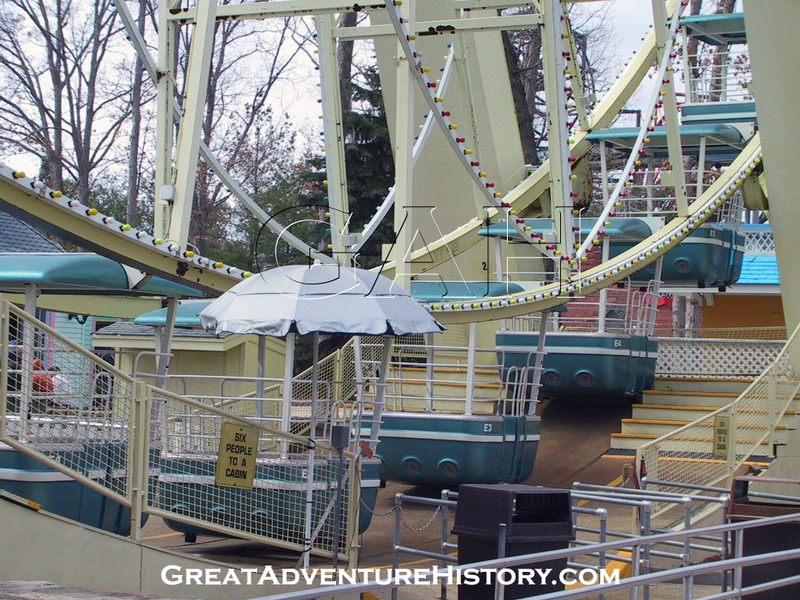 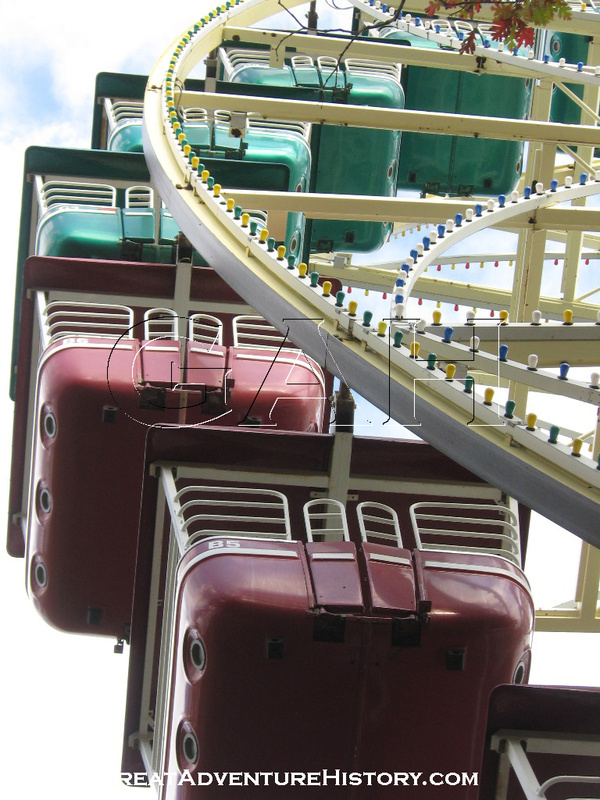 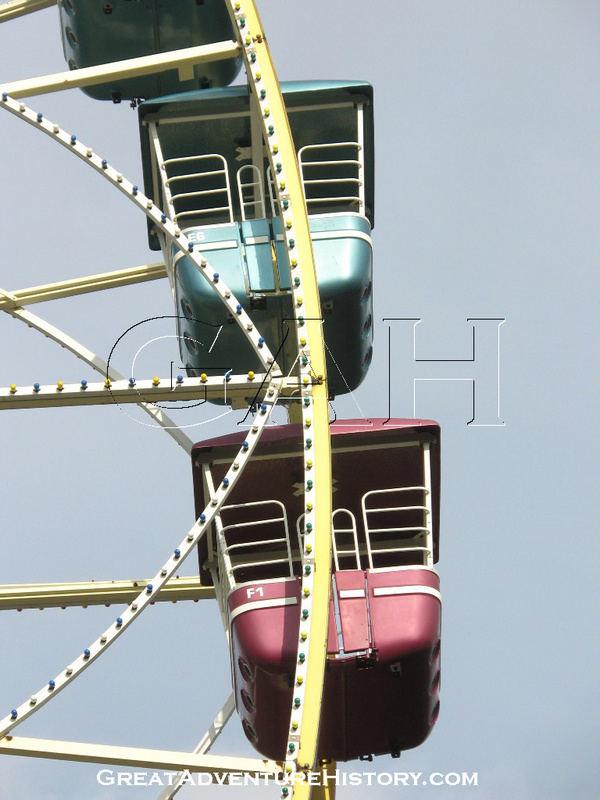 The paint scheme on the structure and the the cars has been updated, and eventually the ride operator's booth was moved from its perch atop the control room to a ground position for the safety of the employees, eliminating the need to climb a ladder. 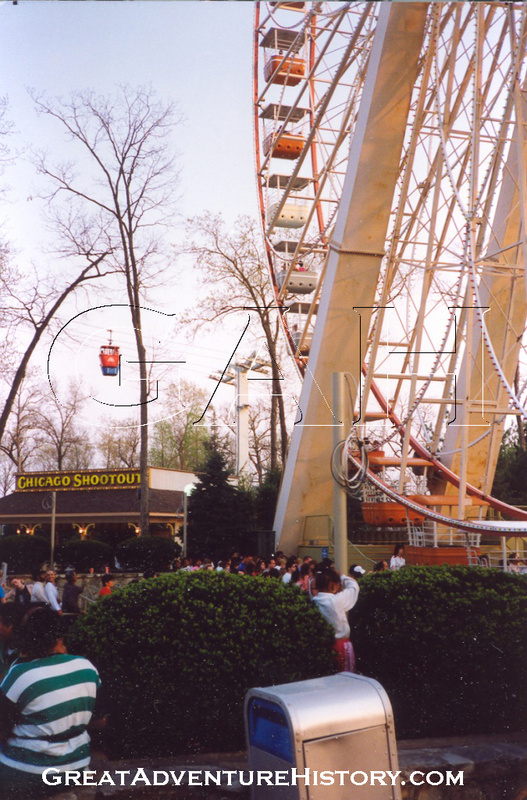 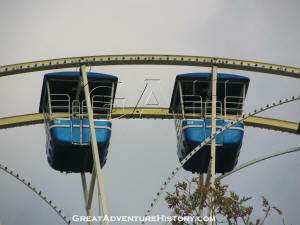 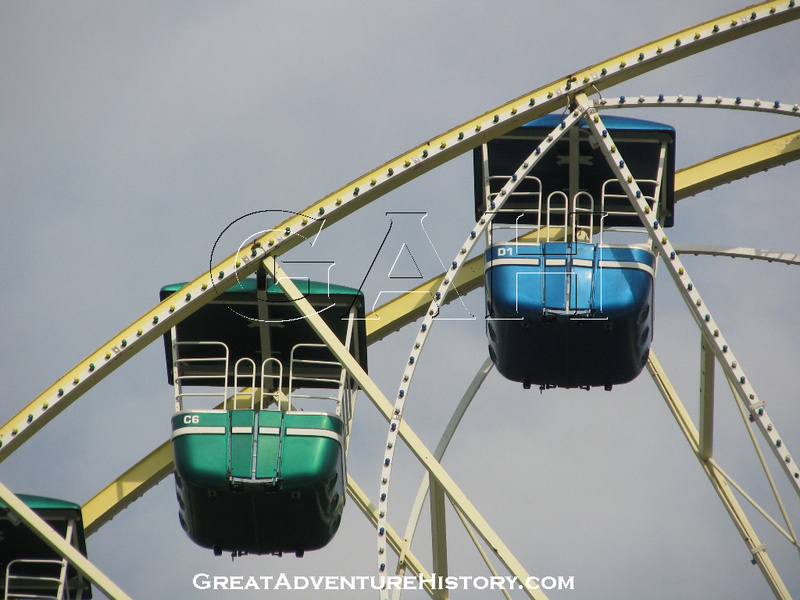 Some of the other changes to the Big Wheel over time included removal of the electrical pick-ups on the cars (seen to the left) which powered the lights on and inside the cars. 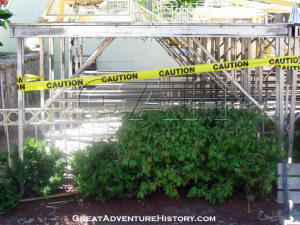 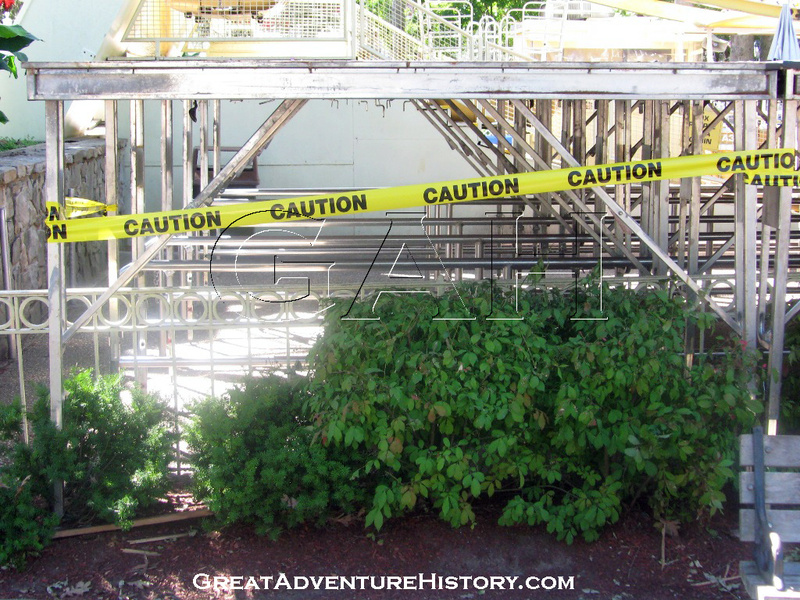 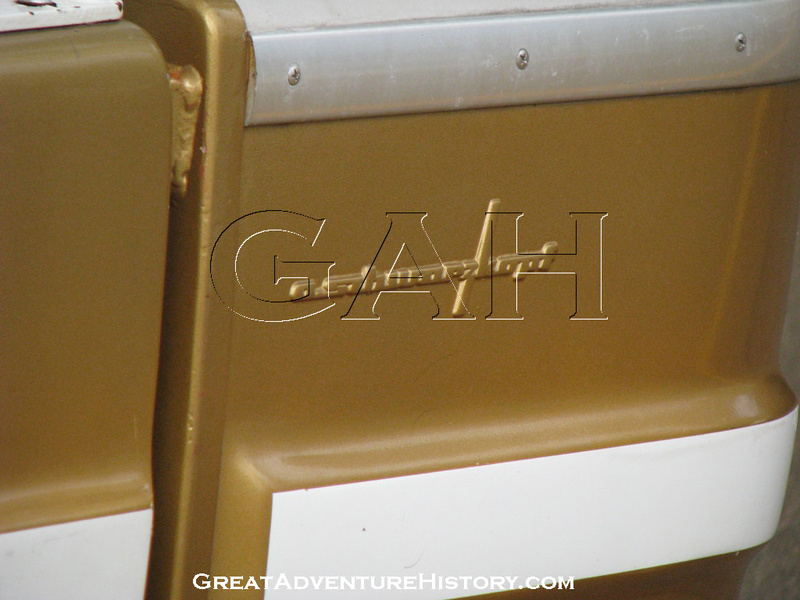 Locking doors and additional safety bars were added to the cars in 1988 as part of the park's general safety improvements. 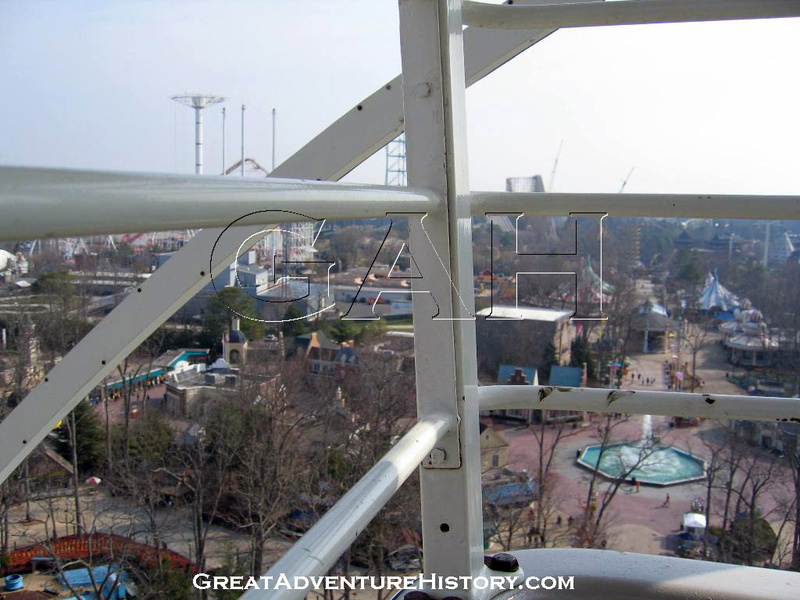 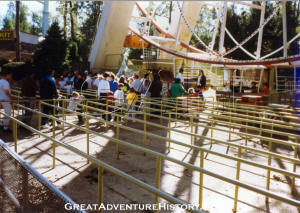 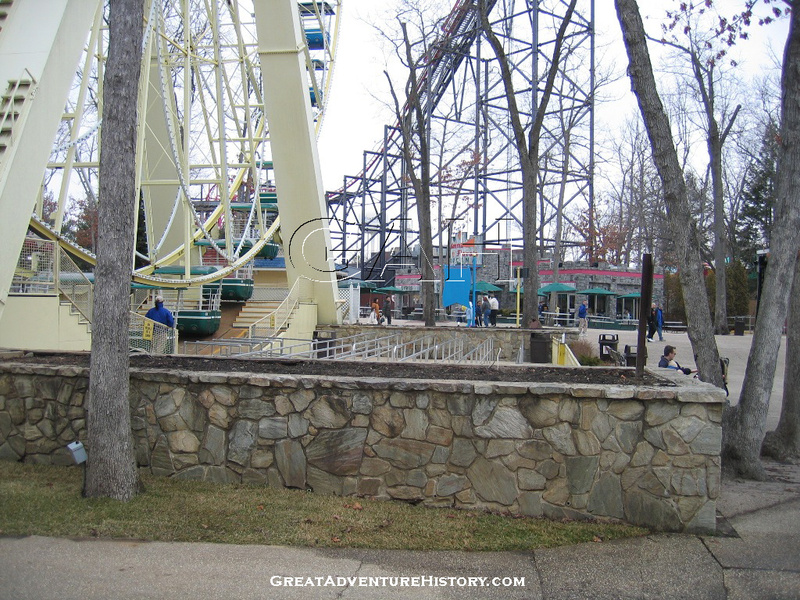 The steel queue bars (to the right) were also replaced with aluminum railings which no longer required paint which would quickly wear out or get dirty with time. 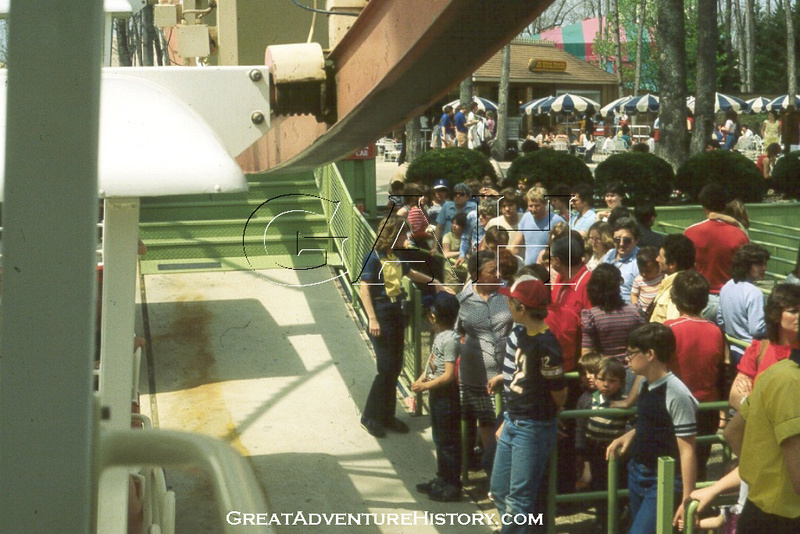 When upgraded, the queue line configuration was changed from a dual load set up (each line leading to three cars each) to a single queue (one line leading to all six cars). The Big Wheel was one the larger of two adult Ferris Wheels in the park. 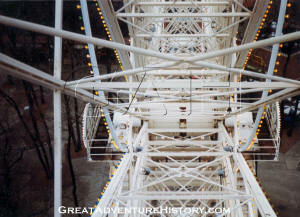 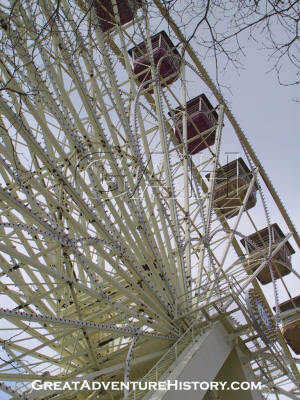 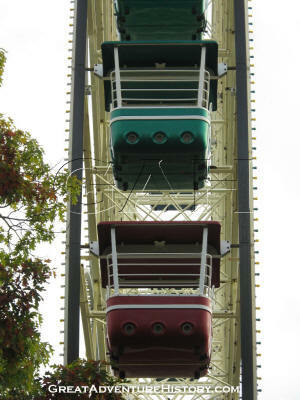 The Little Wheel (seen to the left from the top of the Big Wheel) was added to the Fun Fair section of the park in 1975. 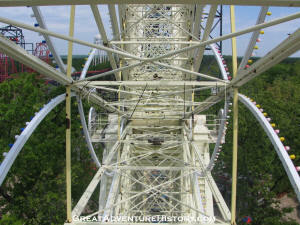 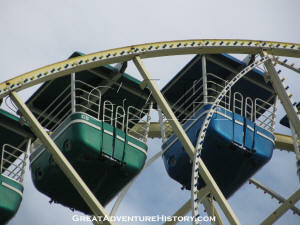 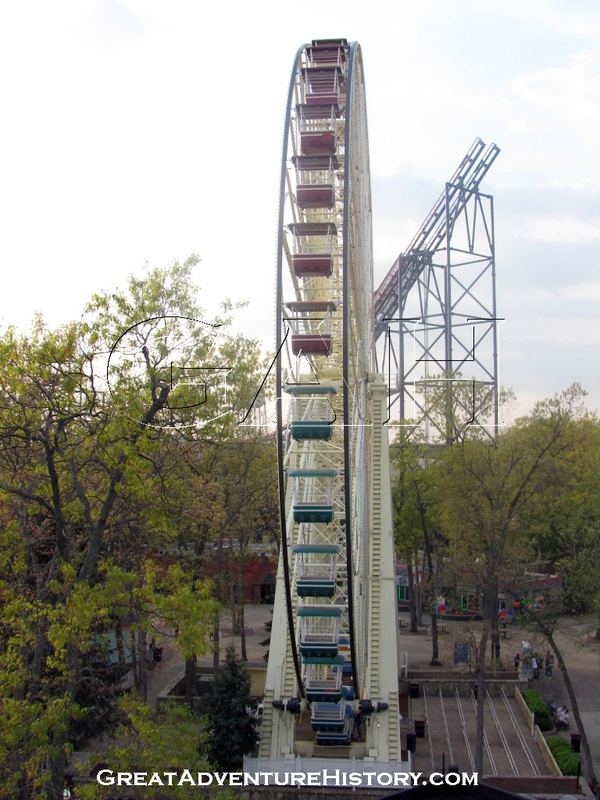 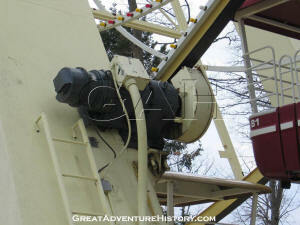 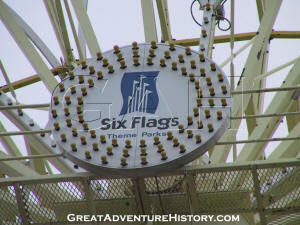 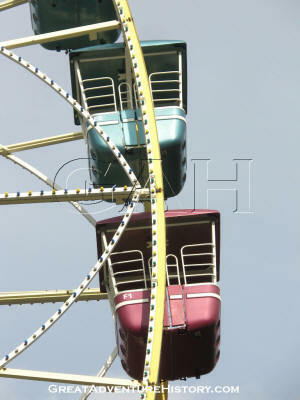 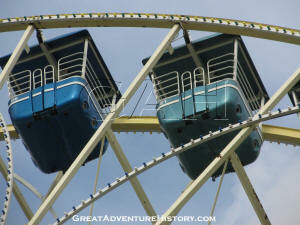 Also known as the Panorama Wheel, it was added to reduce the long wait times of the popular Giant Wheel. 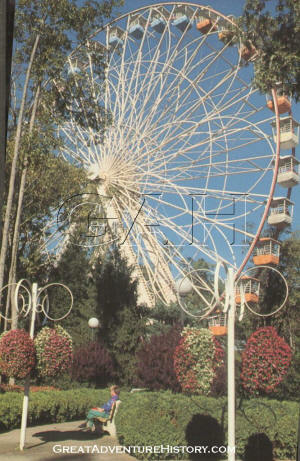 It was much smaller but was originally outfitted with the matching floral lighting design as the Big Wheel, which complemented the small flower shaped cars. 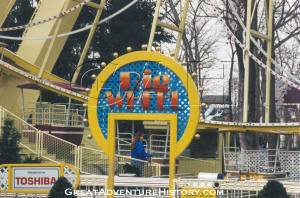 Something which had long been missing from the Big Wheel was a sign that actually gave the ride's name. 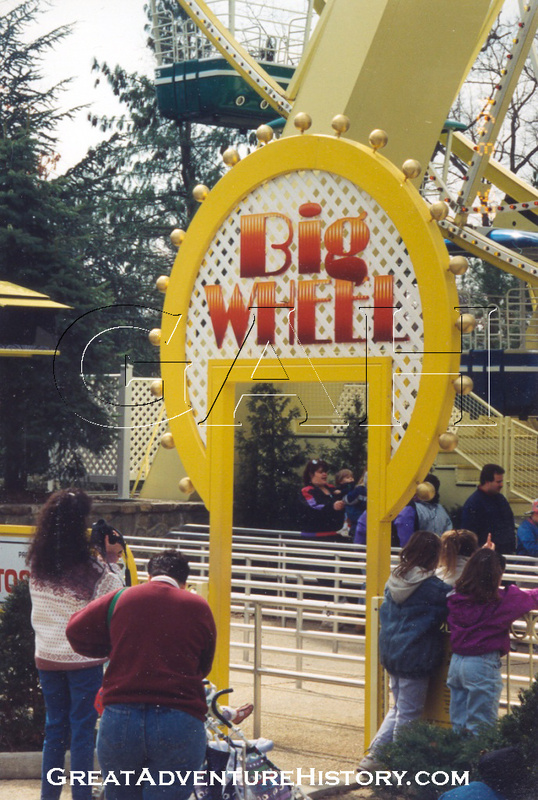 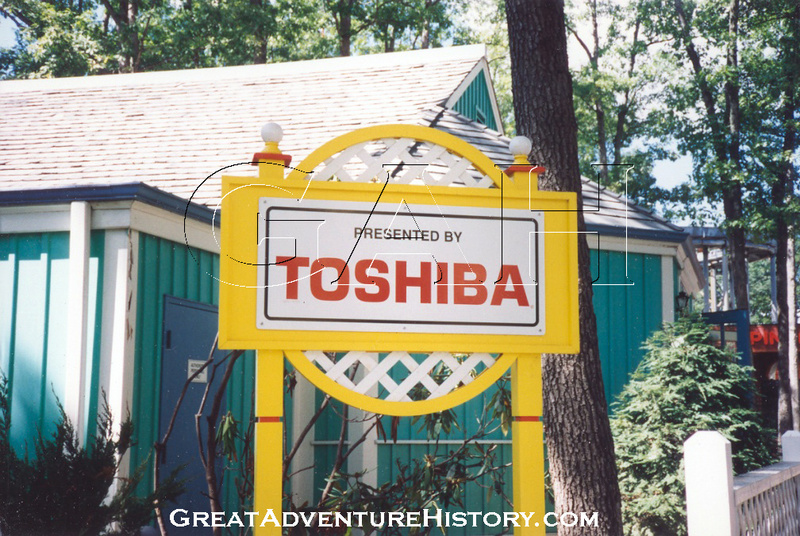 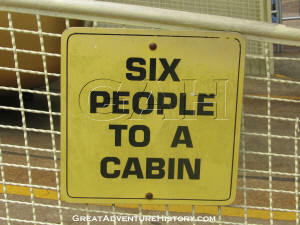 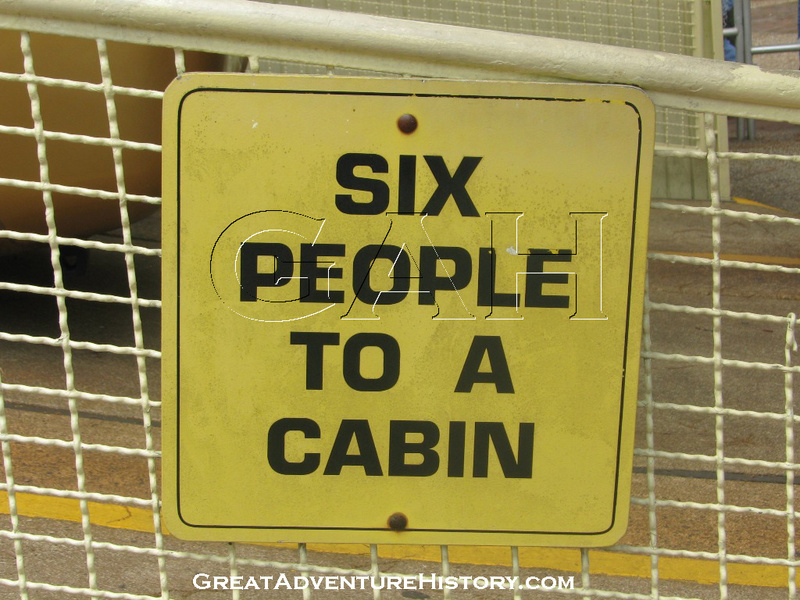 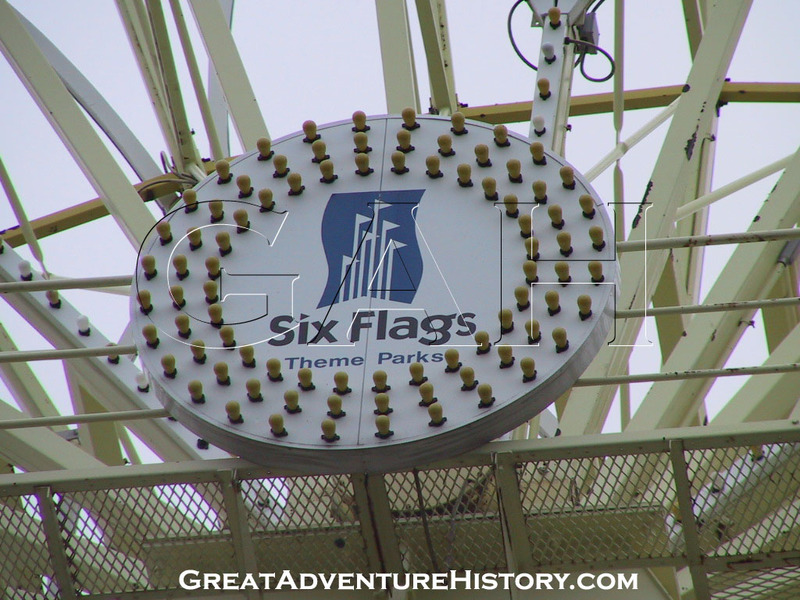 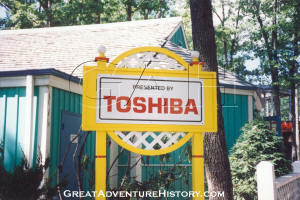 In the 1990's under Time Warner's ownership of Six Flags a sign was added to the ride entrance as it officially became part of the Fantasy Forest section of the park. 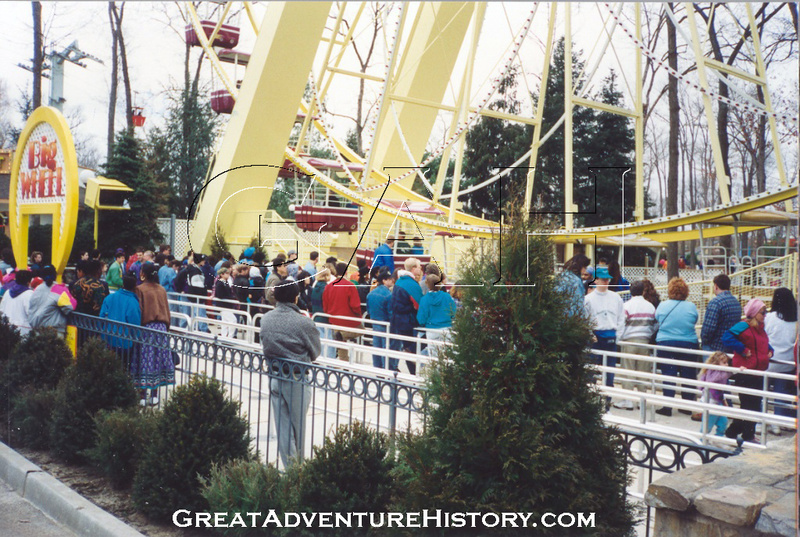 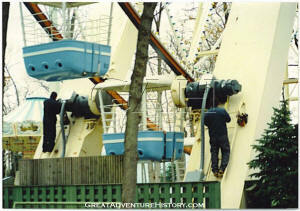 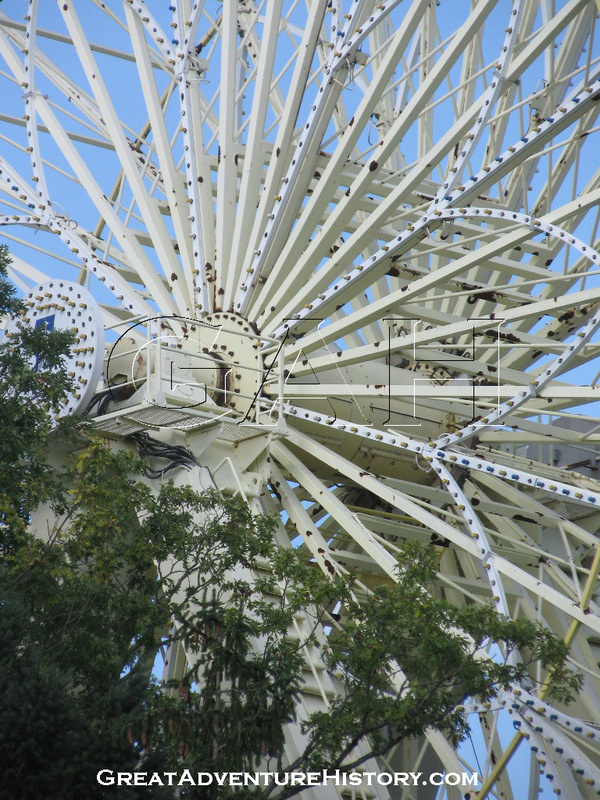 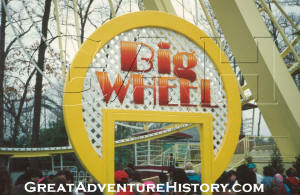 The Big Wheel was completely disassembled (down to just the four support legs) for a total refurbishment during 1993/94 off-season, getting a fresh coat of paint all over. 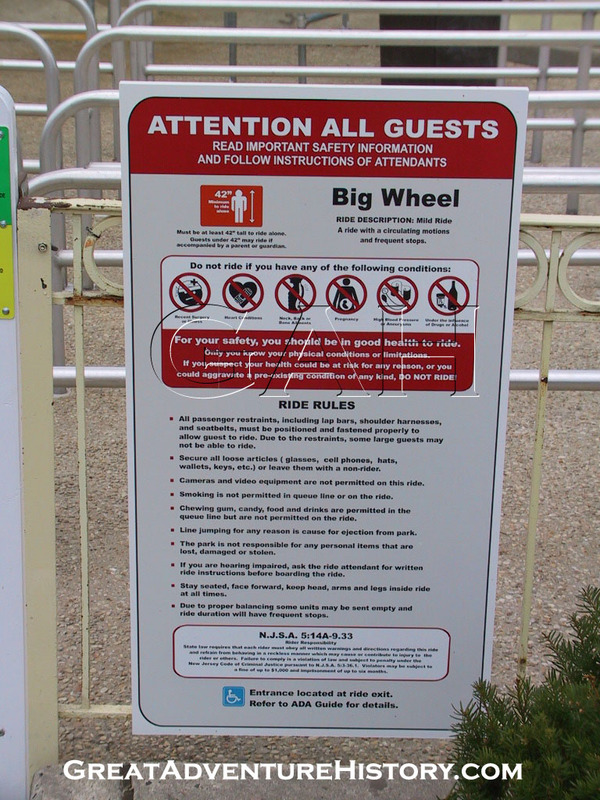 The Big Wheel has had several sponsors over the years with sponsor signs for Toshiba and Sherwin Williams added to the ride exit and entrance. 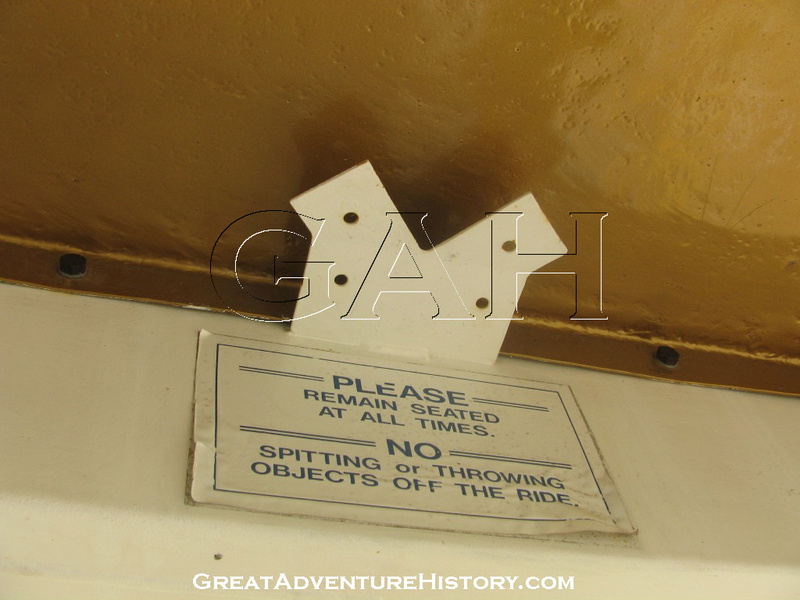 For a time the ride queue also featured television screens which played Looney Tunes cartoons along with promos for park attractions and commercials. 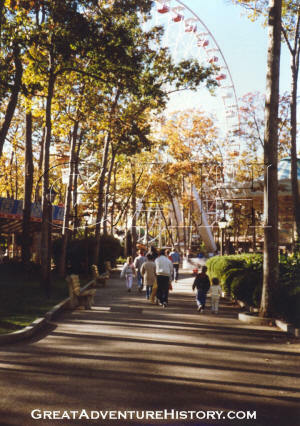 The TV screens were added to queues throughout the park, and parks throughout the Six Flags chain. 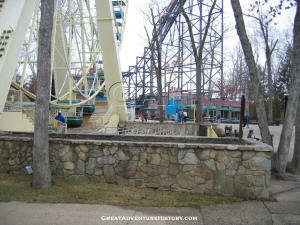 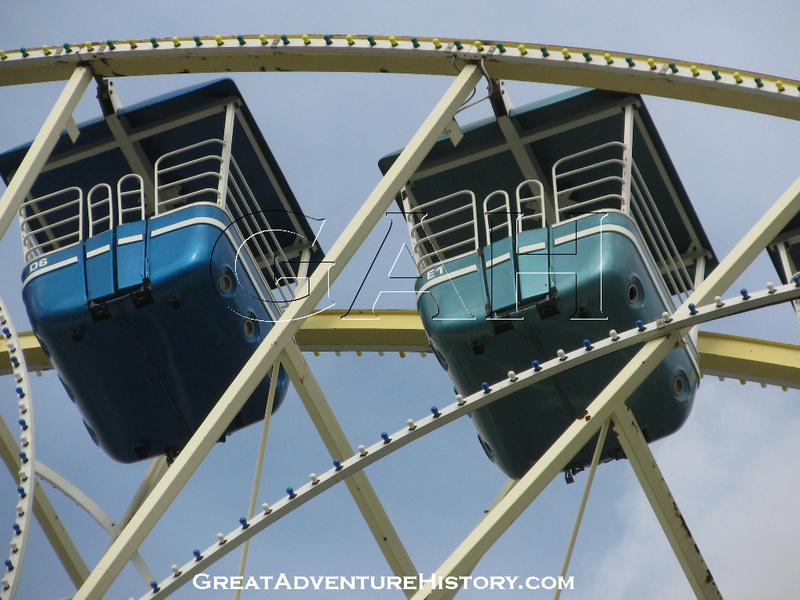 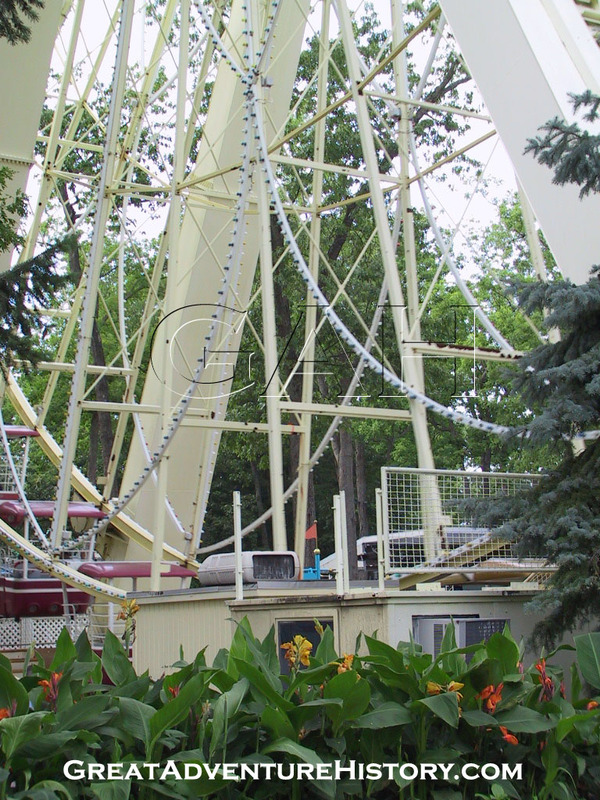 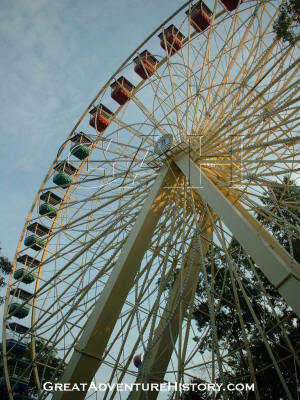 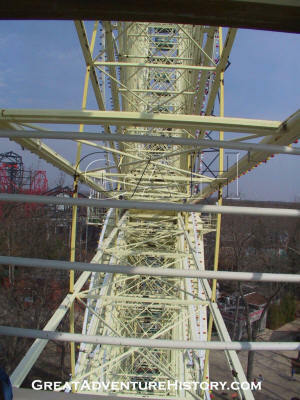 The Big Wheel has remained one of the most popular attractions in the park, with few changes happening over time. 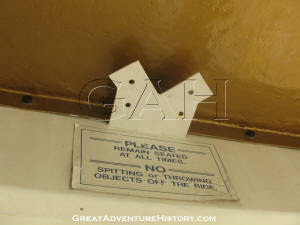 Though the lighting was removed from inside the cars, the brackets can still be seen (to the right) on the ceilings. 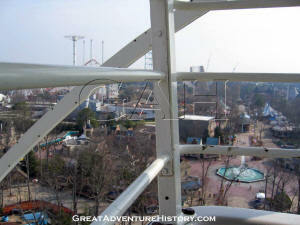 The logos on the the central hub have changed with the park and company's logo changes over time. 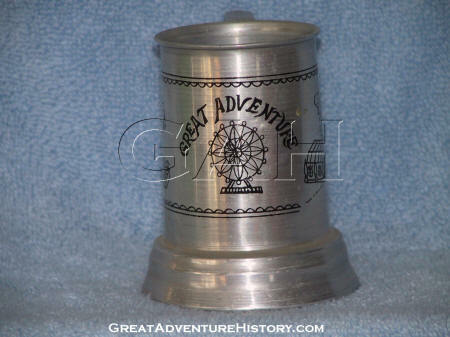 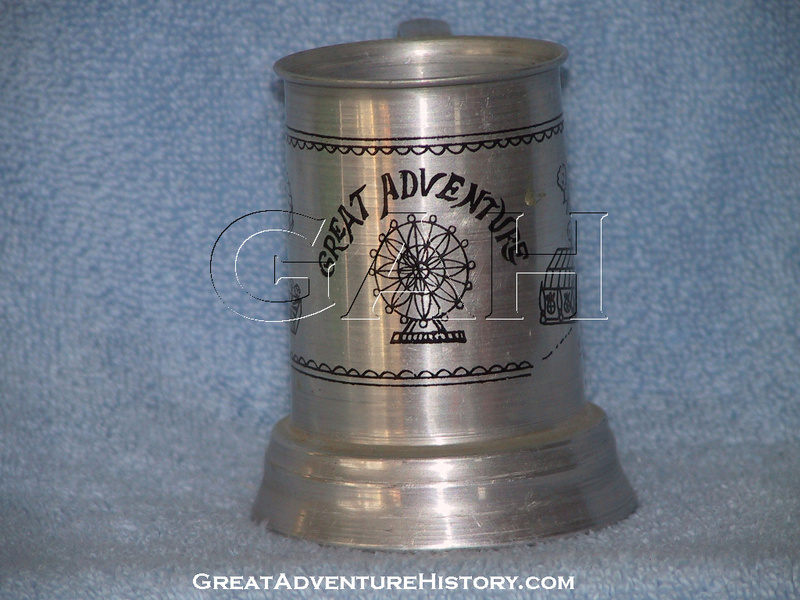 GreatAdventureHistory.com extras, so sign up today! 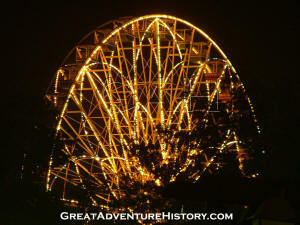 Day or night, the Big Wheel has been one of the most photographed attractions in the park. 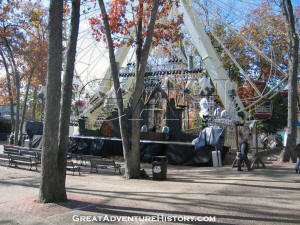 Its location at the far end of Dream Street naturally draws the eye. Its delicate and graceful structure stands high above the tree tops still standing out against the skyline despite the plethora of large roller coasters added to the park over time. At night, the thousands of lights in motion are an incredible sight, with the gentle floral curves lighting up the summer skies. As spectacular the views of the Big Wheel are, the views from the Big Wheel are equally amazing, offering a relaxing view of the park and its canopy of trees in the daytime, and the bright lights of the surrounding attractions after dark. 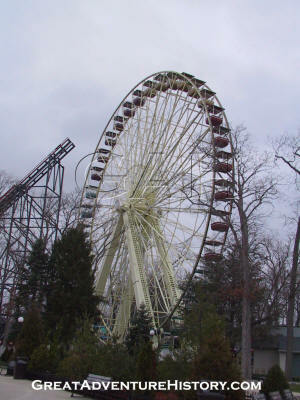 For many seasons since 1989, the Big Wheel has started its off-season before the rest of the park, closing in September as part of the park's Halloween events. 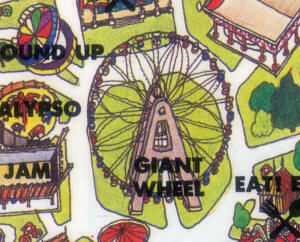 The Big Wheel first served as a backdrop for a giant inflatable King Kong for 1989's Halloweekends. 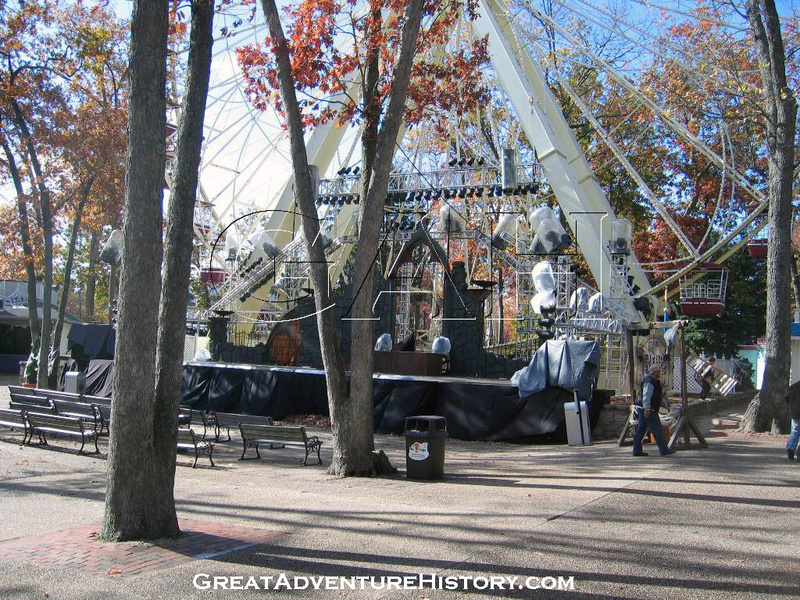 More recently the centerpiece of the park has become center stage for one of the biggest and most popular attractions of Fright Fest, the Dead Man's Party stage show. 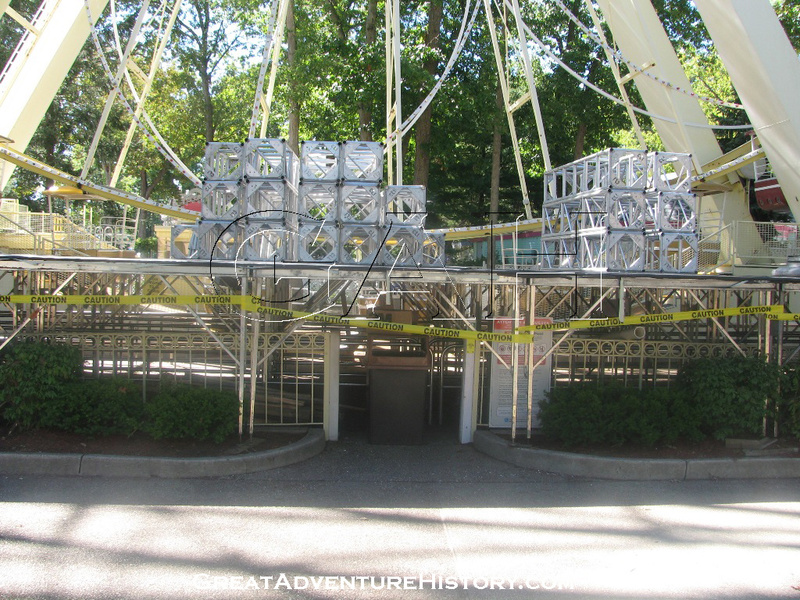 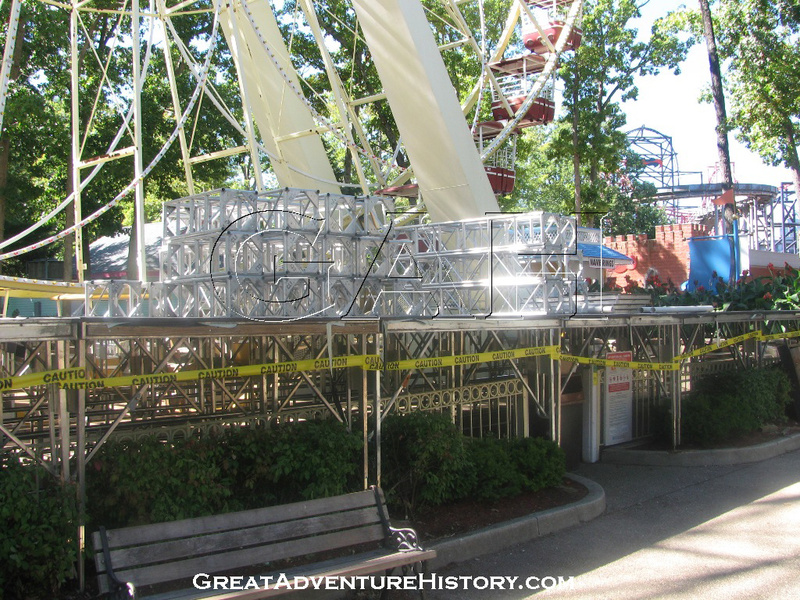 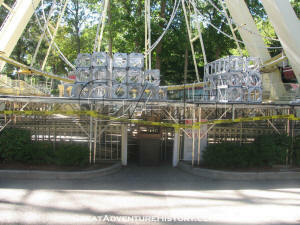 A stage is erected over the Big Wheel's queue line with temporary scaffolding and light rigs framing the set pieces. 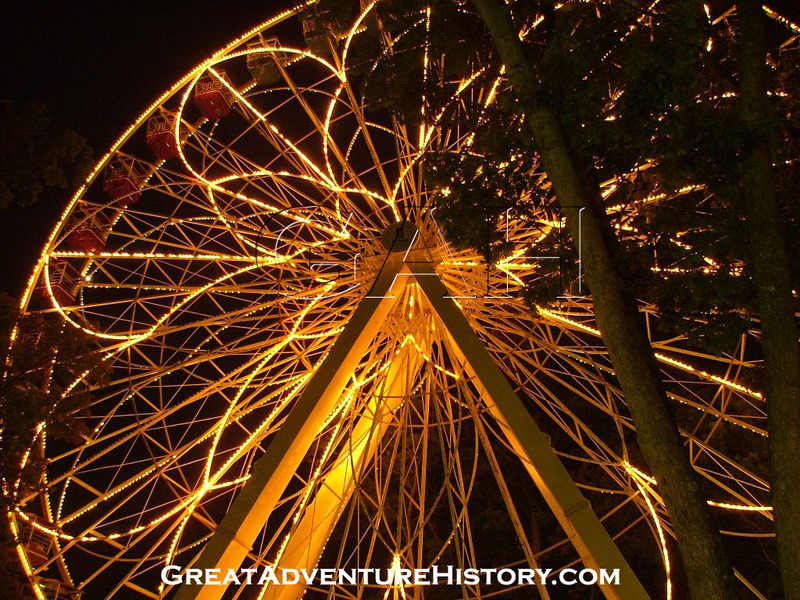 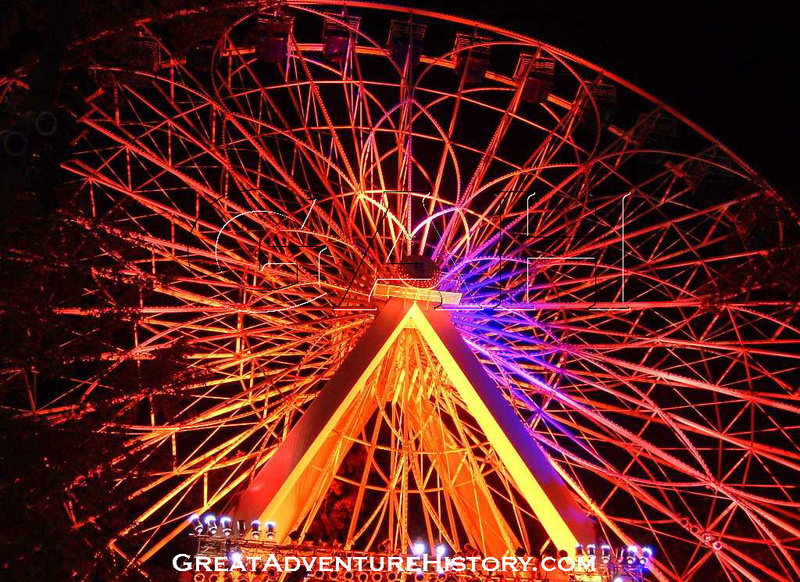 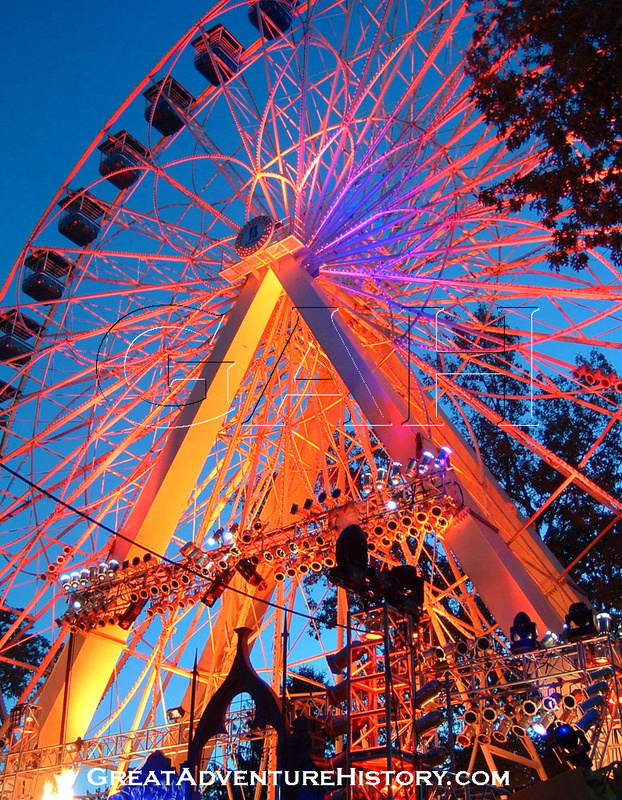 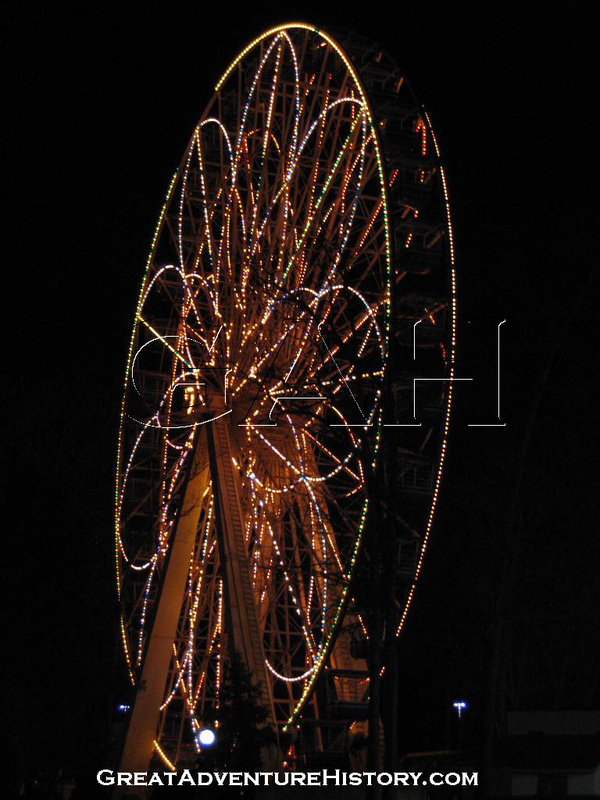 The Big Wheel is illuminated with colorful theatrical lighting and flaming torches as the show plays to the thousands of guests who pack the park for this very popular Halloween event every year.